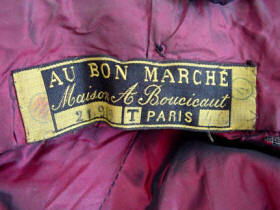 VICTORIAN cape, all hand made and with a tag, "Au Bon Marche, Maison A. Boucicault, Paris". 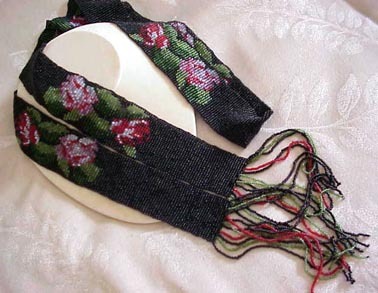 Black satin ties close the cape at the front of a ruffled 4" multi-layered stand-up collar. 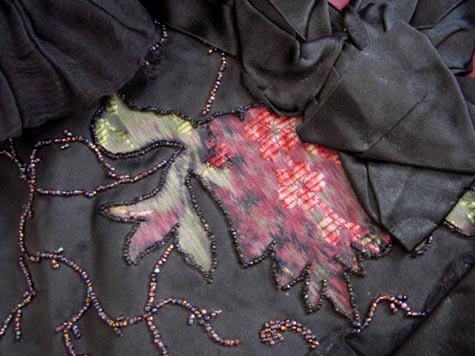 View Appliquéd fabric flowers and bead work decorate this satin lined black crepe 42" circular cape. 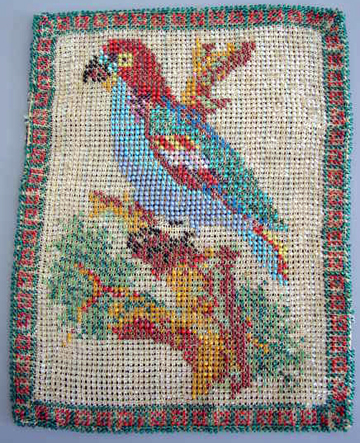 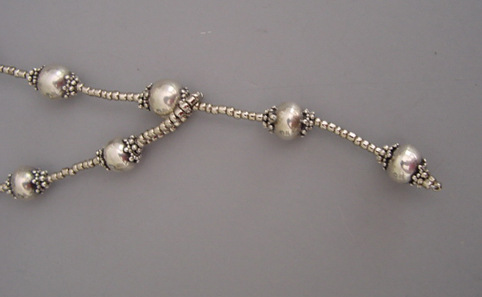 It has a 16" neck and is approximately elbow length. 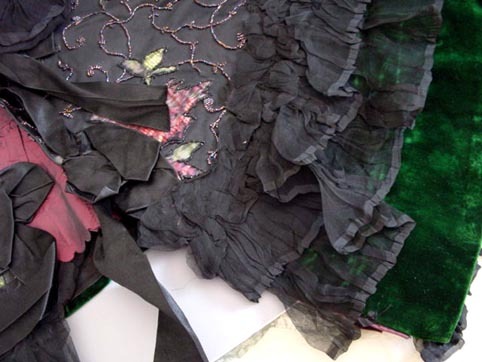 It is deeply edged with green velvet. 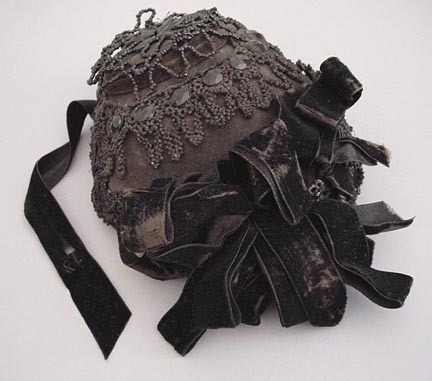 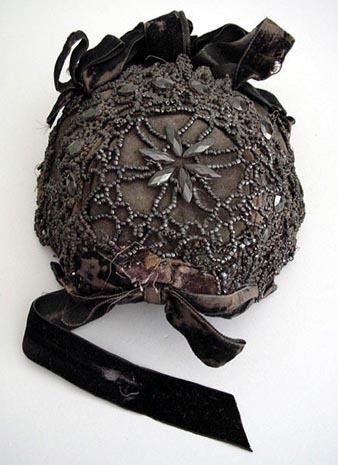 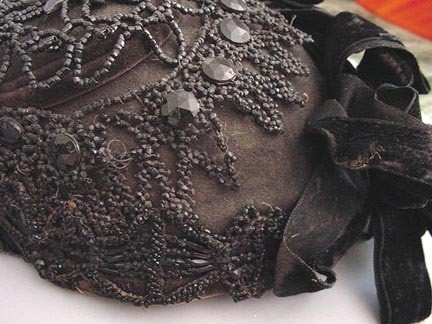 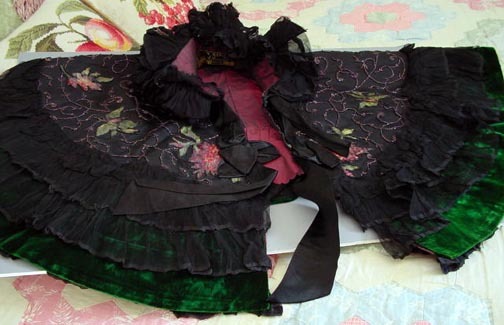 VICTORIAN lady wearing a cape with deep ruffles, intricate beadwork and appliqué and carrying her fan. 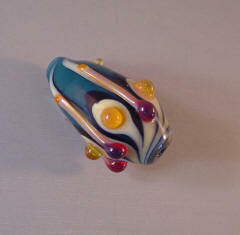 She also wears rings on her fingers and a lovely hat. 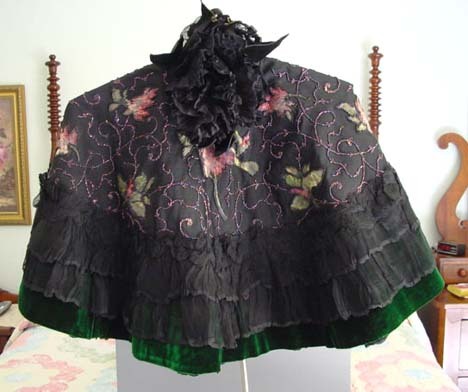 VICTORIAN cape with a triple border of RUFFLES at bottom over green velvet border. 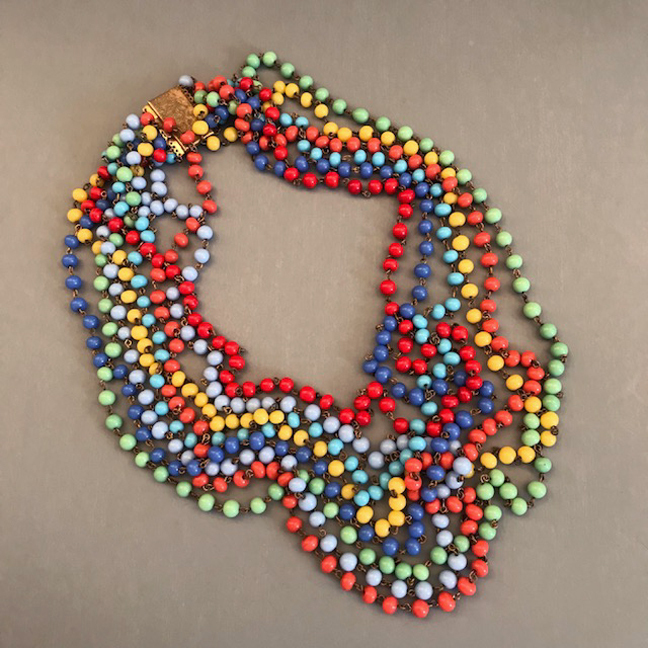 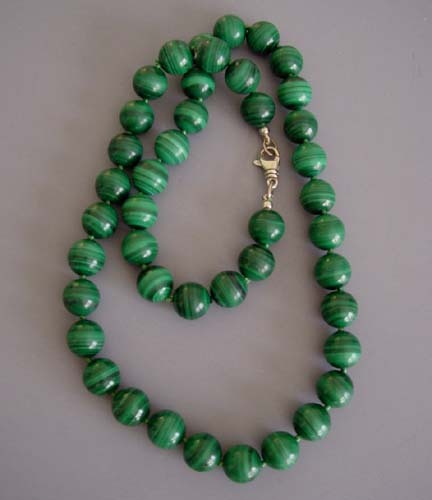 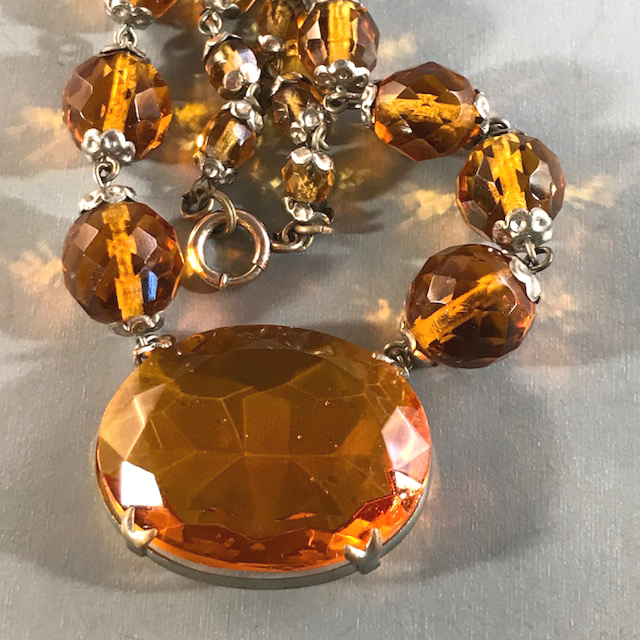 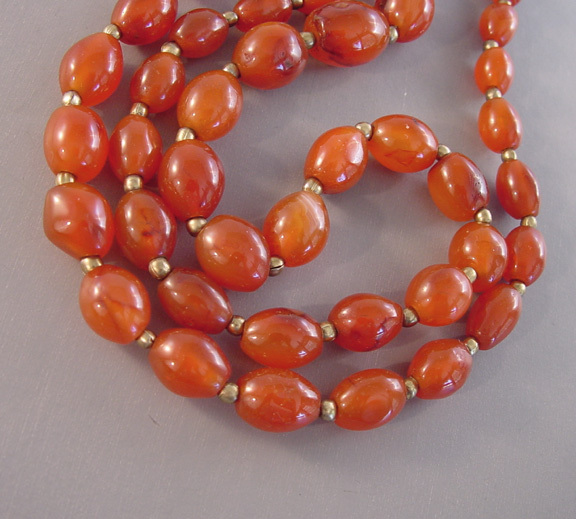 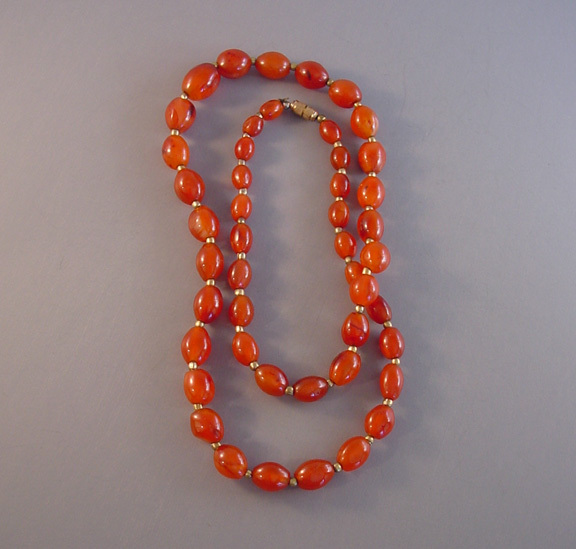 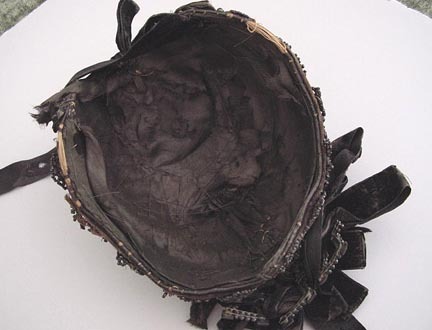 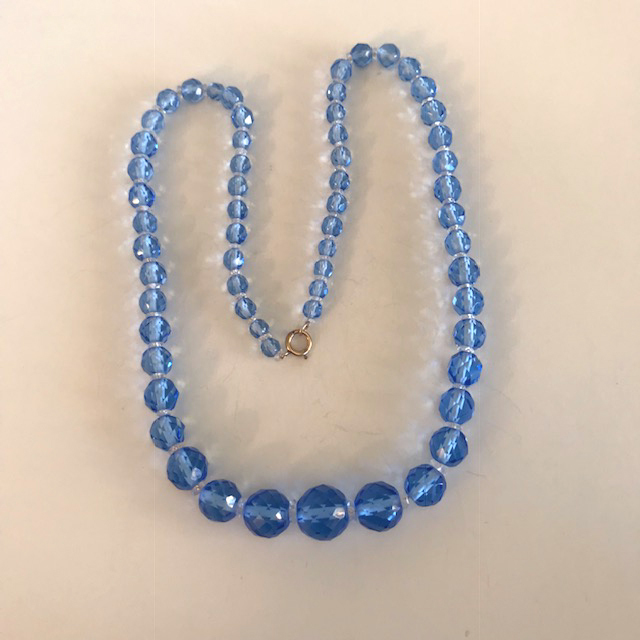 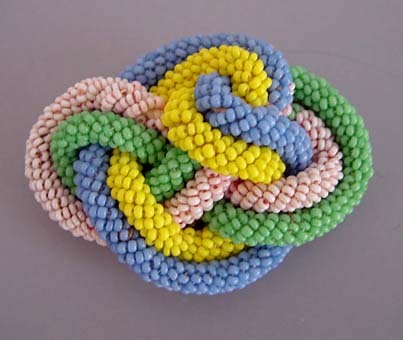 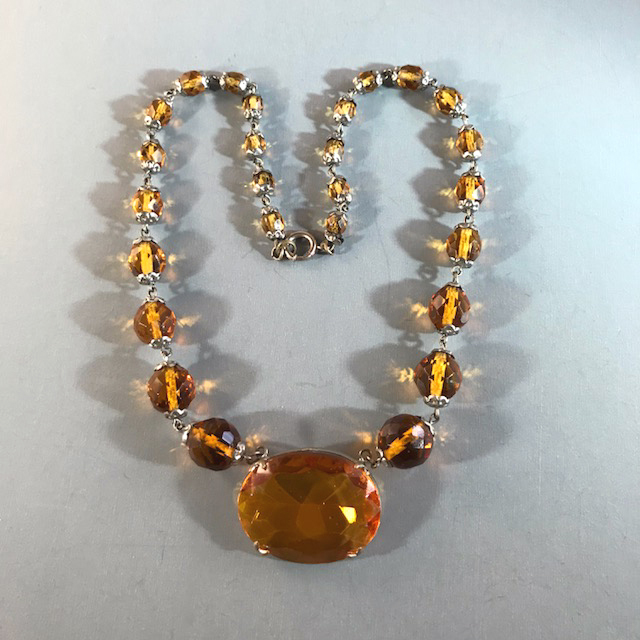 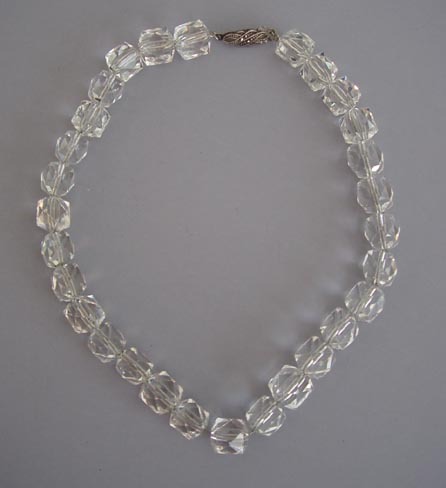 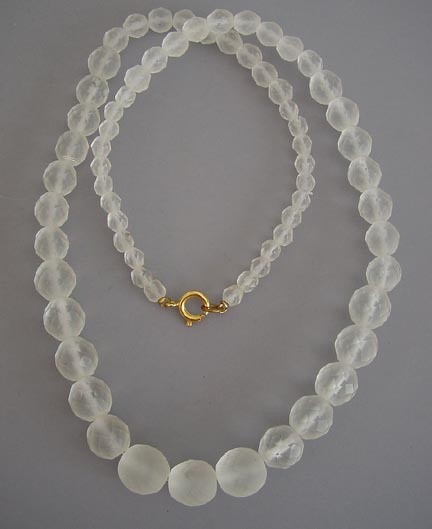 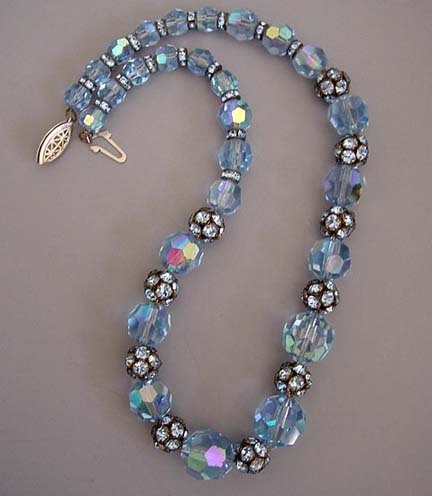 I would estimate this to be a size 8-10, but because it is made as an almost full circle, it would fit a smaller or slightly larger size as well. 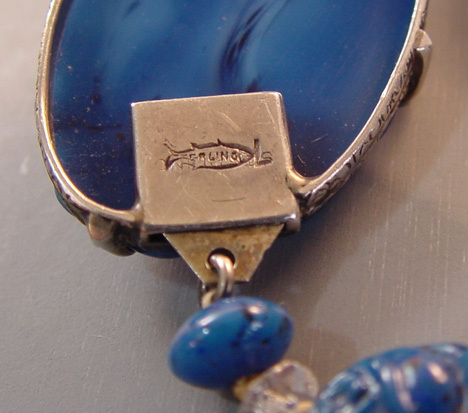 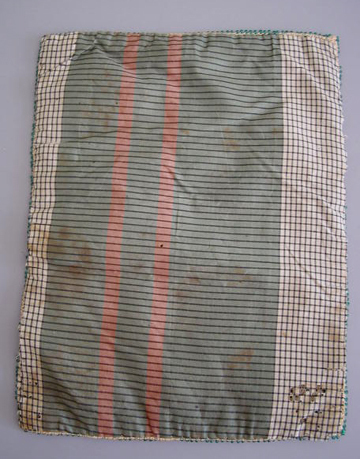 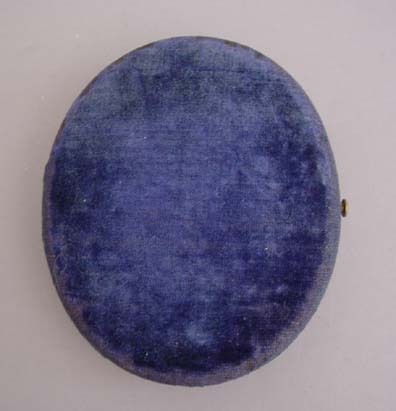 Tag marked, "Au Bon Marche, Maison A. Boucicault, Paris". 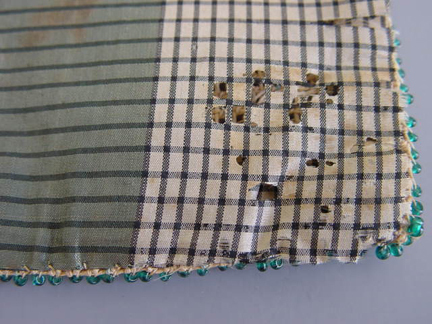 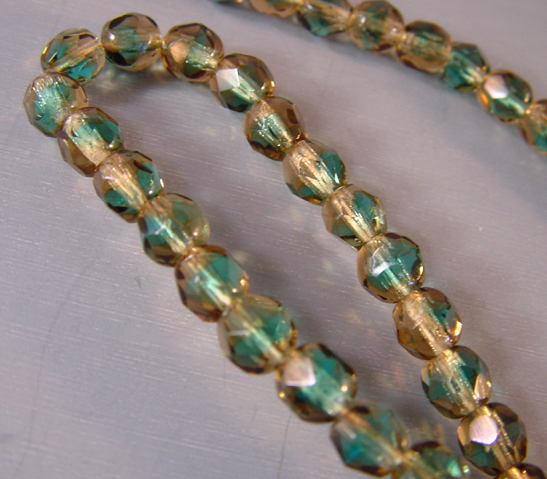 There is a 2-1/2" tear on the inside right at the neckline seam, but no other damage that I can see. 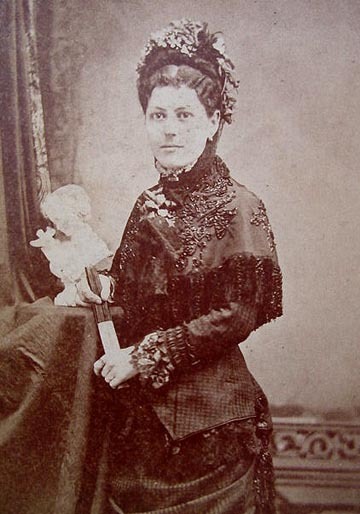 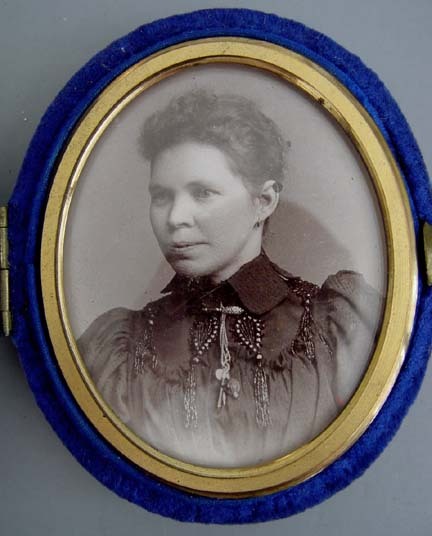 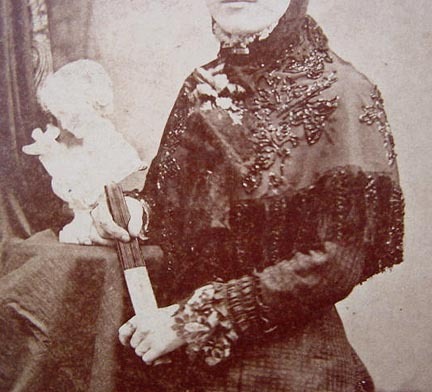 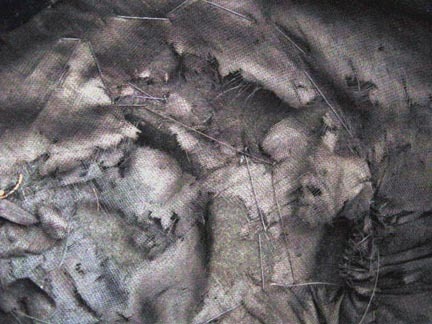 This VICTORIAN lady wears a similar CAPE. 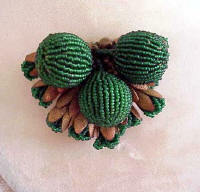 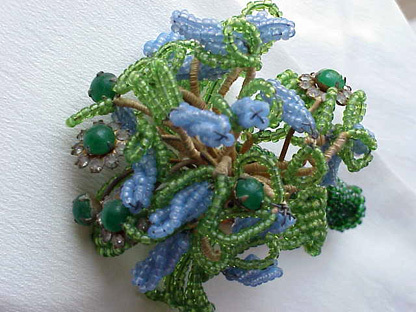 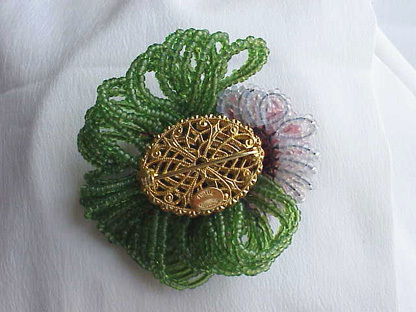 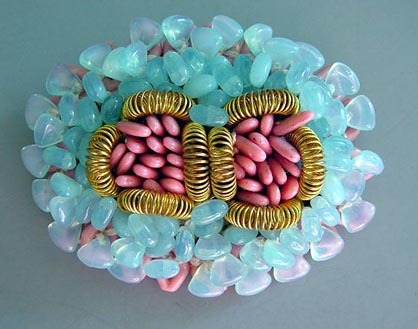 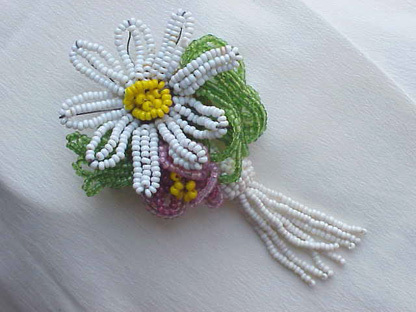 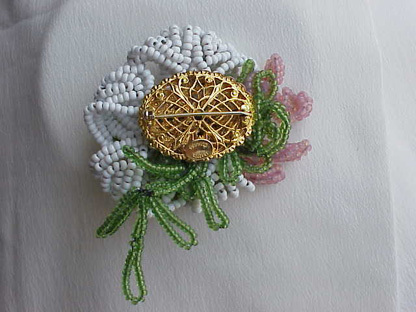 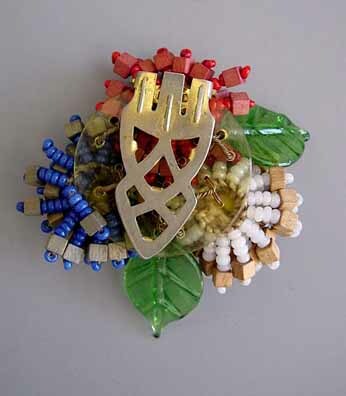 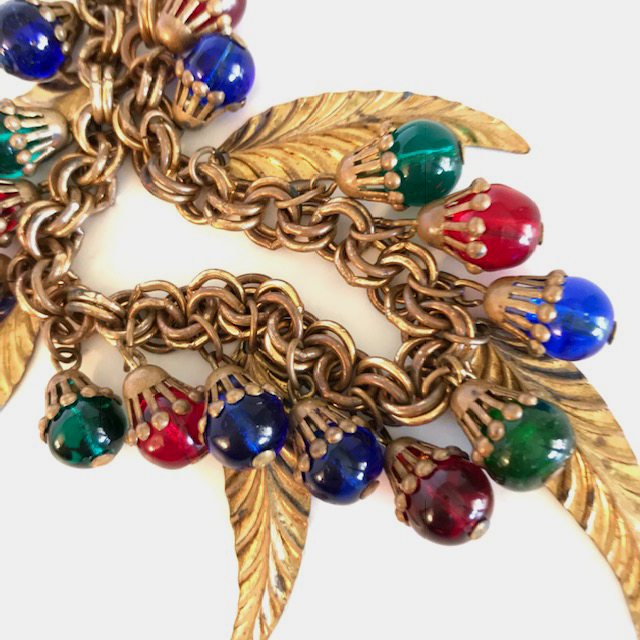 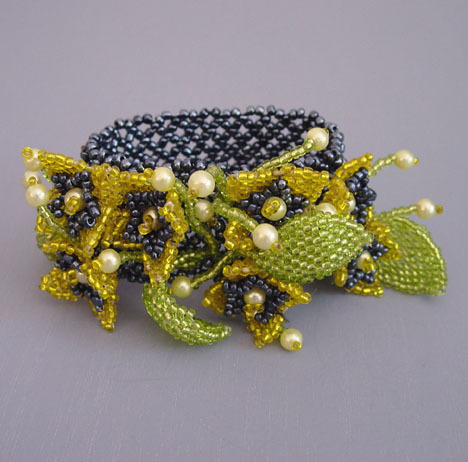 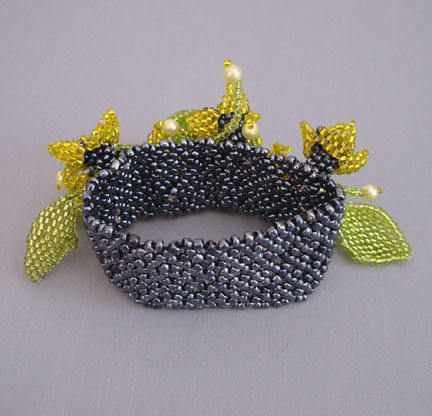 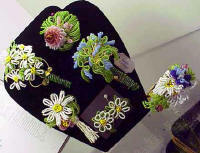 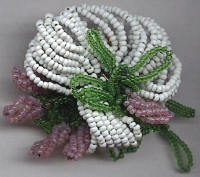 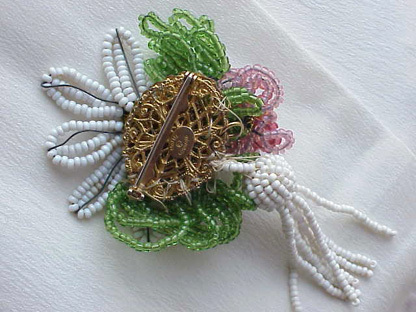 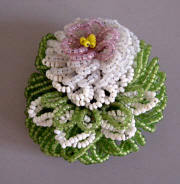 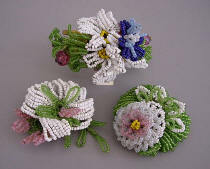 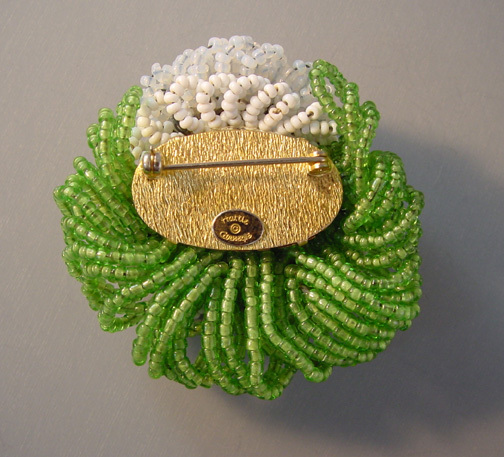 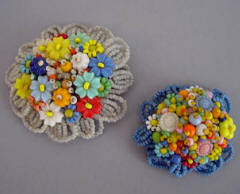 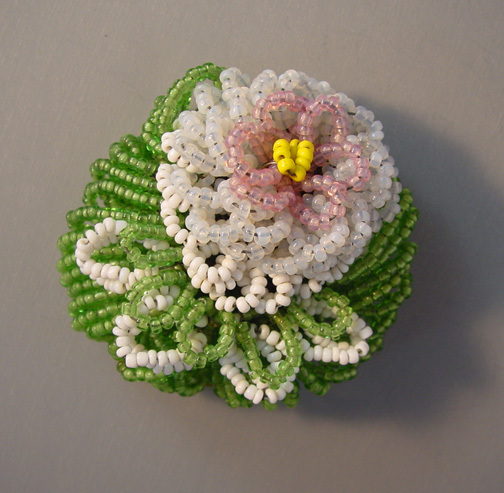 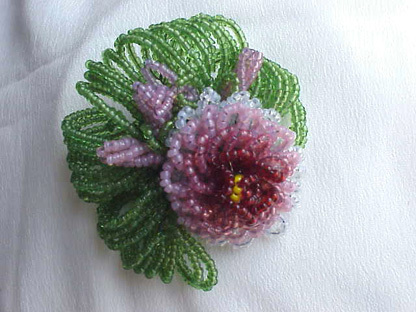 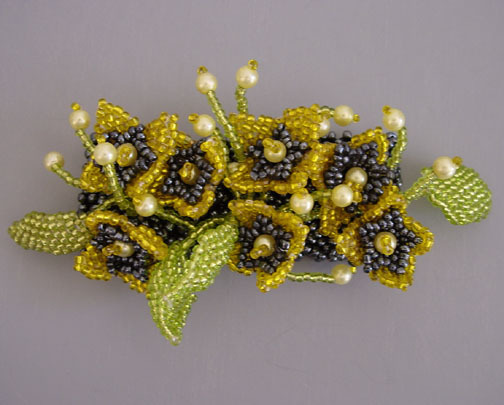 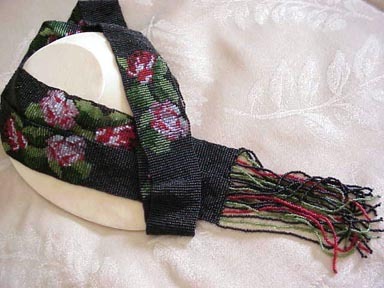 CARNEGIE beaded flower bracelet and brooches. 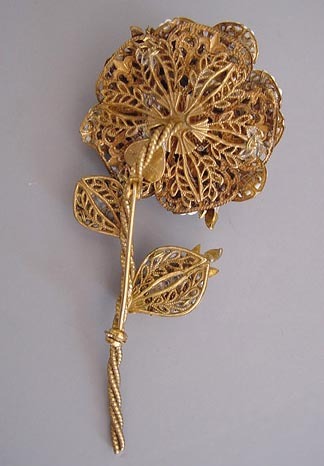 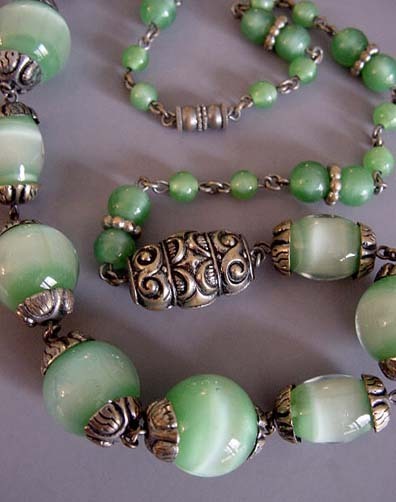 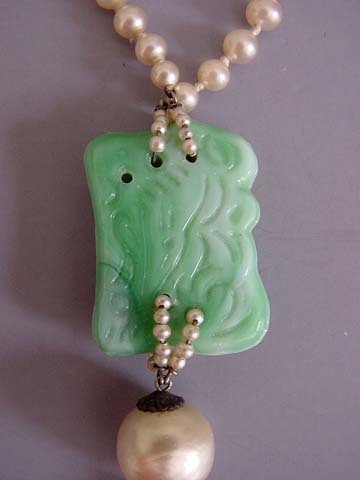 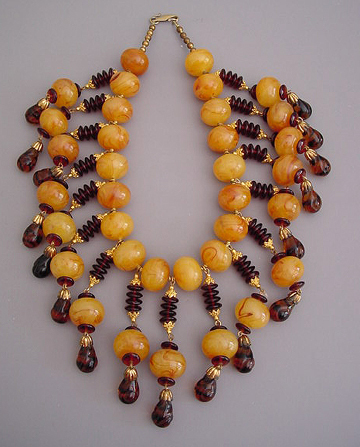 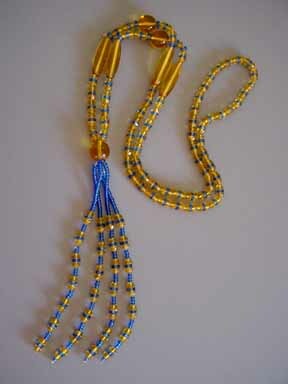 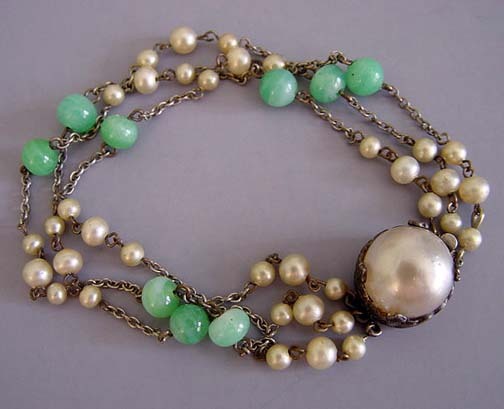 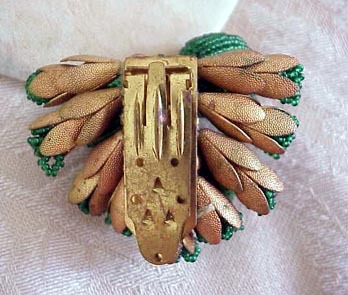 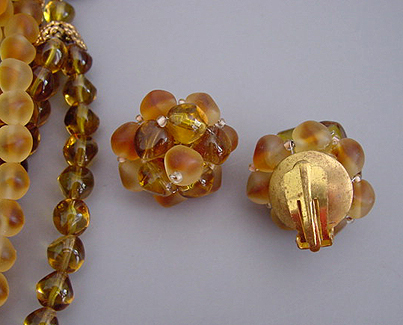 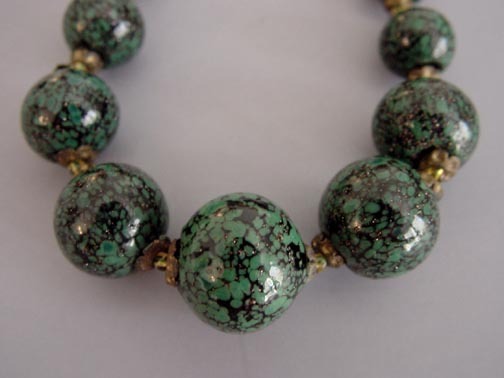 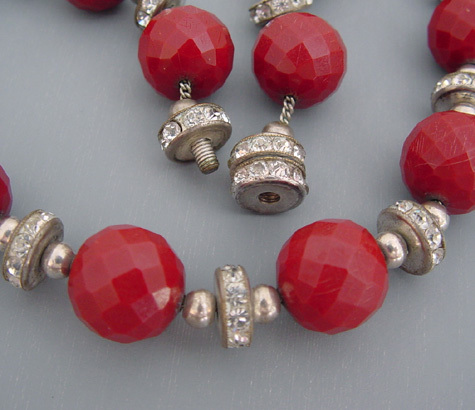 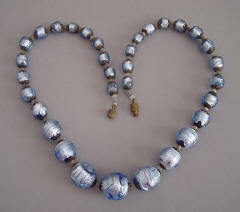 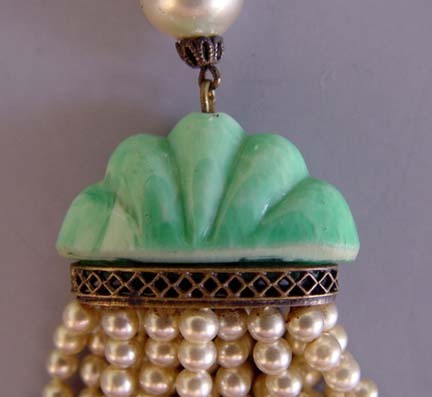 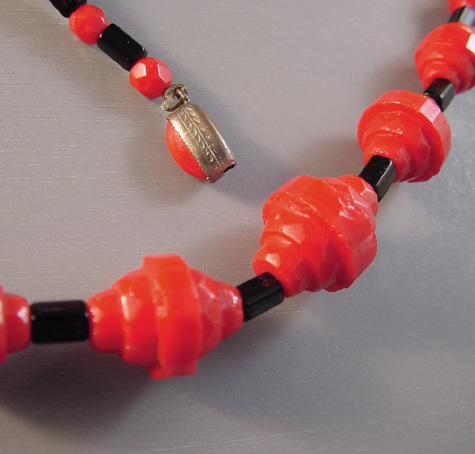 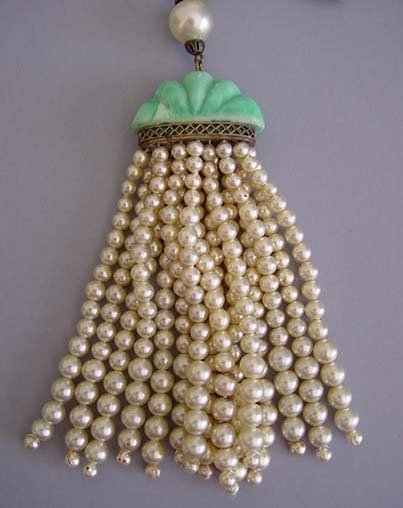 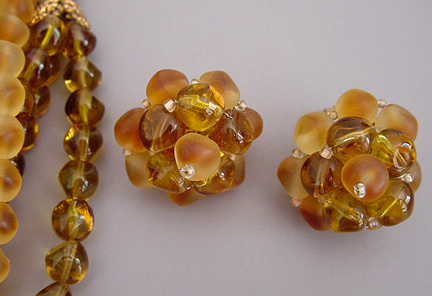 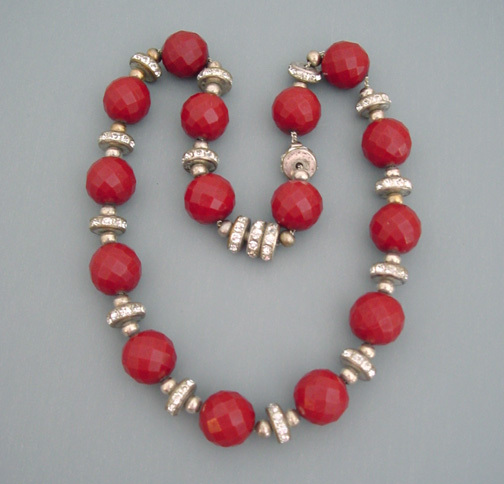 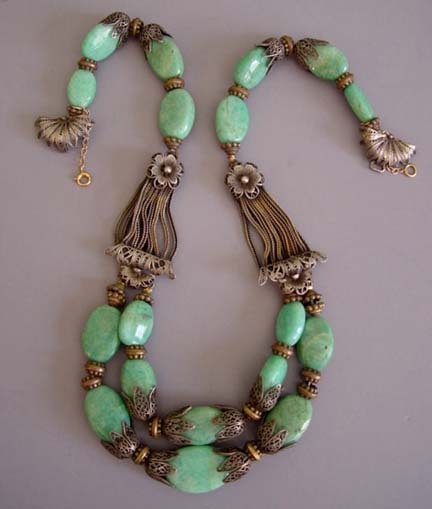 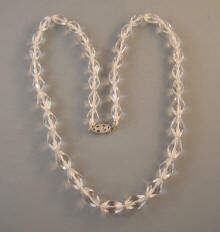 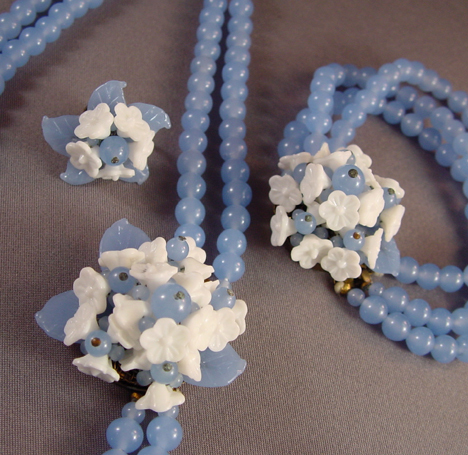 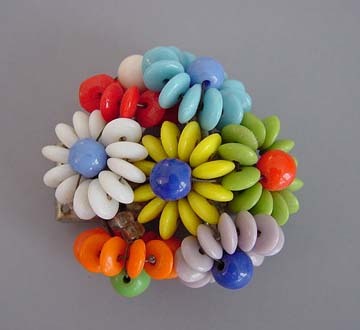 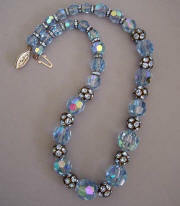 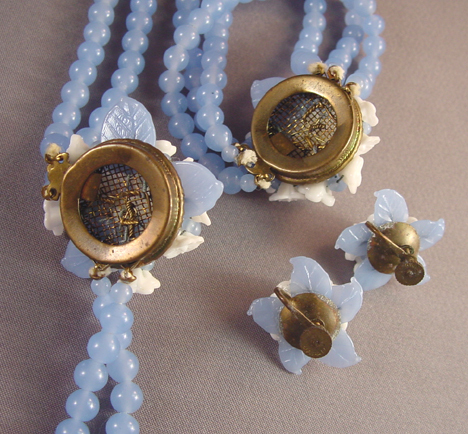 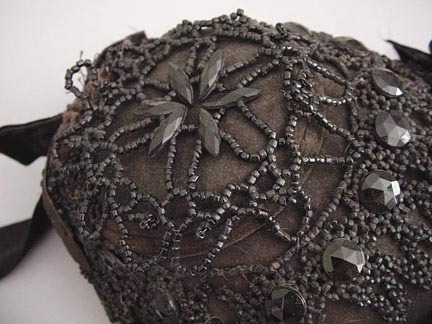 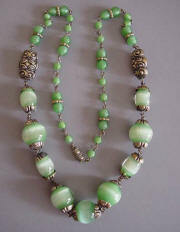 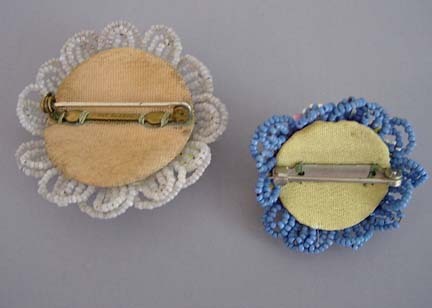 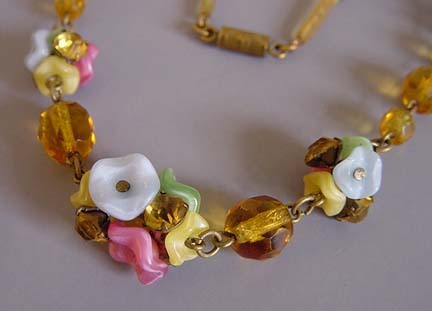 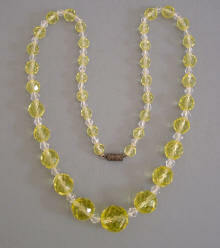 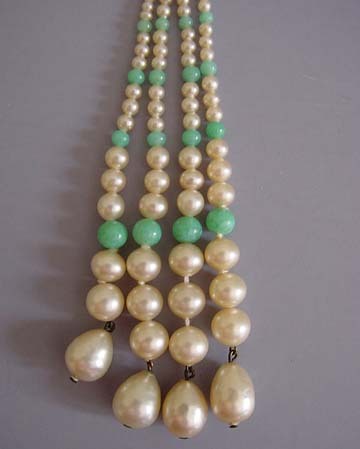 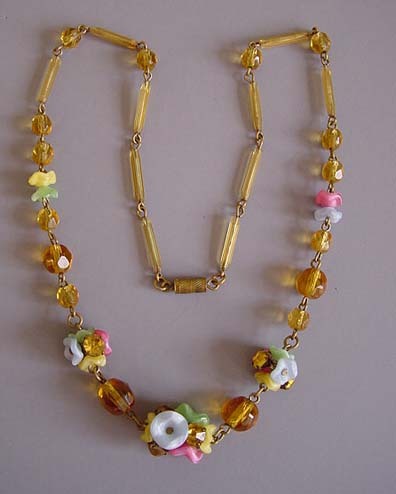 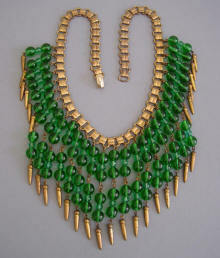 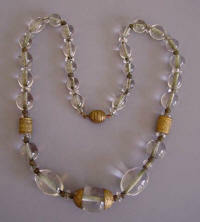 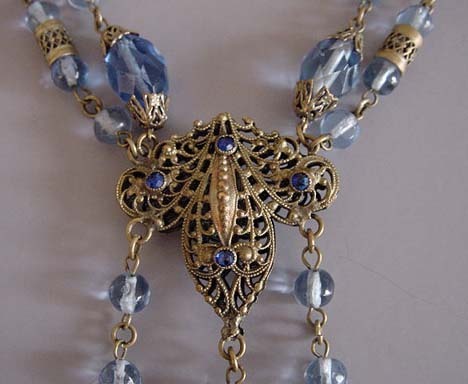 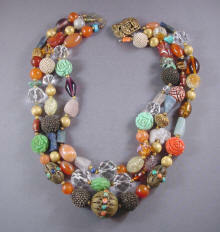 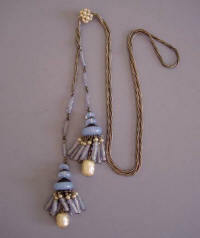 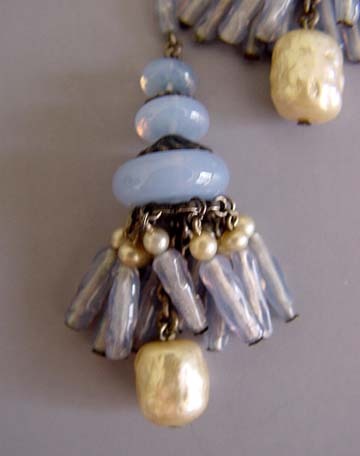 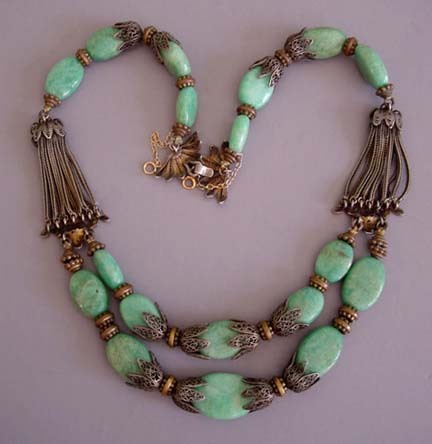 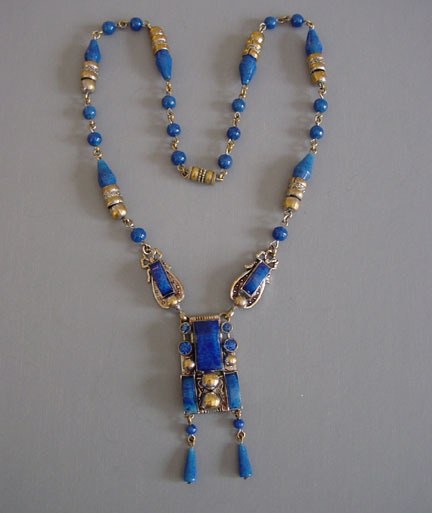 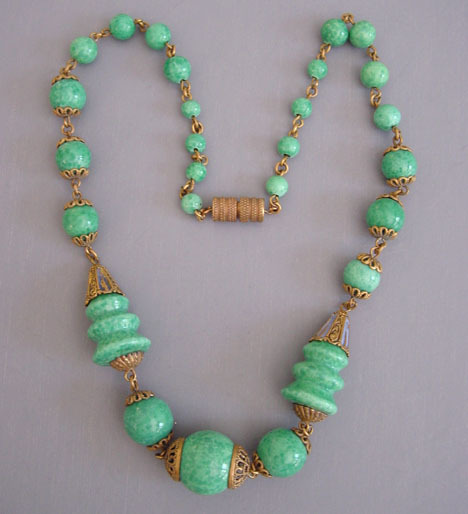 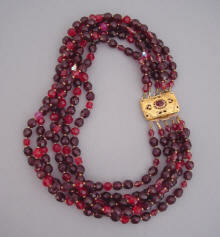 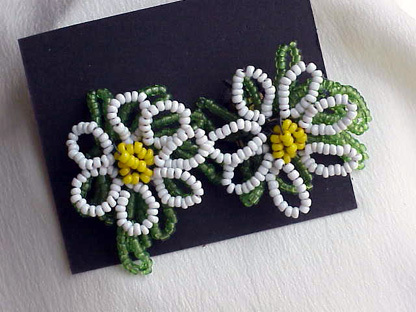 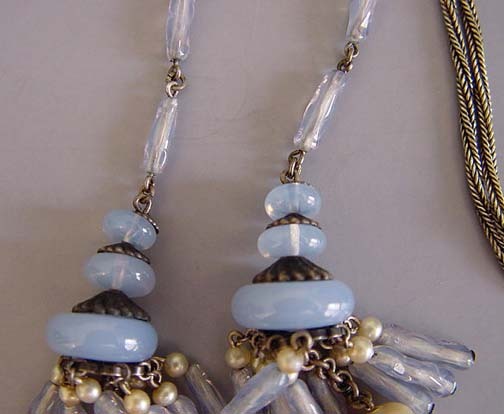 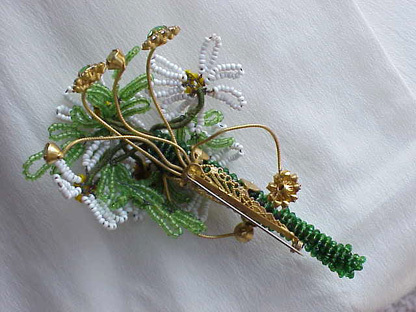 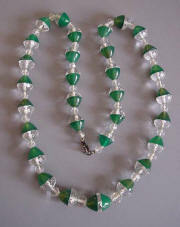 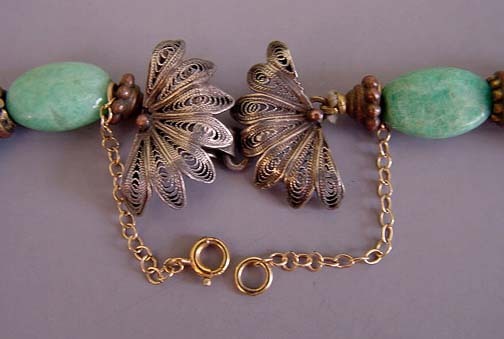 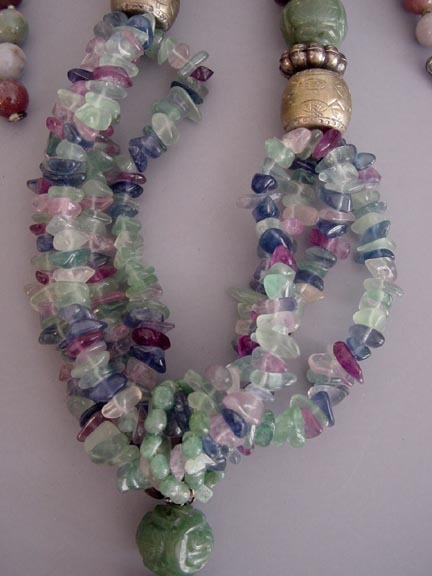 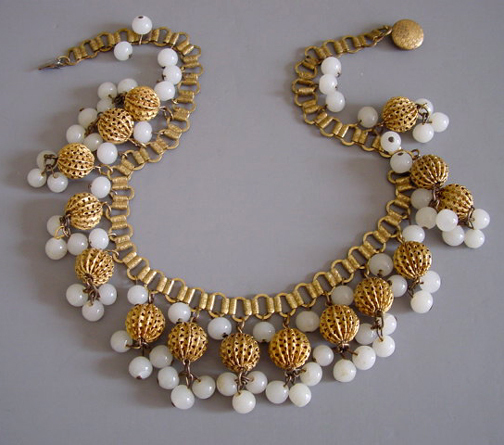 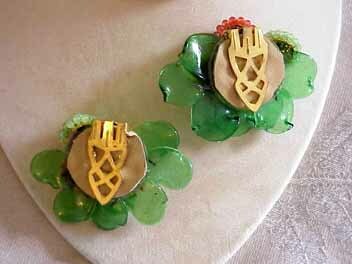 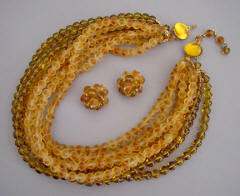 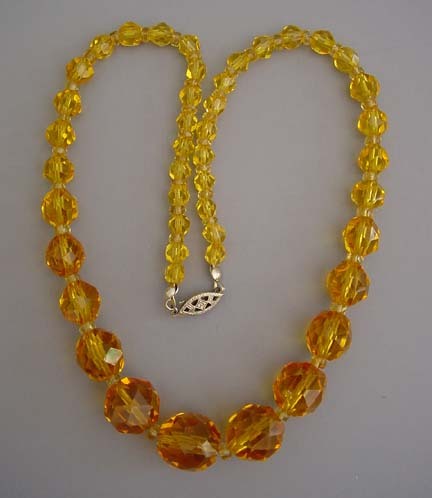 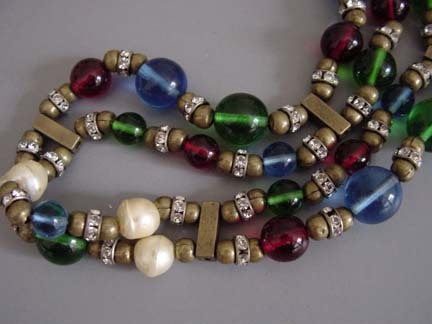 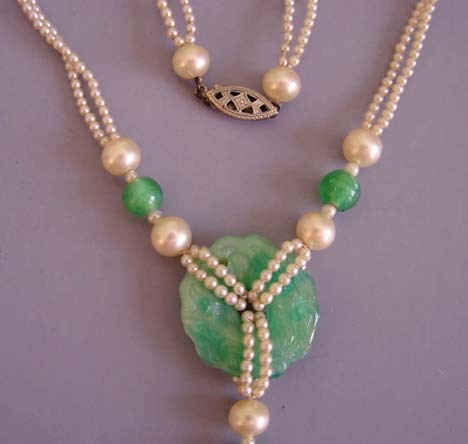 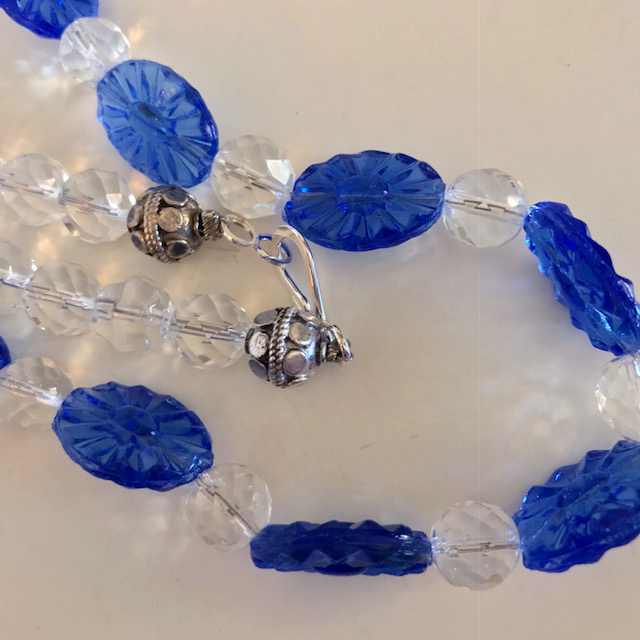 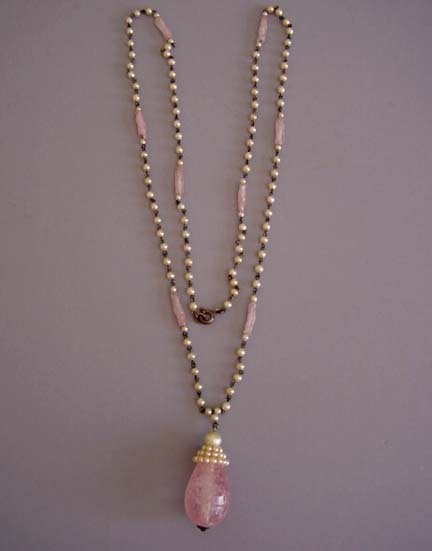 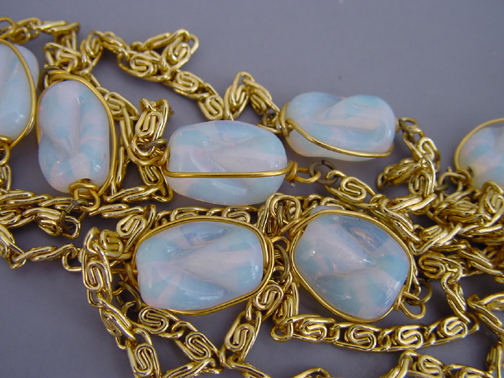 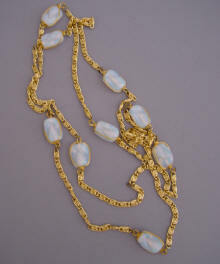 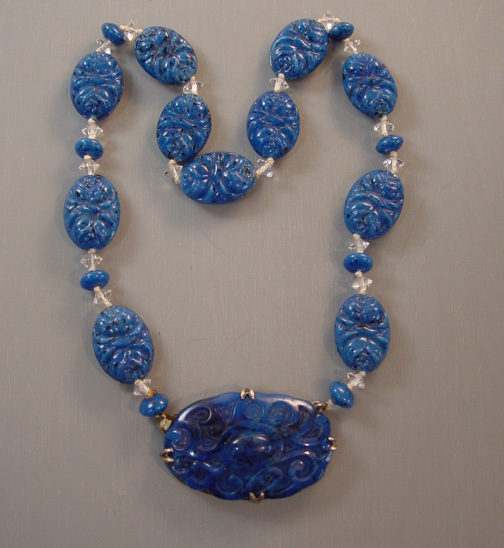 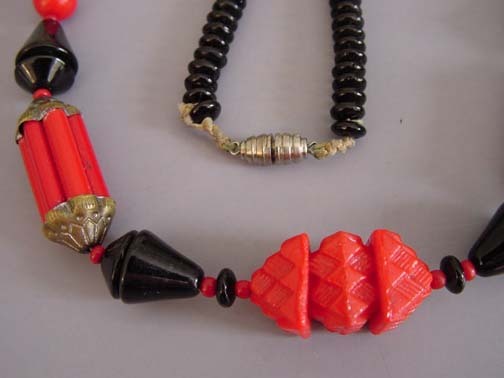 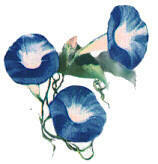 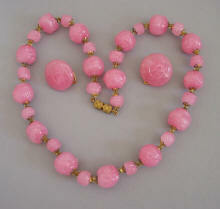 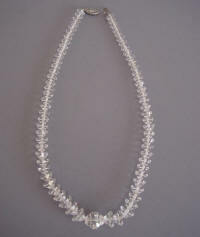 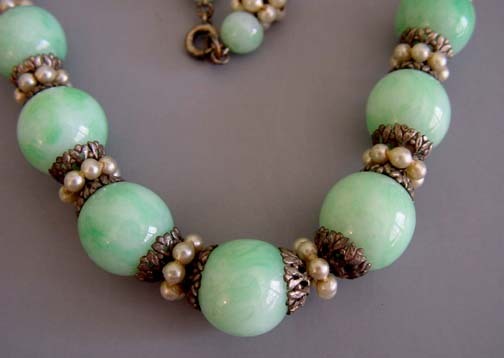 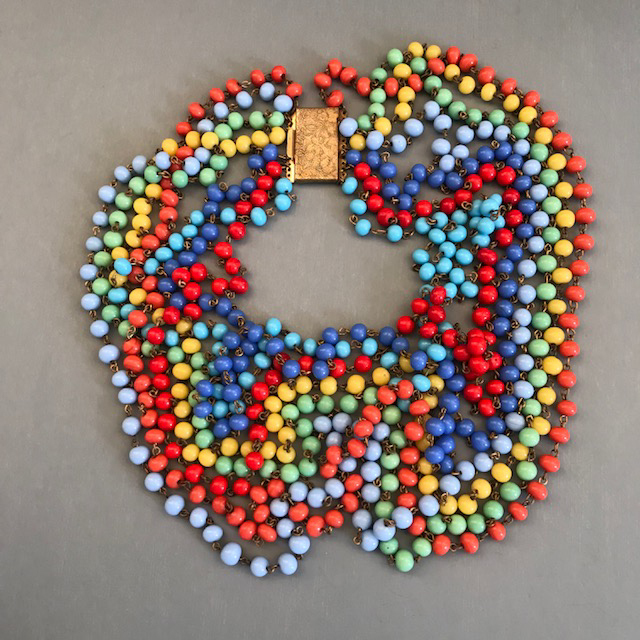 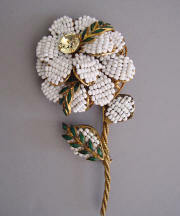 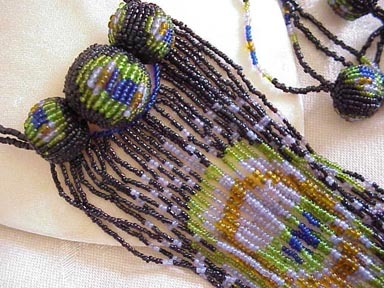 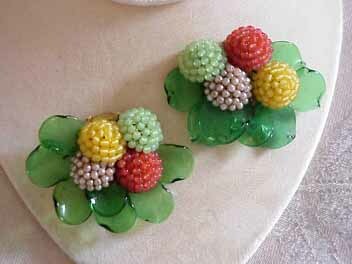 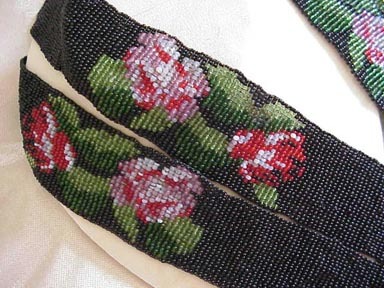 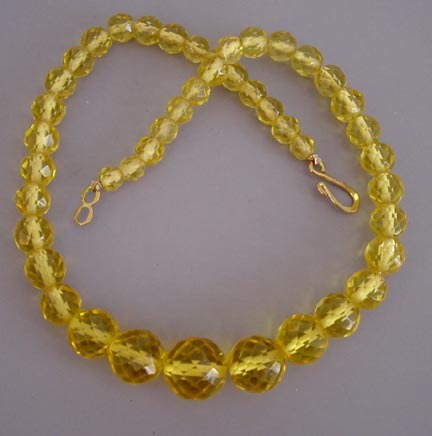 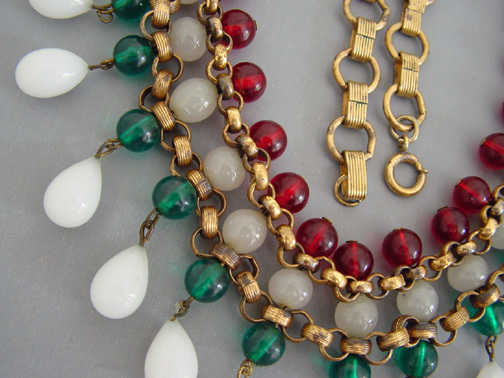 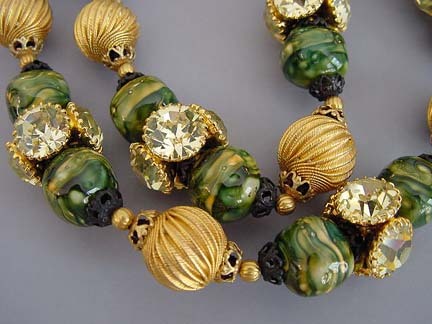 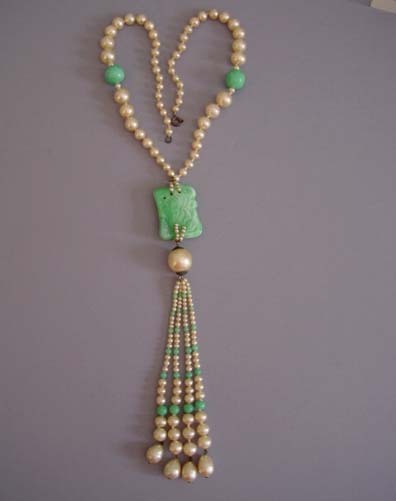 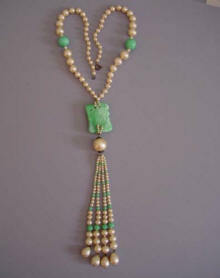 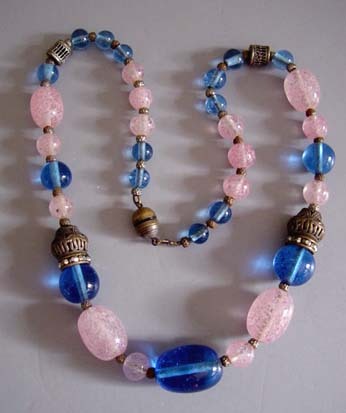 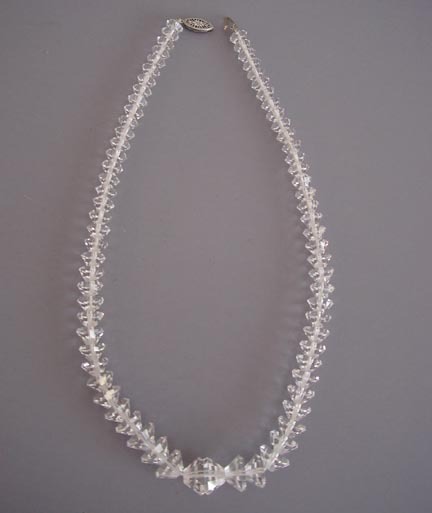 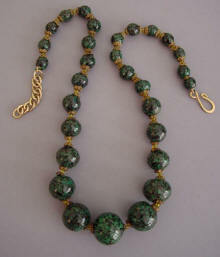 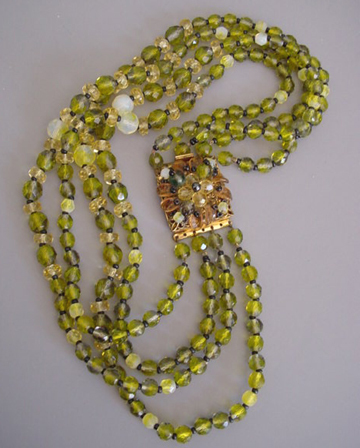 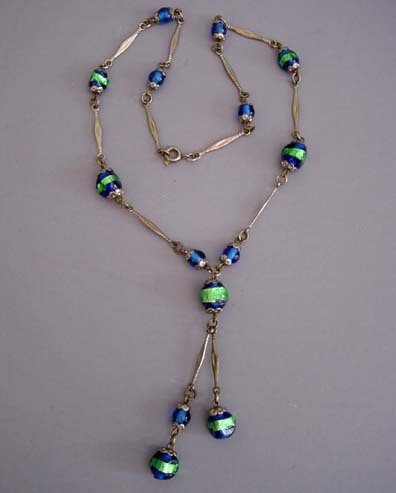 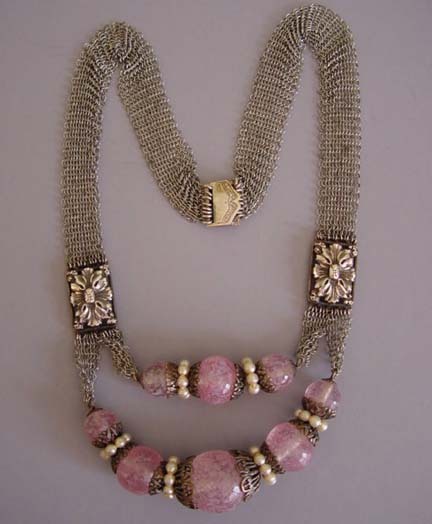 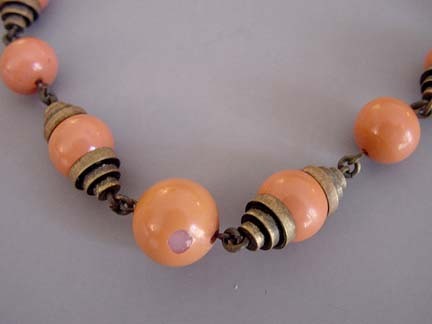 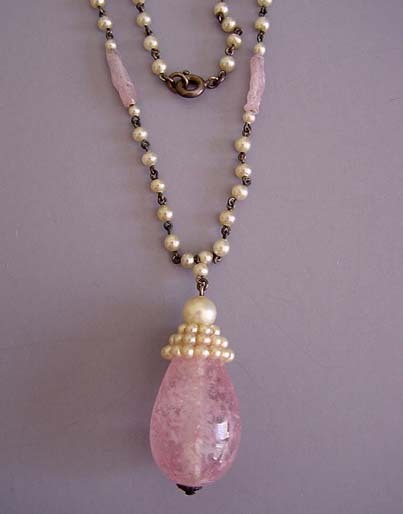 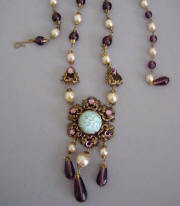 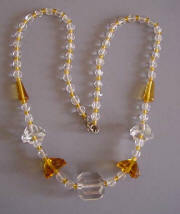 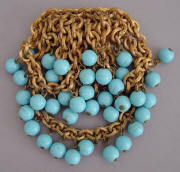 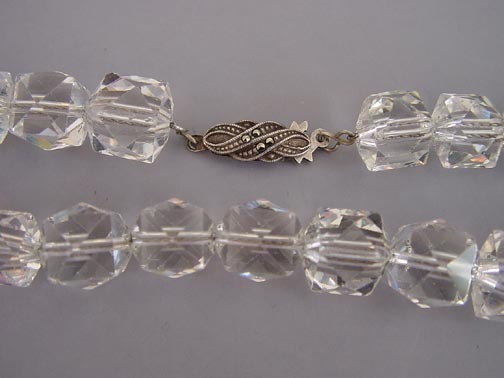 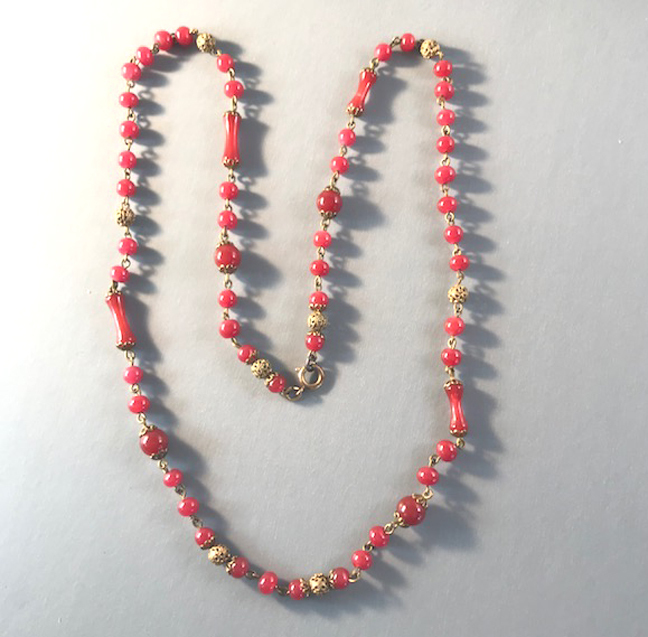 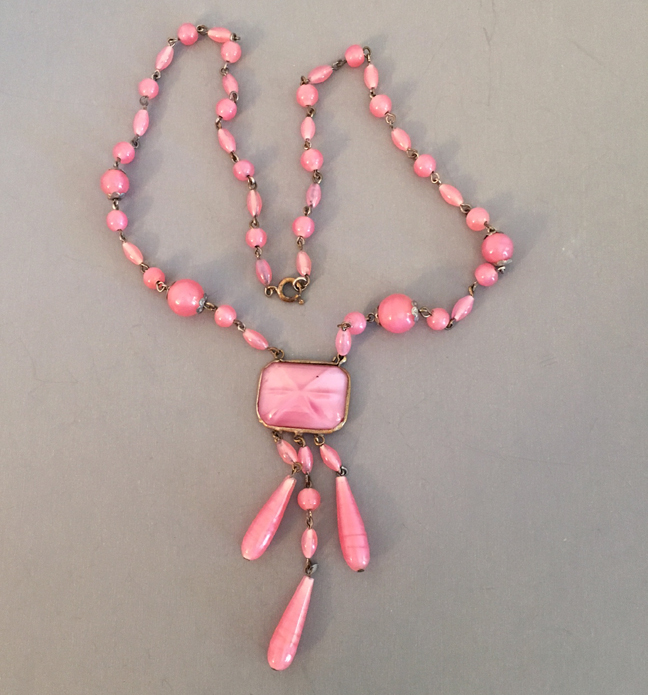 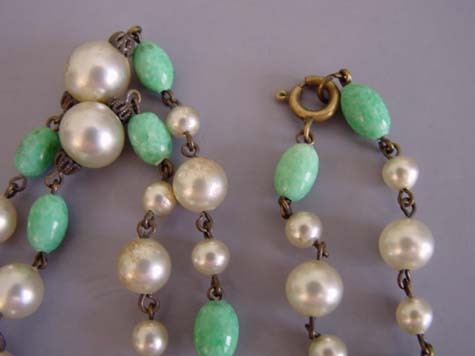 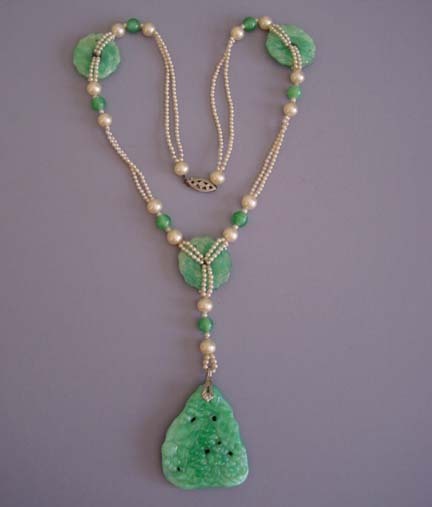 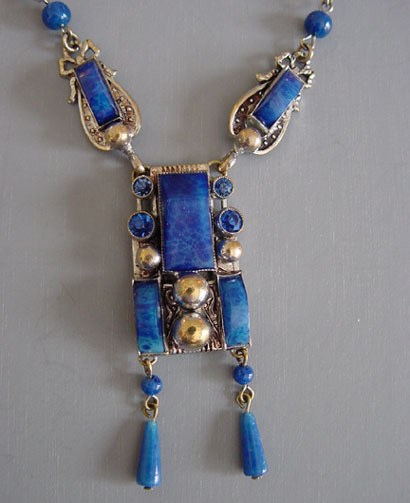 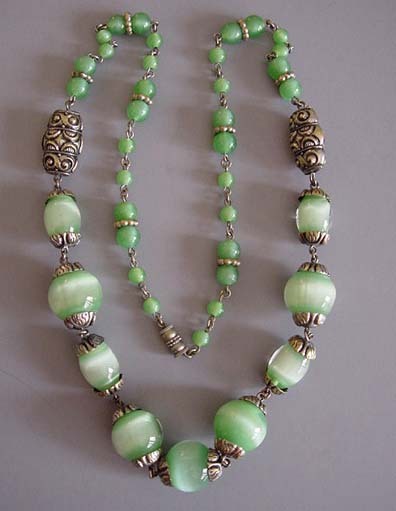 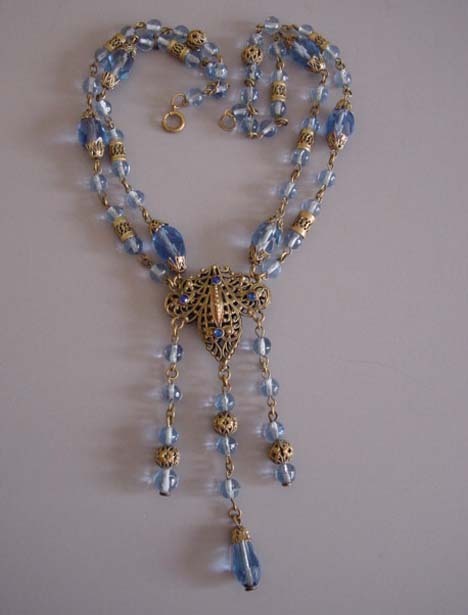 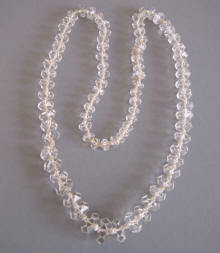 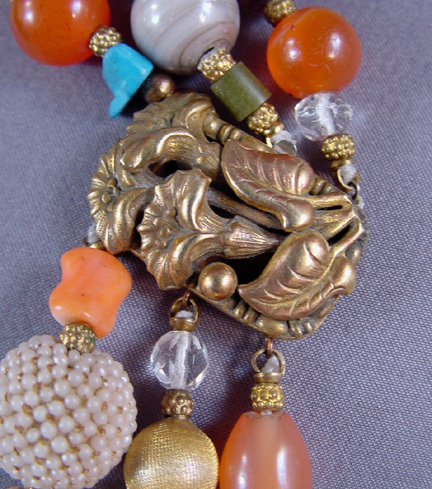 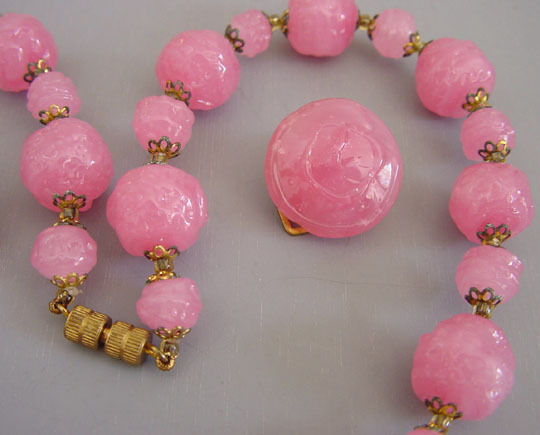 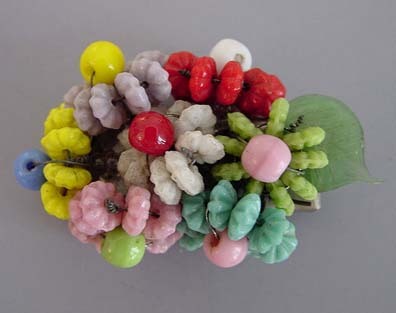 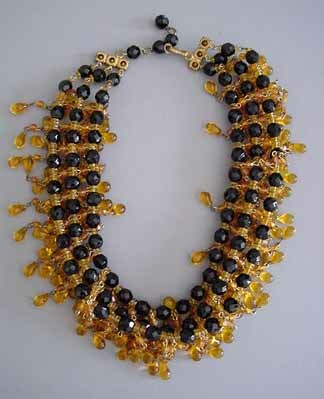 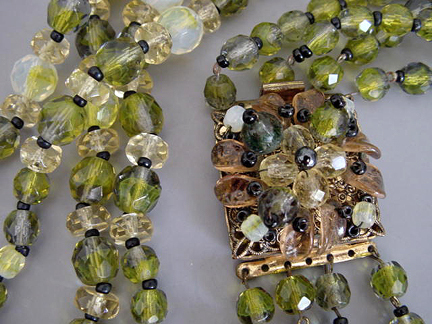 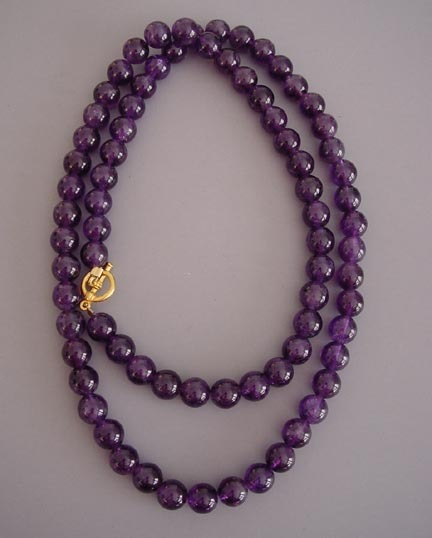 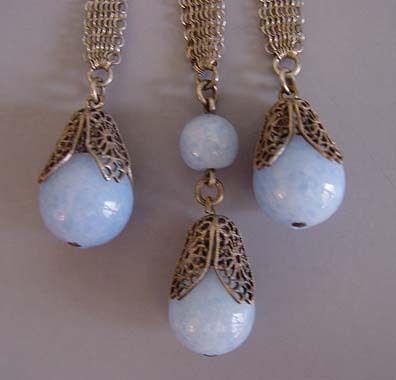 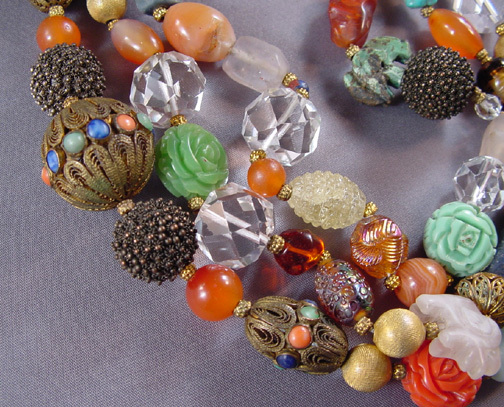 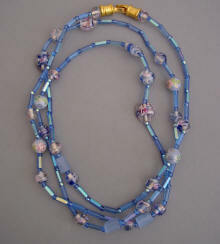 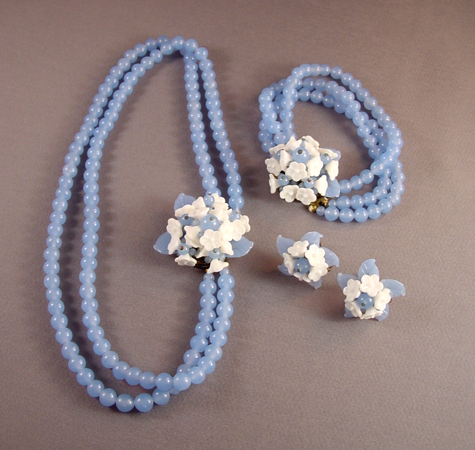 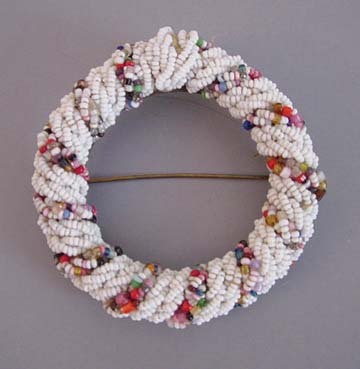 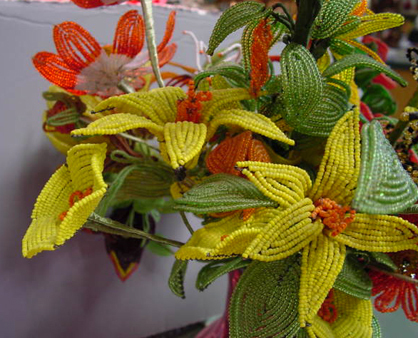 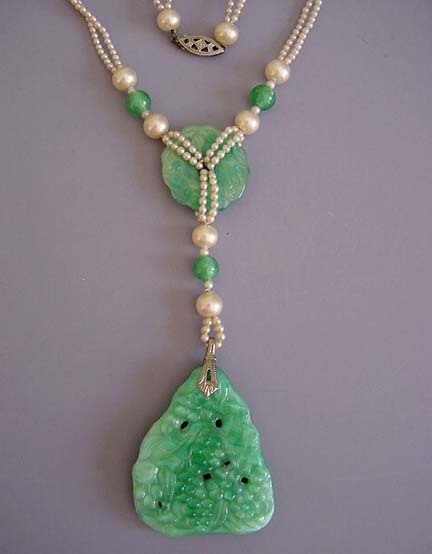 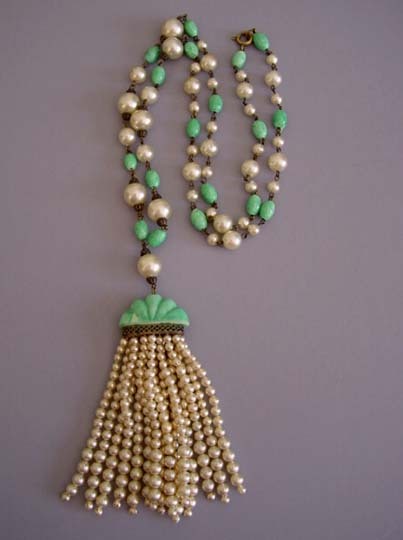 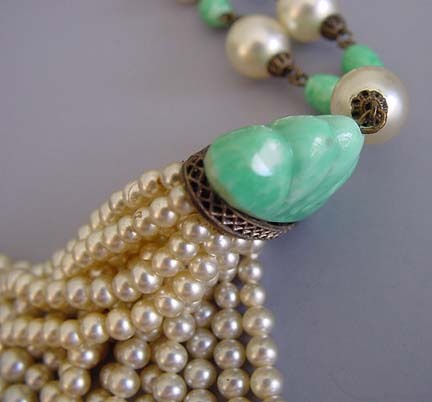 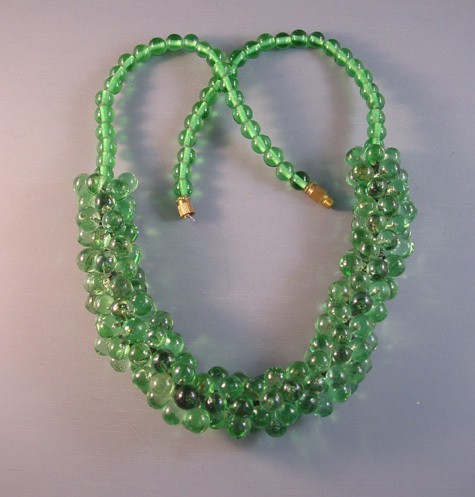 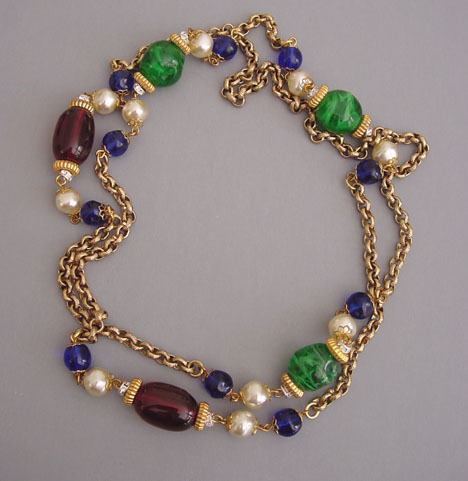 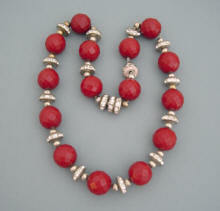 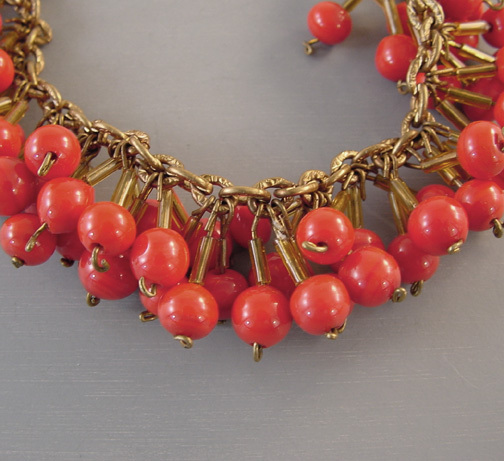 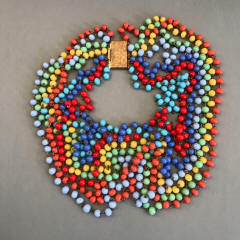 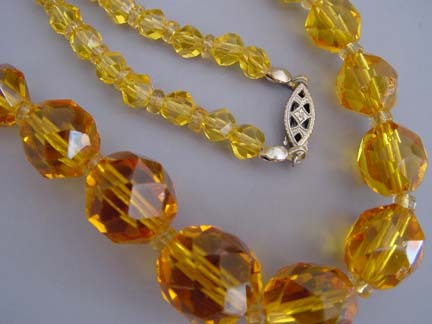 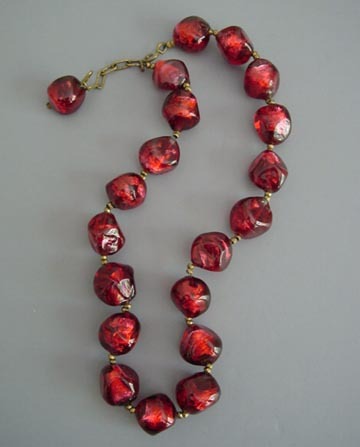 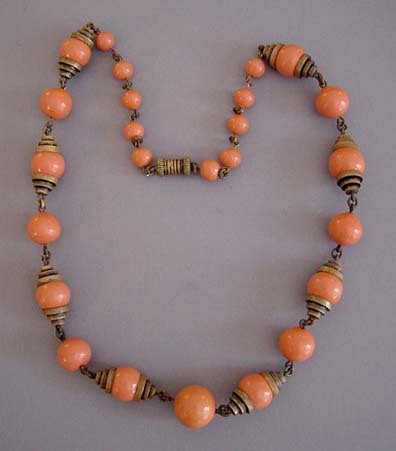 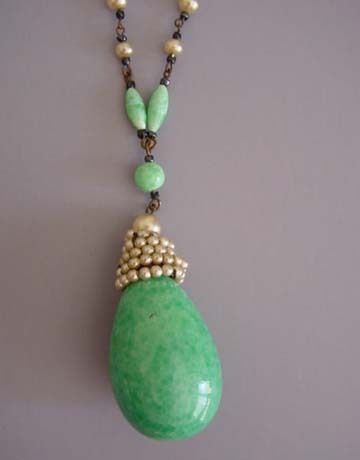 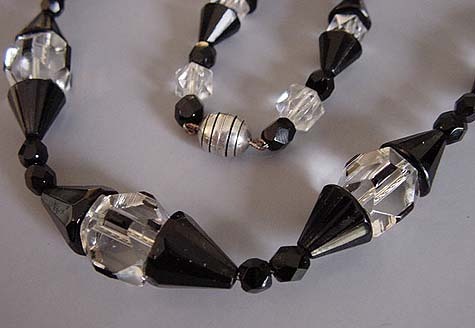 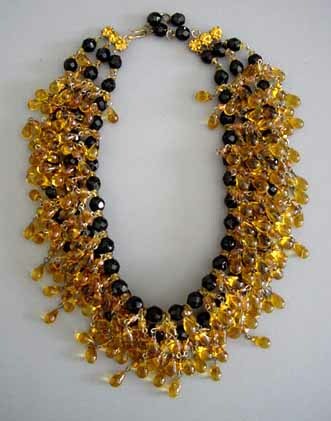 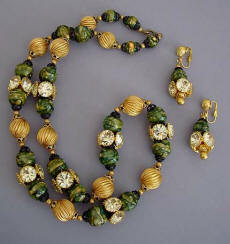 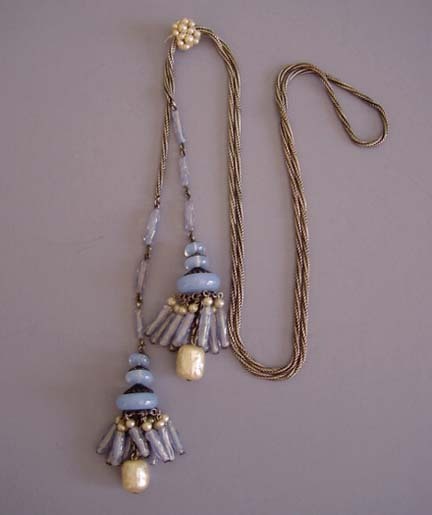 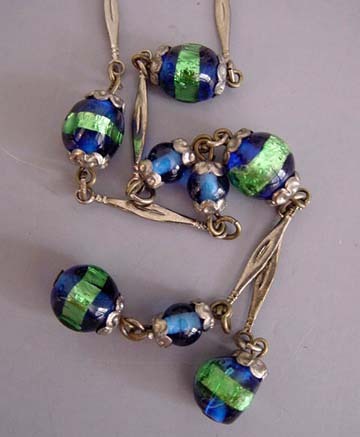 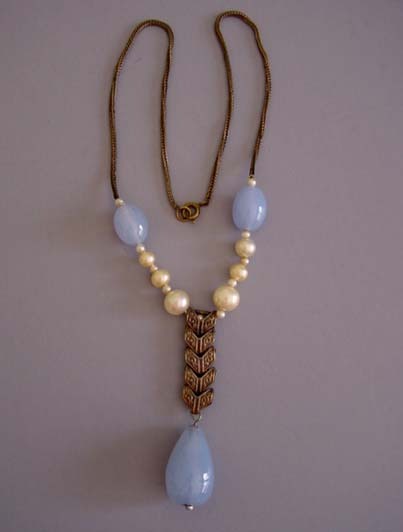 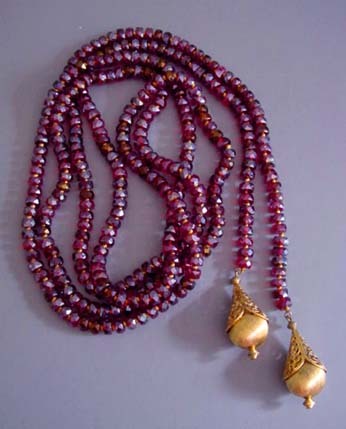 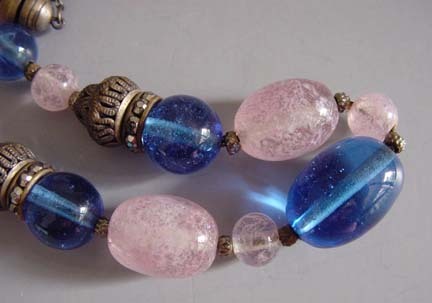 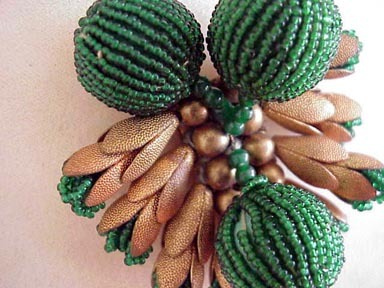 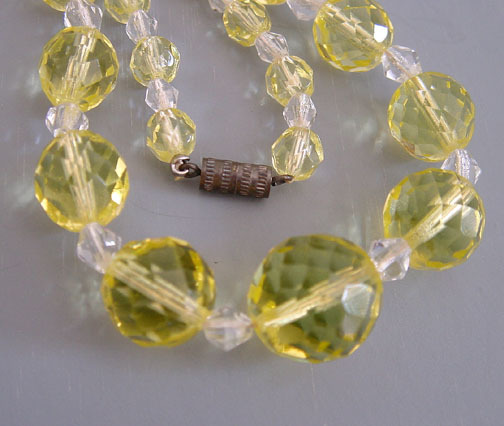 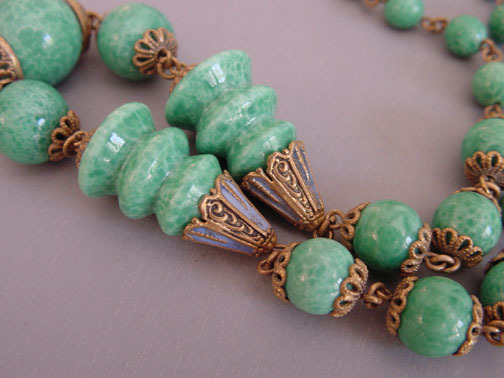 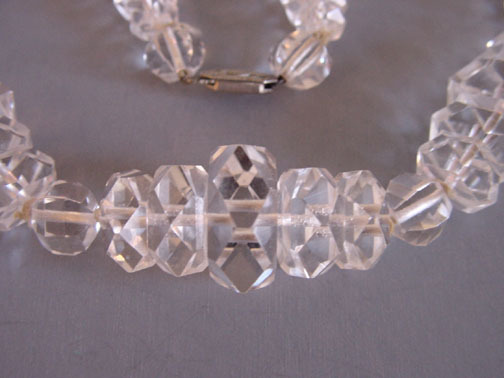 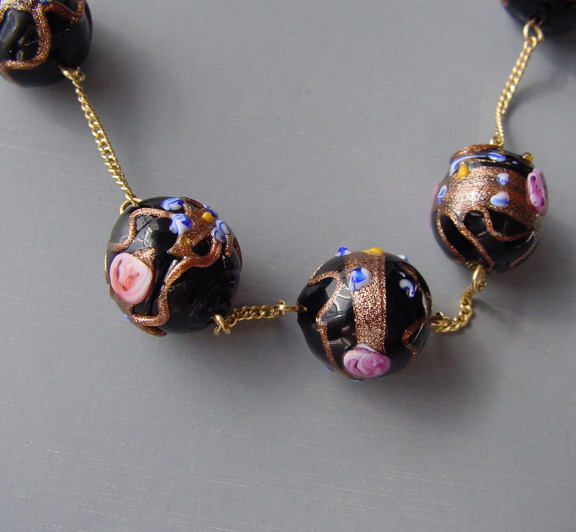 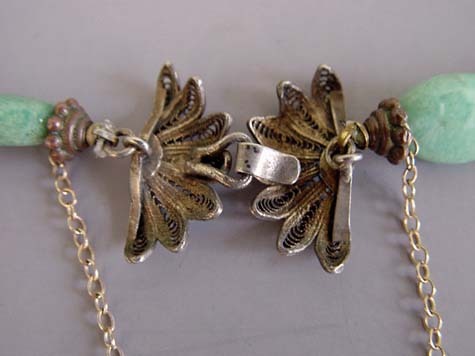 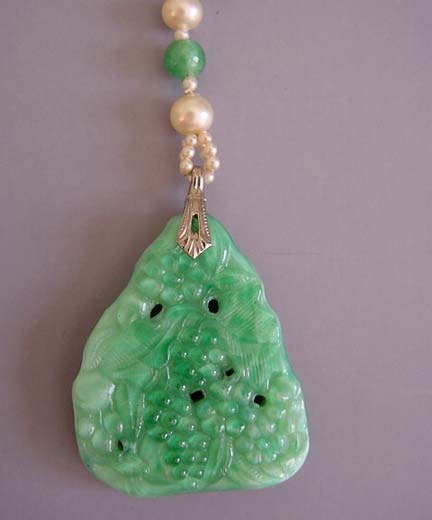 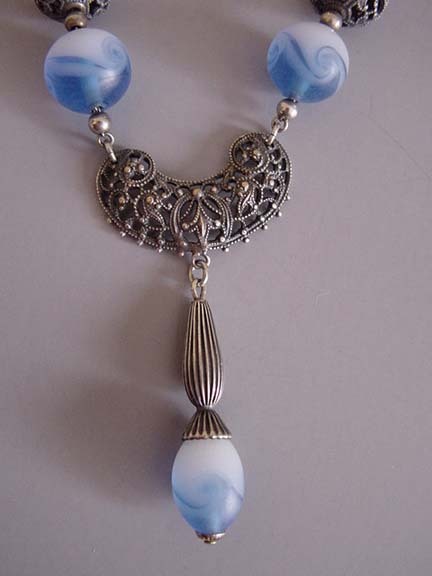 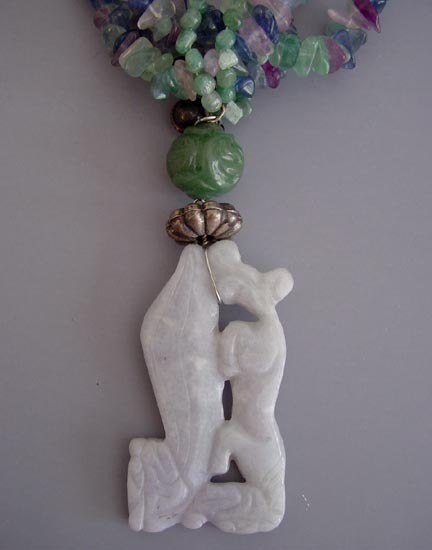 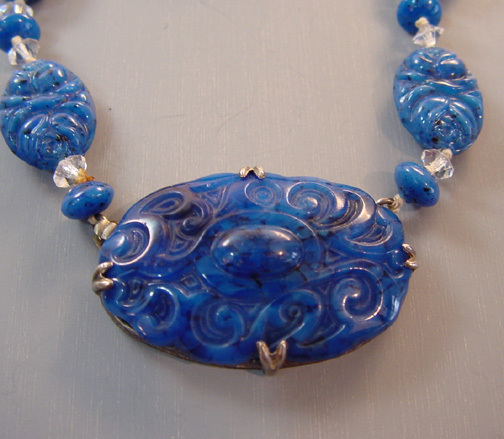 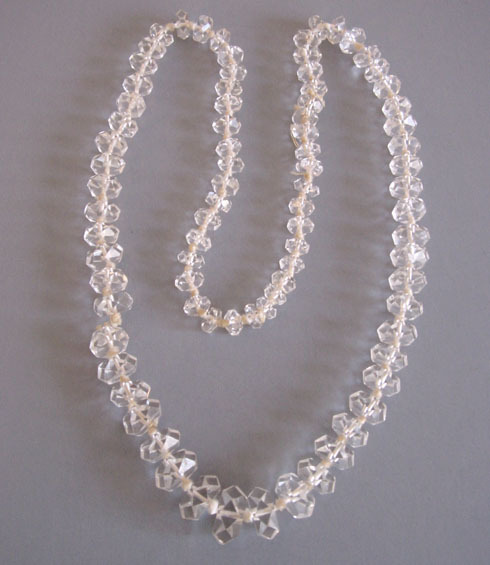 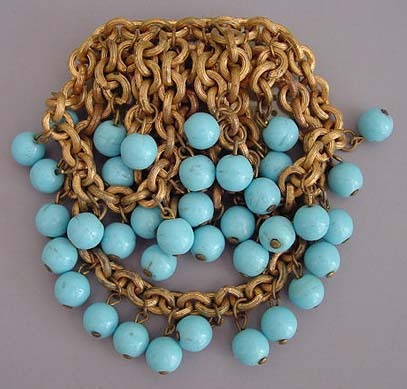 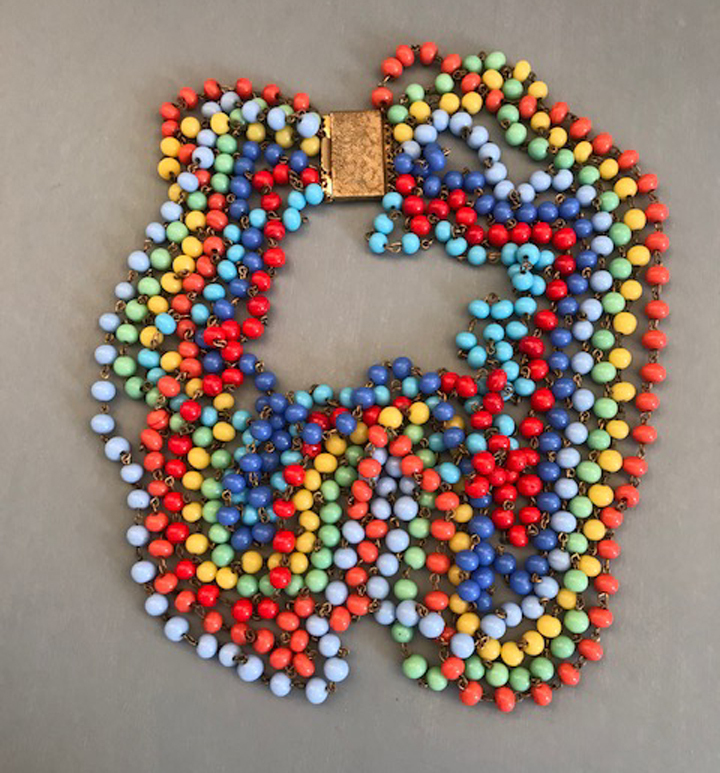 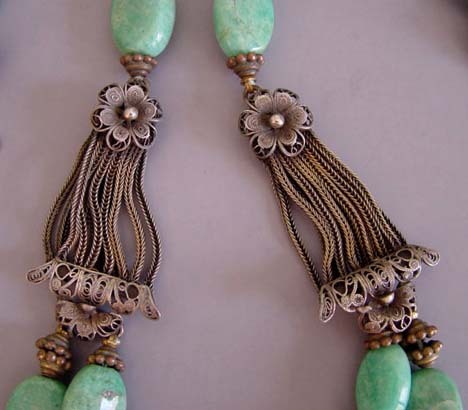 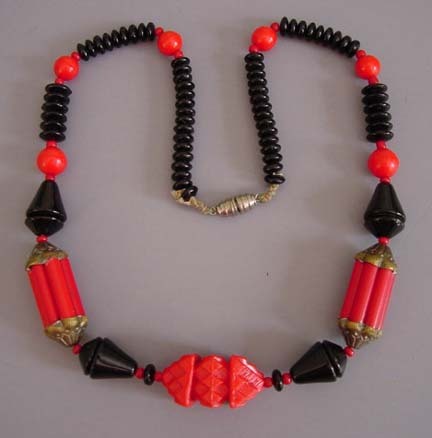 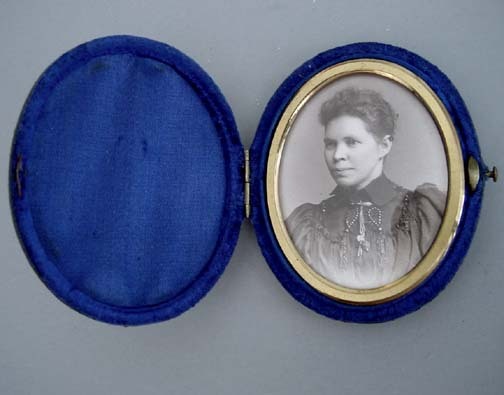 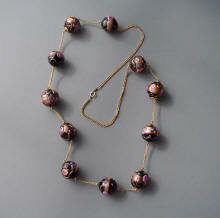 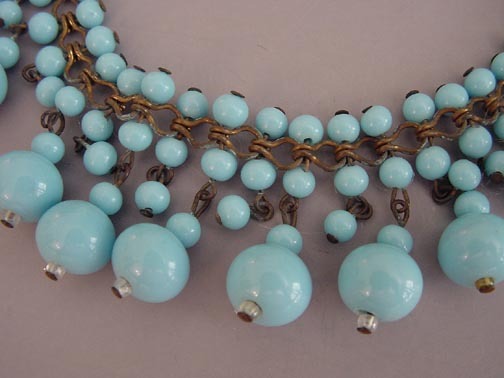 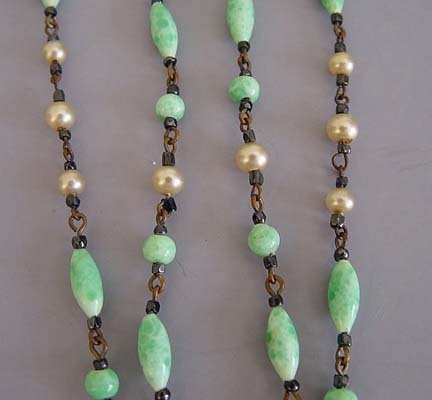 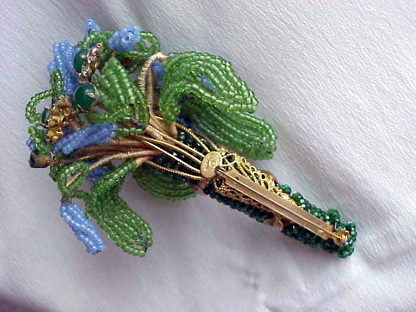 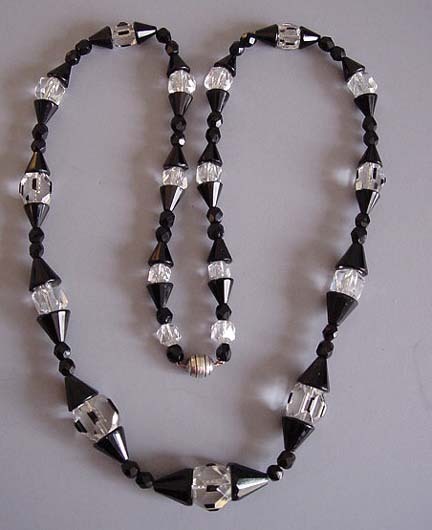 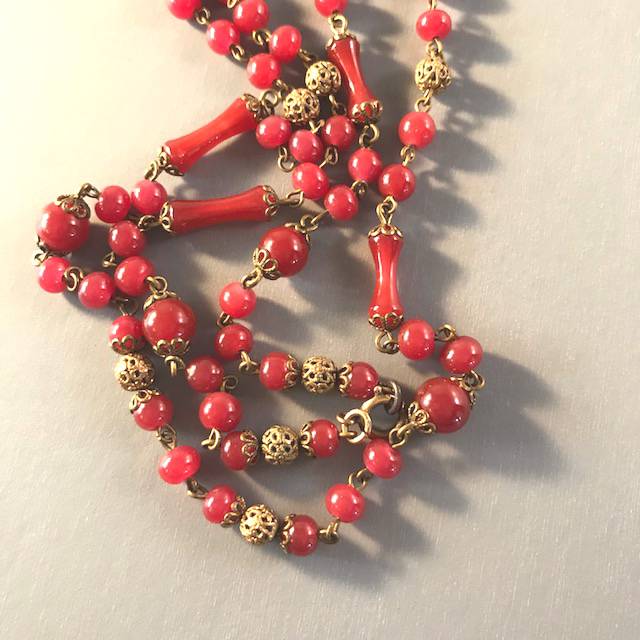 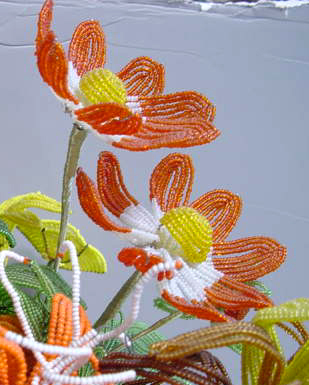 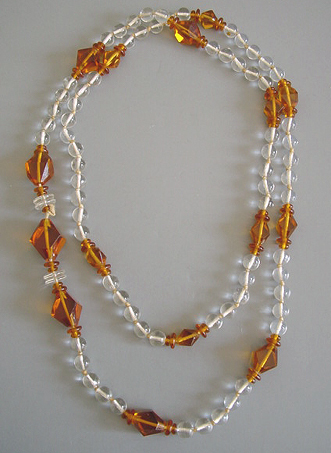 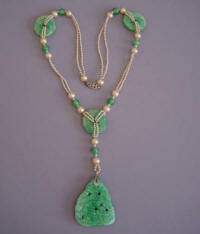 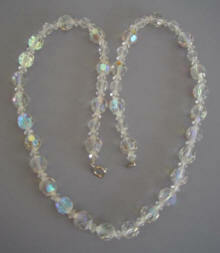 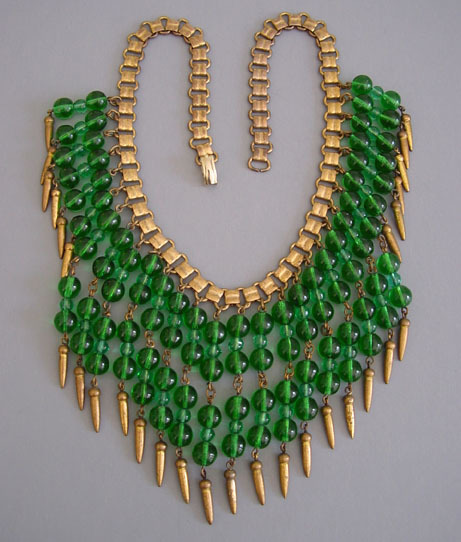 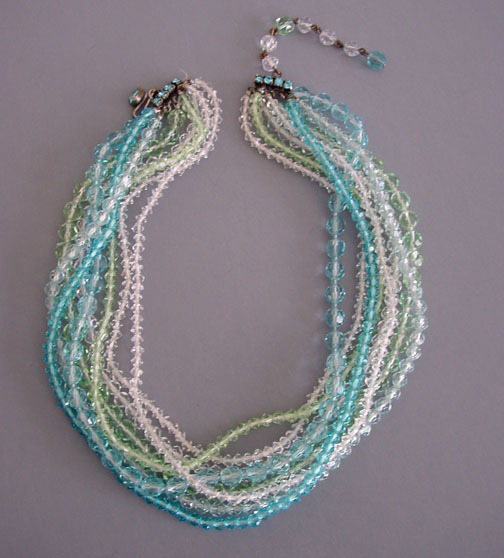 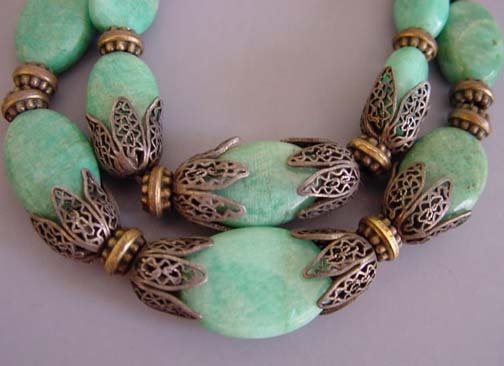 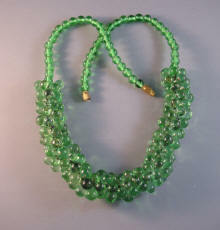 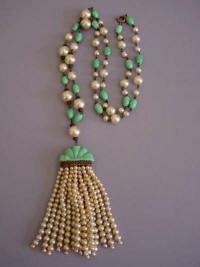 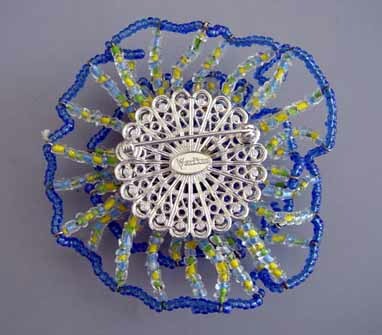 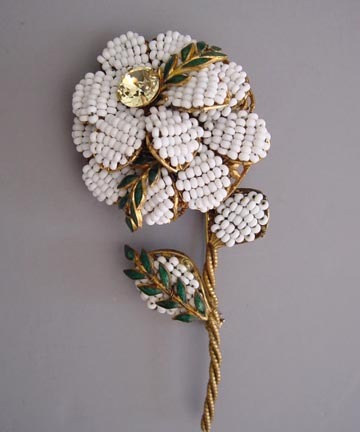 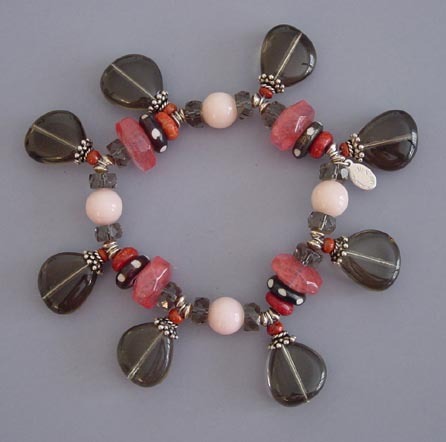 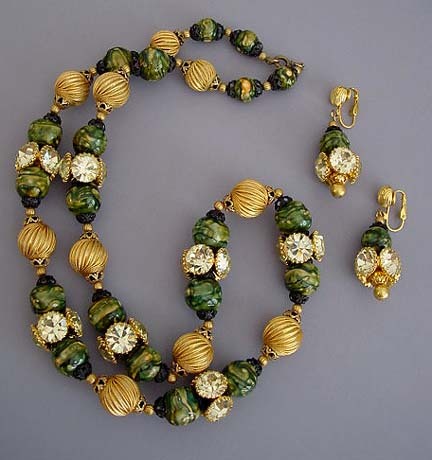 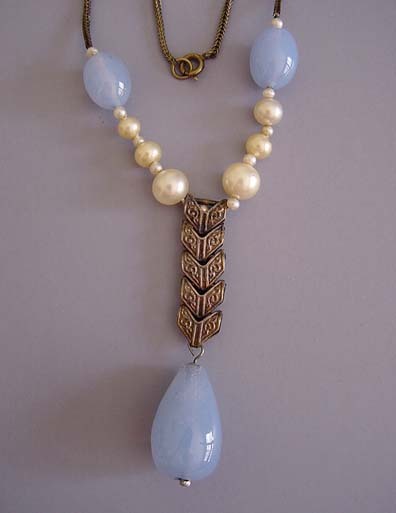 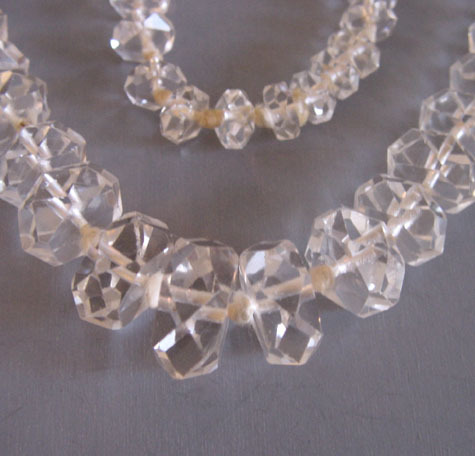 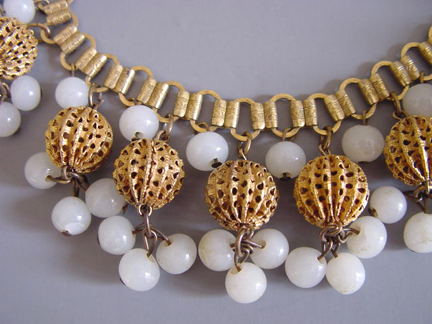 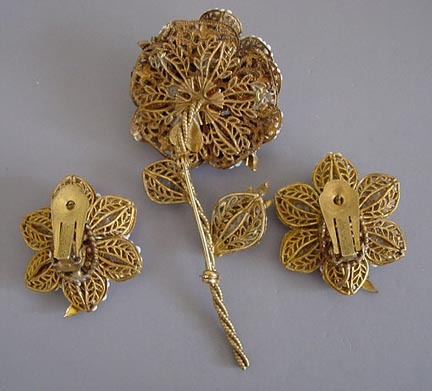 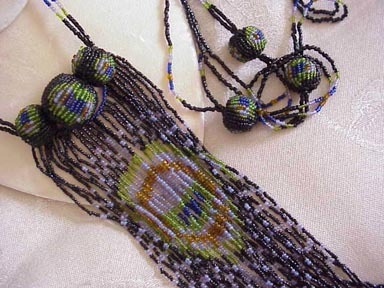 CARNEGIE made some terrific jewelry, and favorites are these beaded flowers. 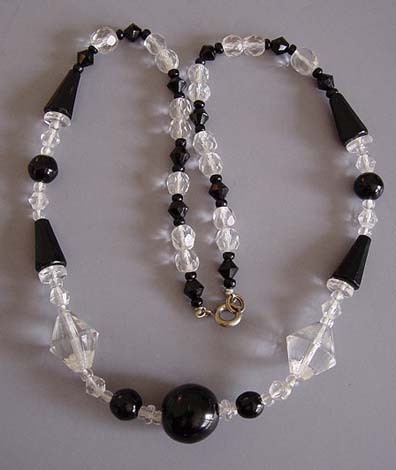 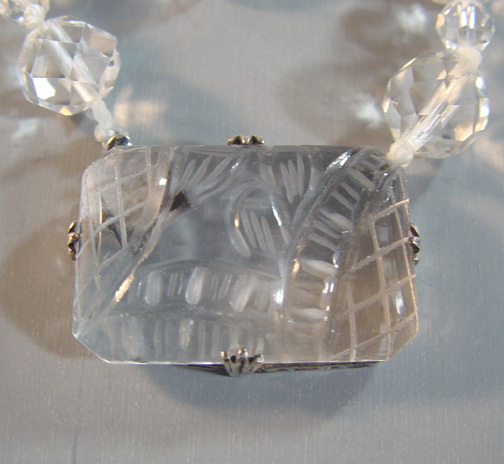 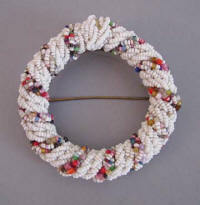 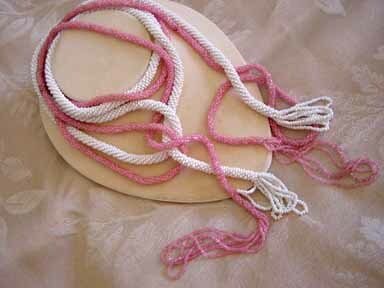 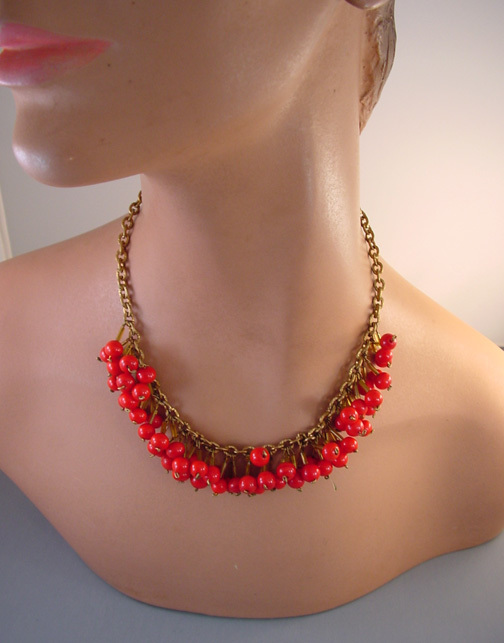 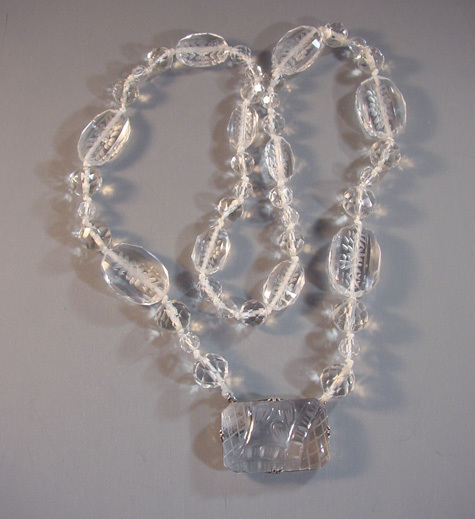 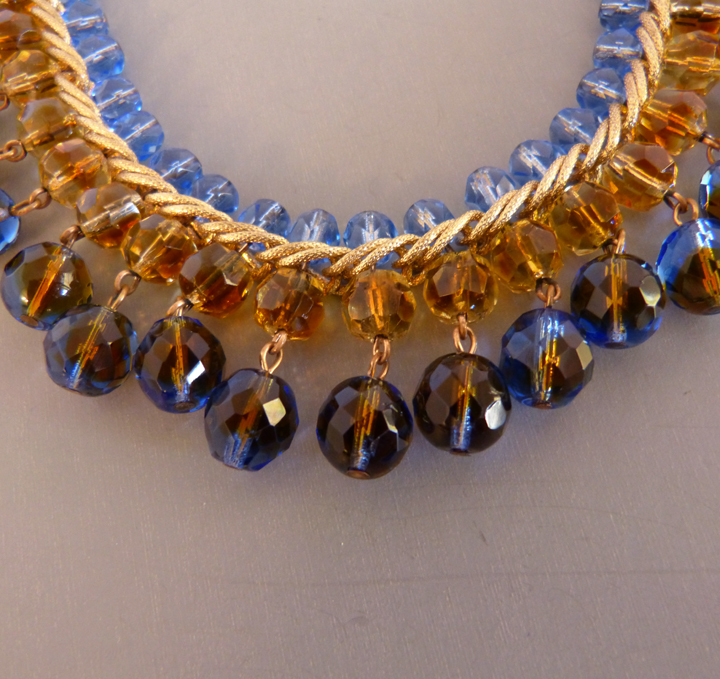 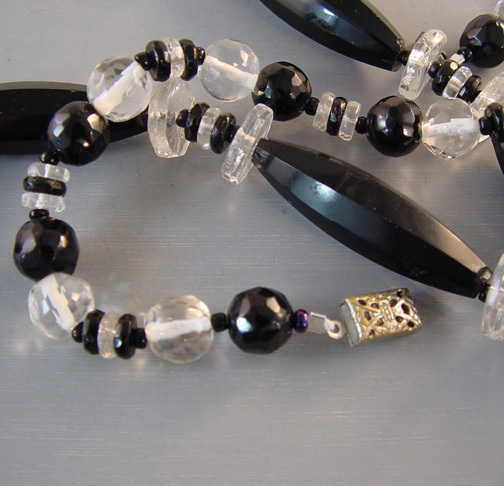 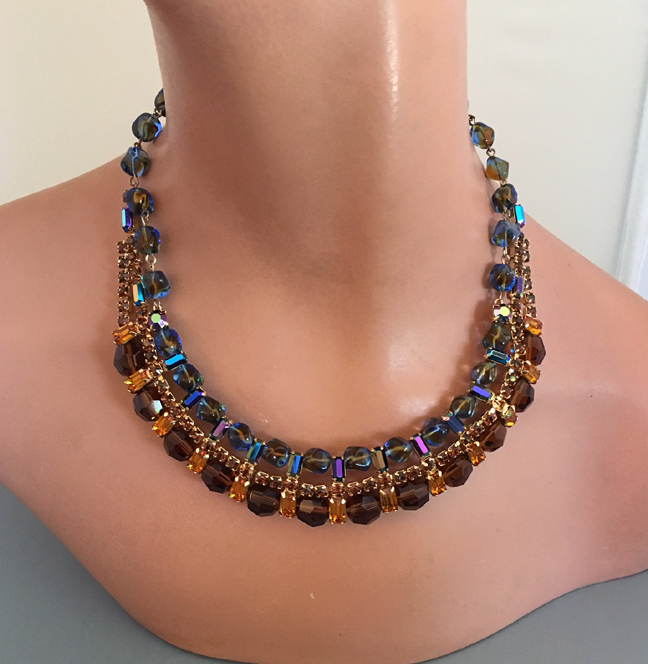 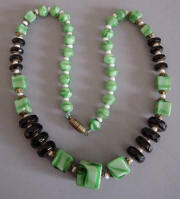 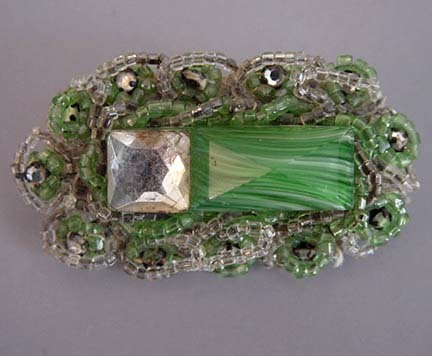 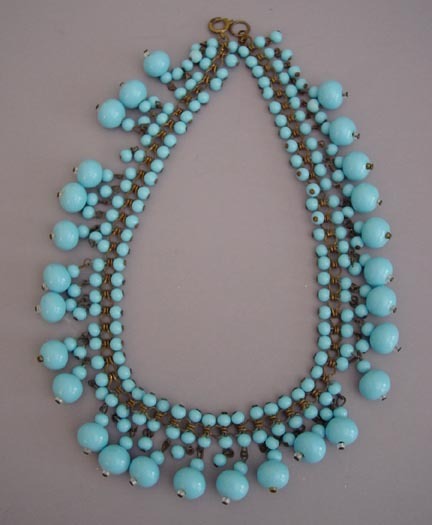 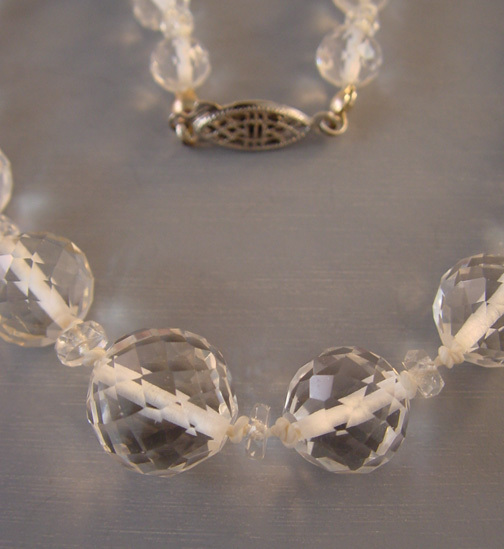 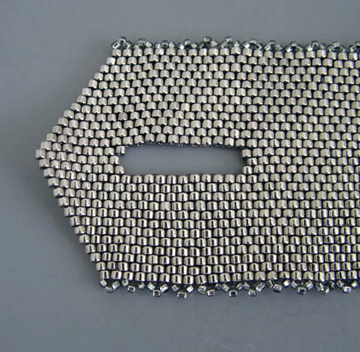 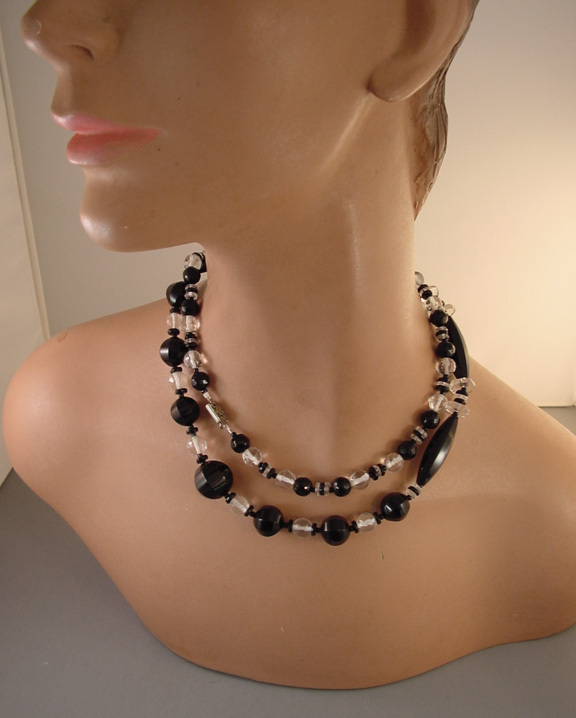 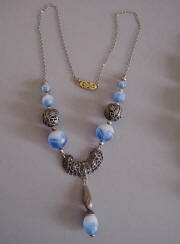 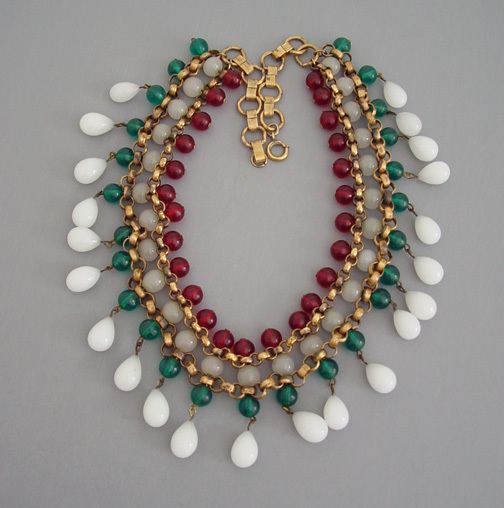 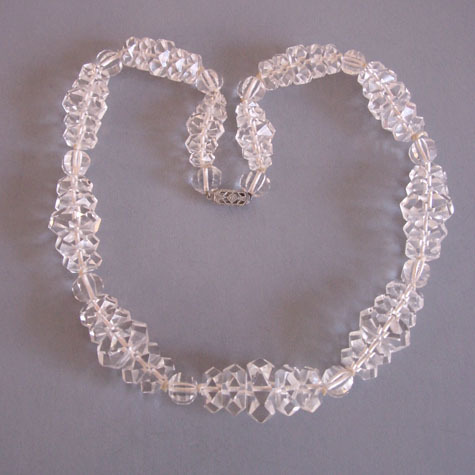 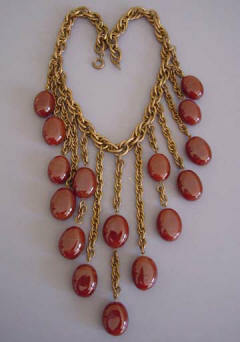 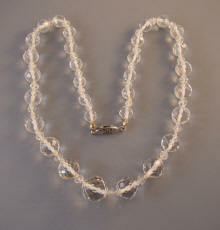 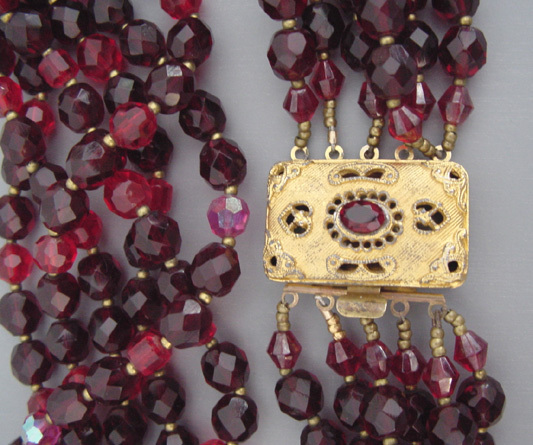 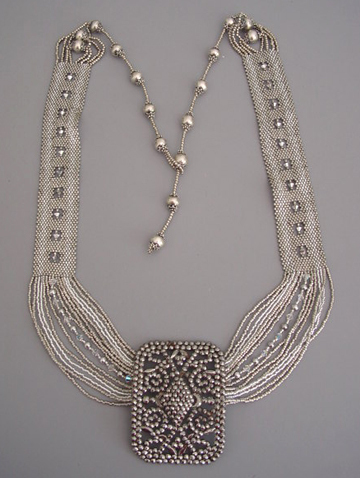 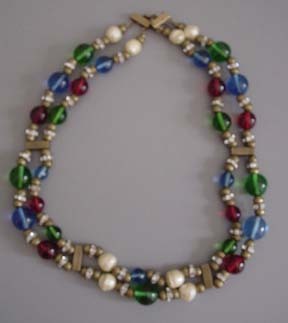 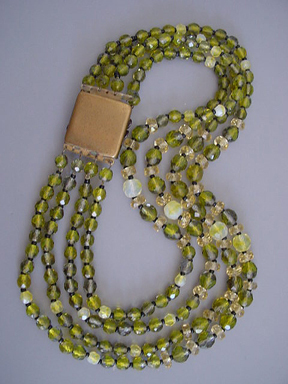 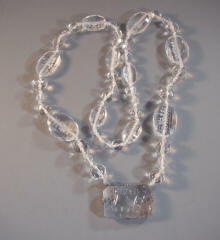 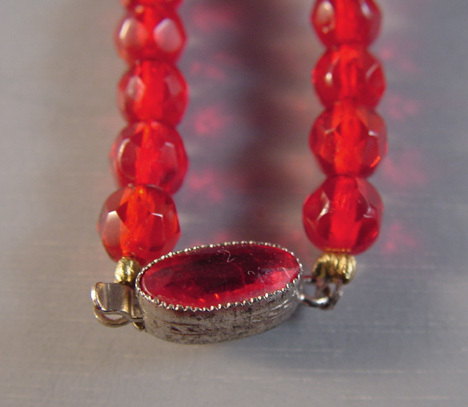 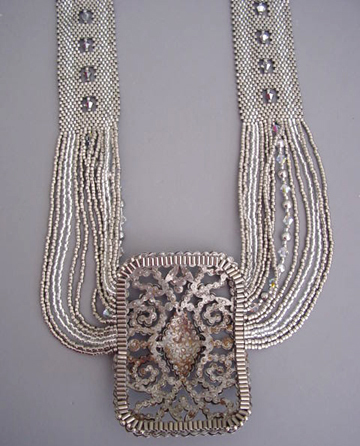 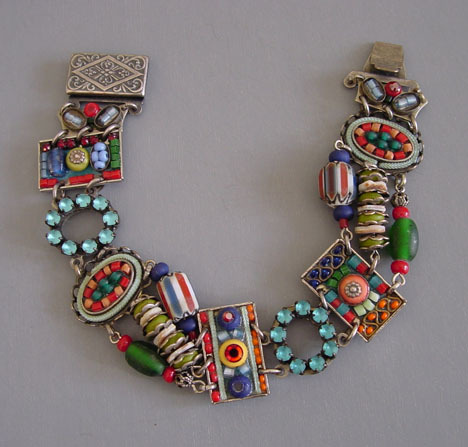 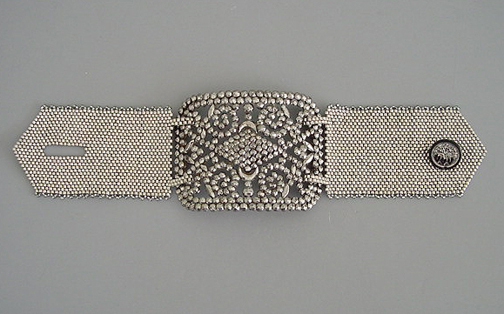 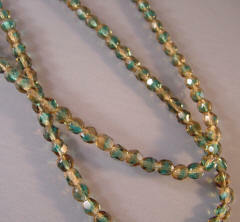 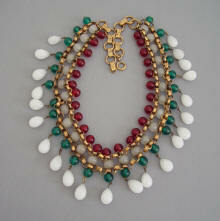 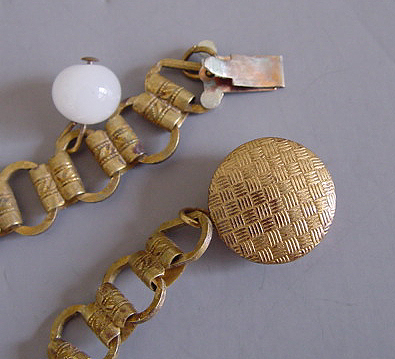 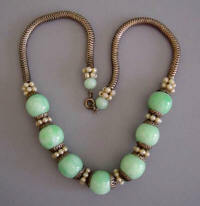 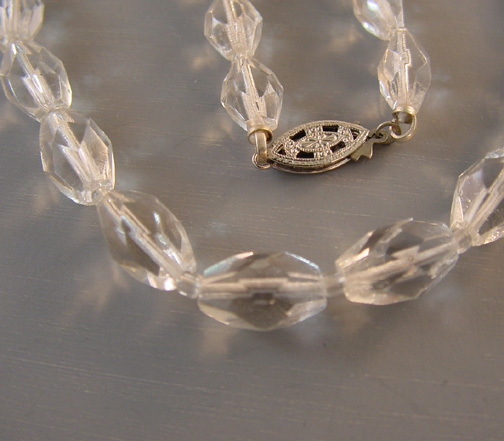 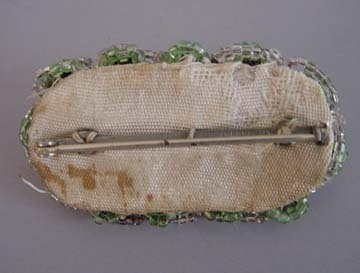 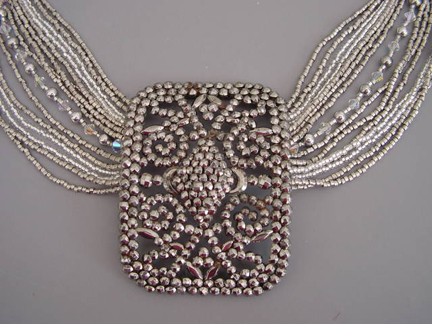 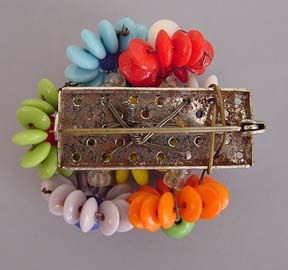 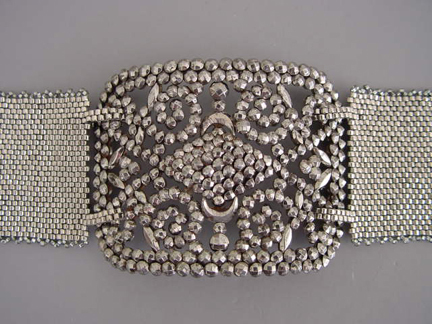 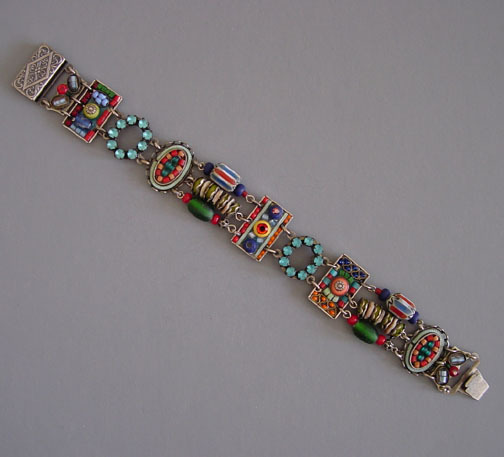 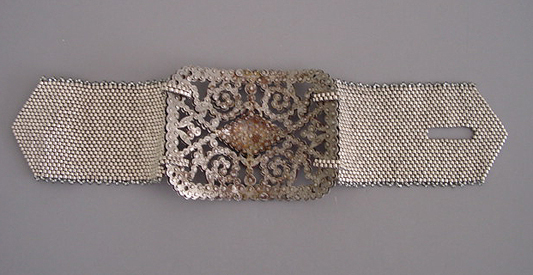 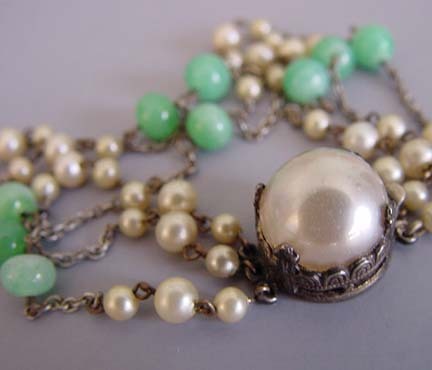 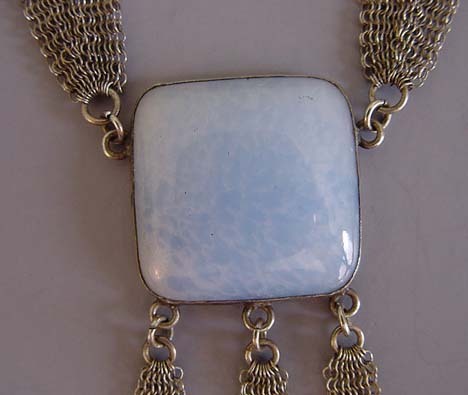 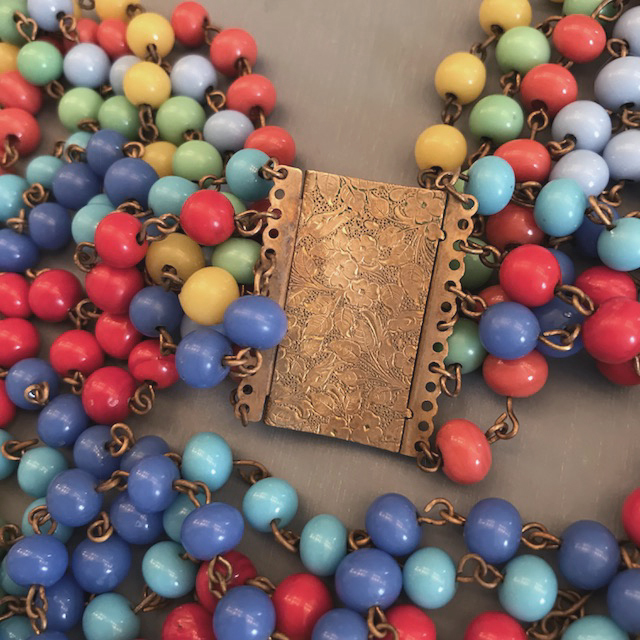 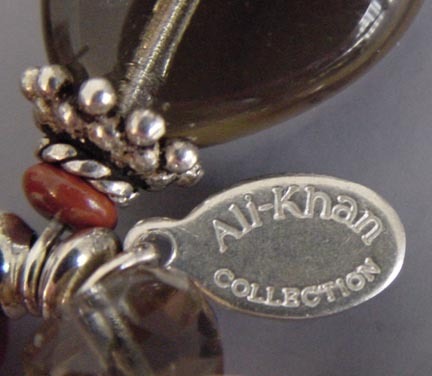 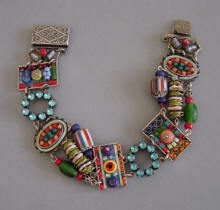 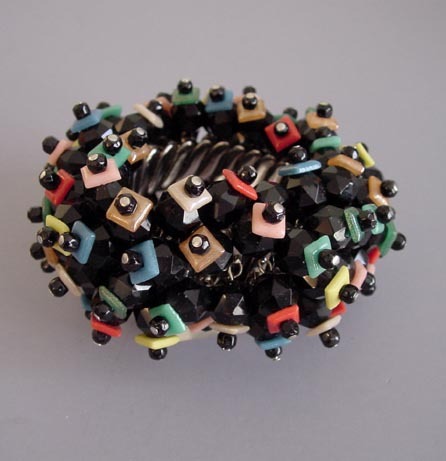 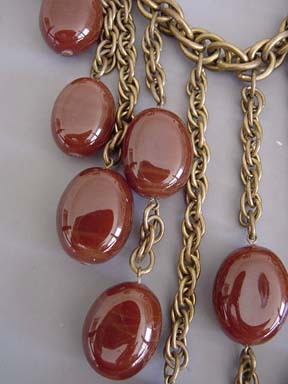 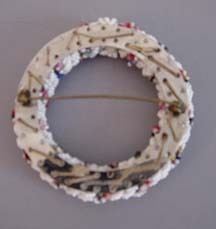 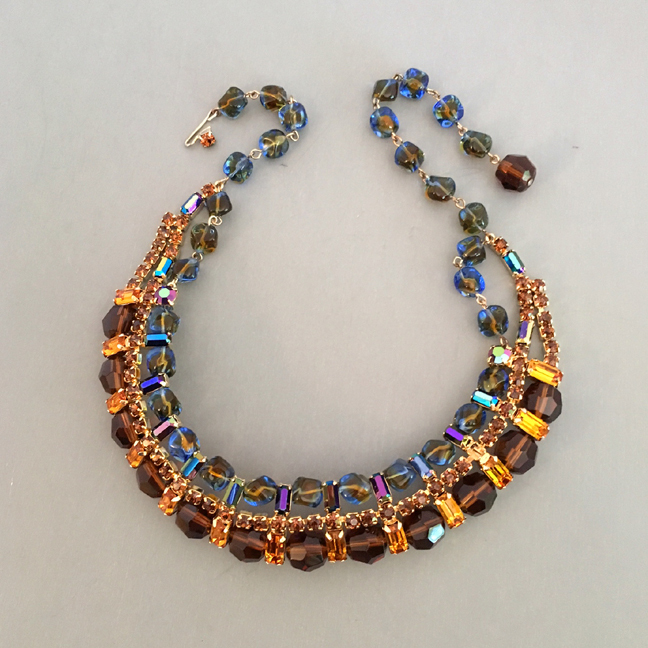 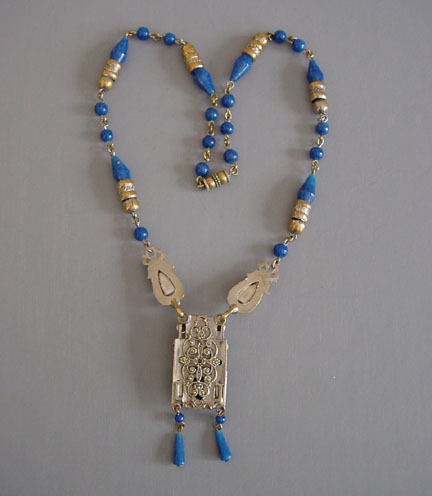 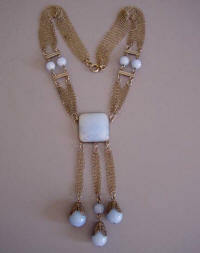 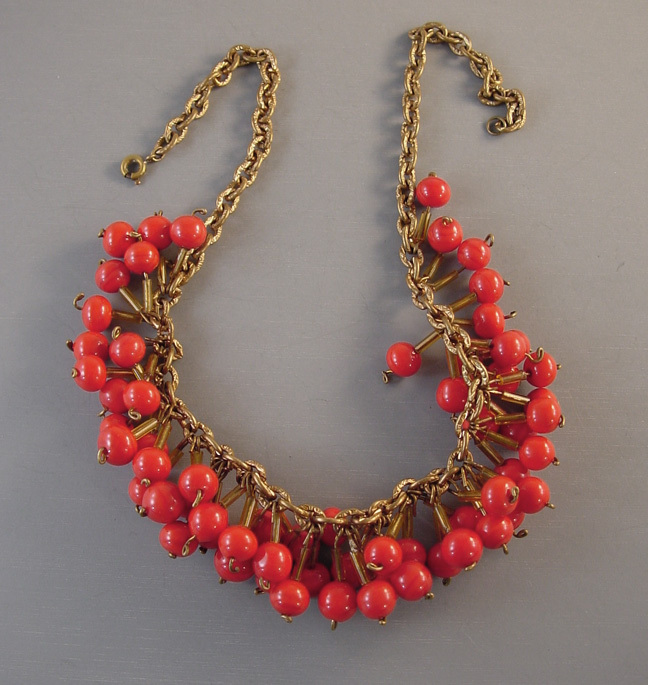 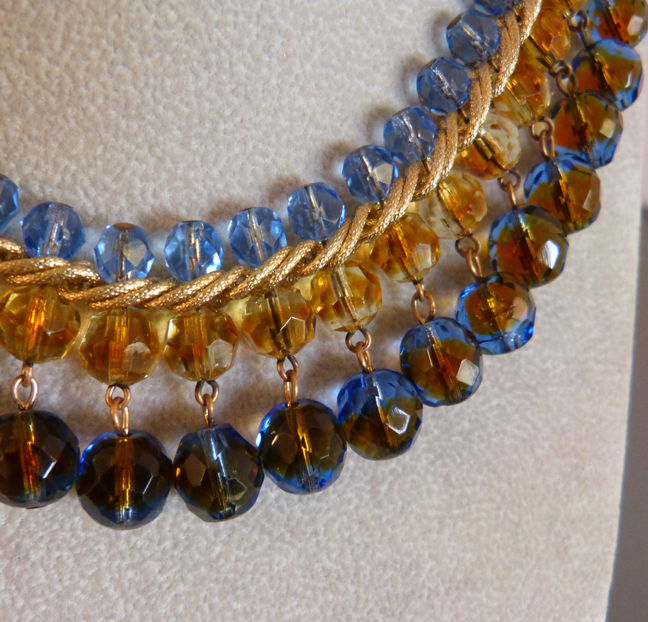 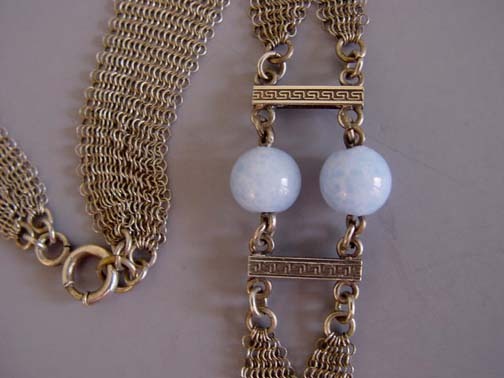 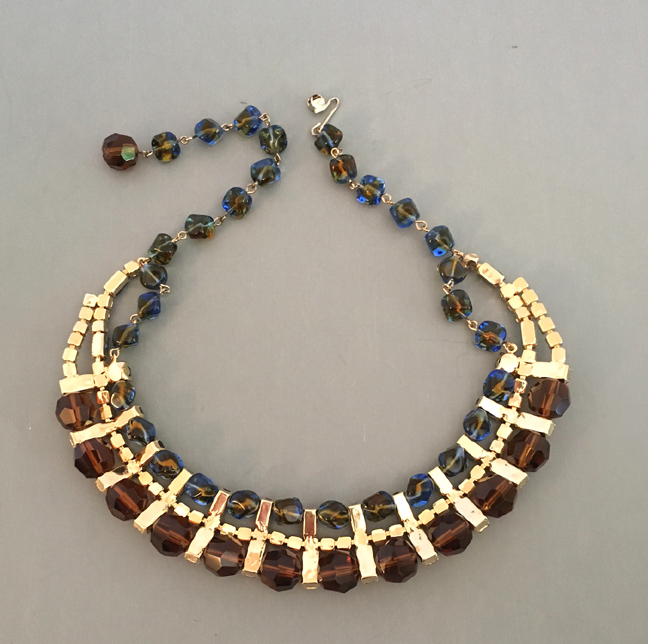 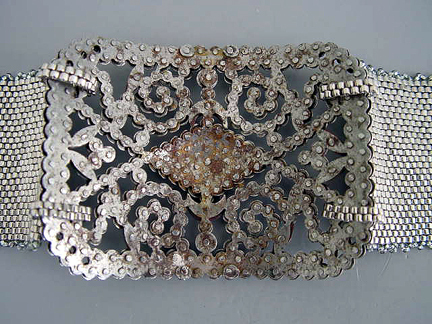 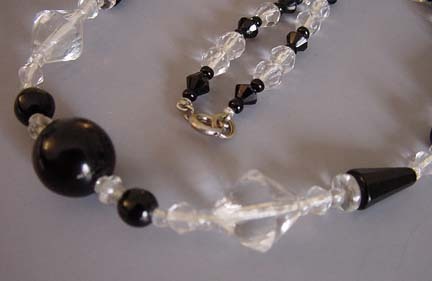 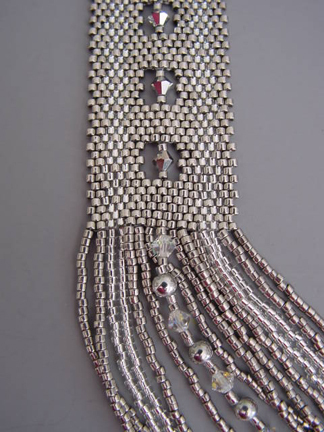 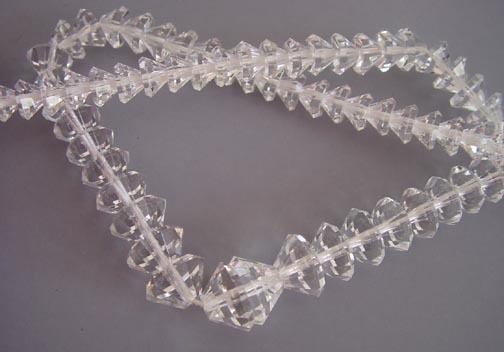 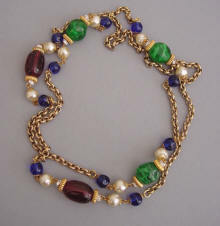 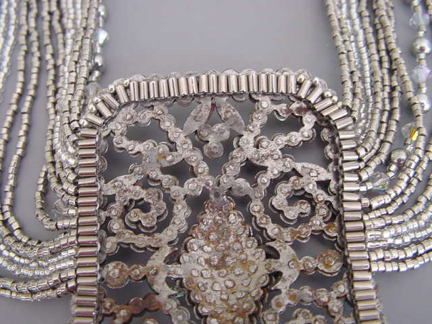 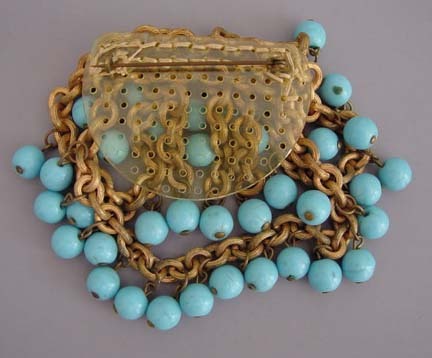 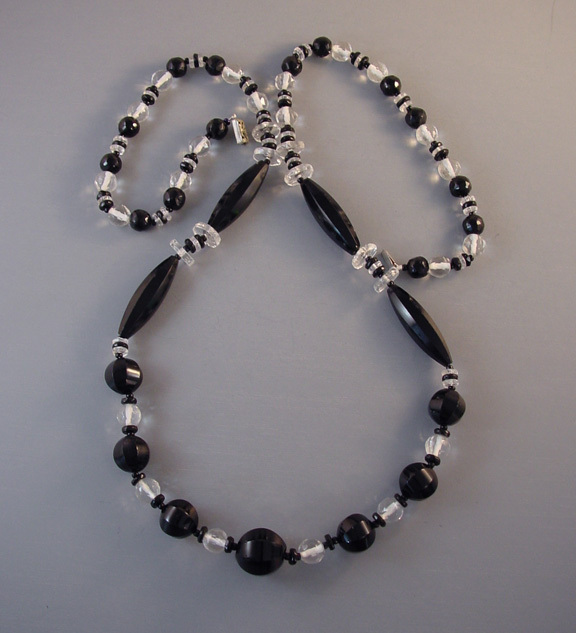 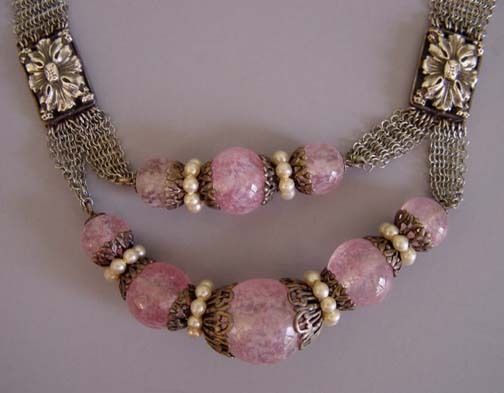 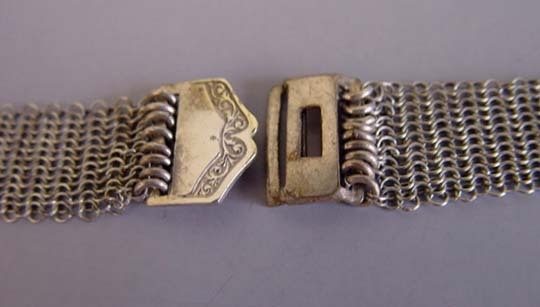 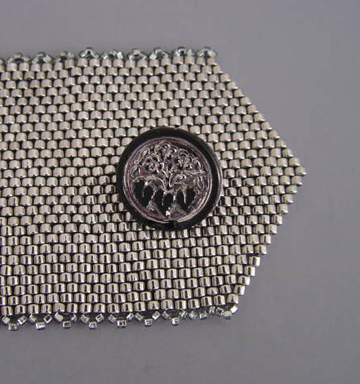 CUT STEEL Victorian buckle is used as the center for a necklace, which is fastened by looped beads. 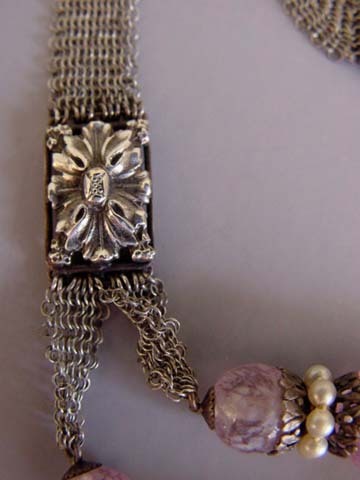 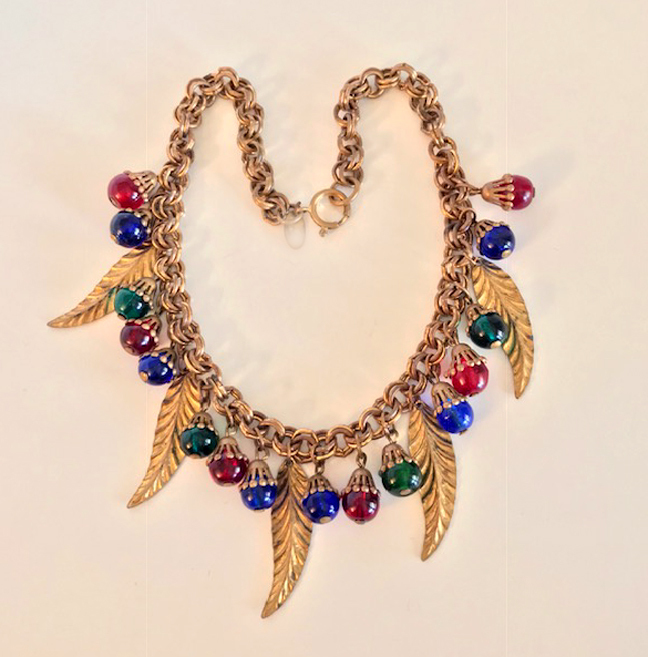 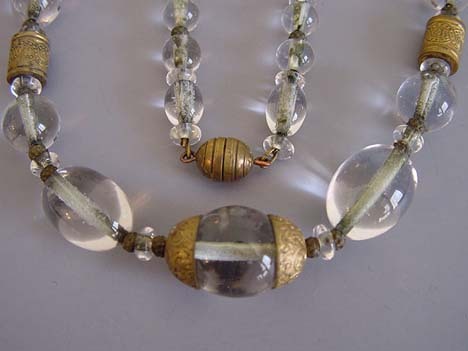 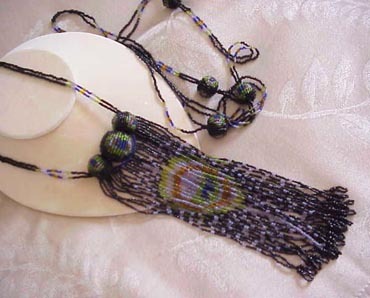 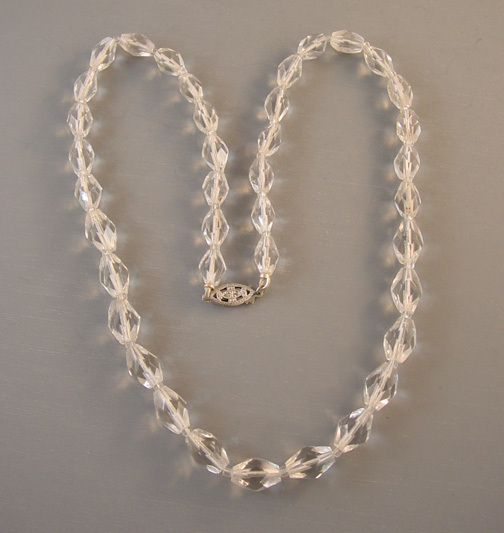 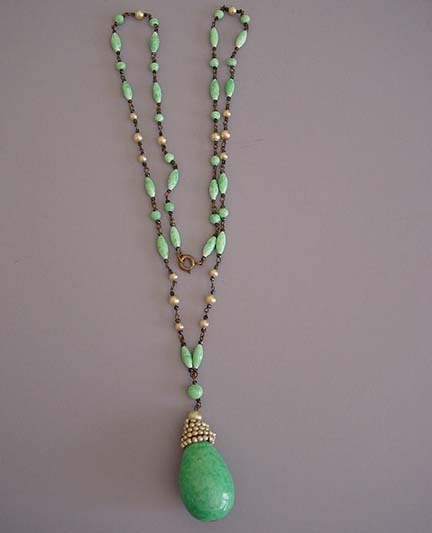 View View View View View This wonderful necklace was made by Janet S.
CUT STEEL Victorian buckle is used as the center for a peyote stitch bracelet, which is fastened by an antique button. 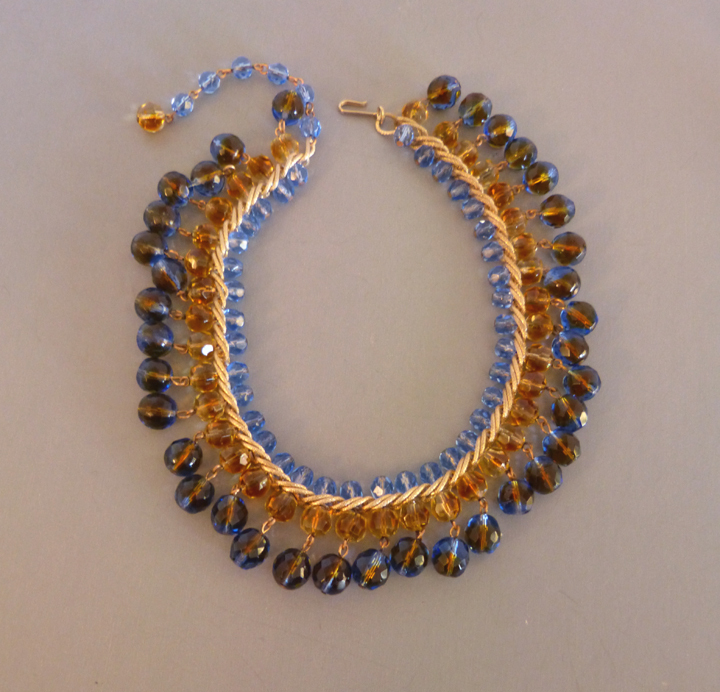 View View View View View This lovely bracelet was made by Janet S.
GLASS glass bead in the most amazing colors and masterfully made. 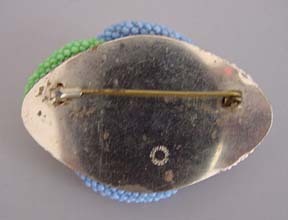 It is 1-1/3" by 1" with a 3/16" hole at each end. 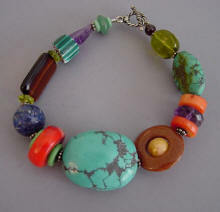 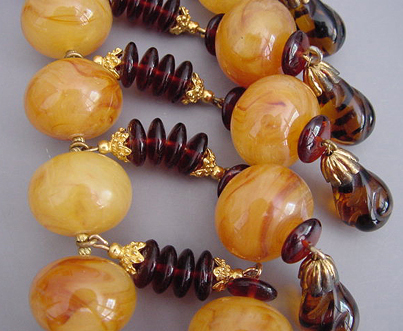 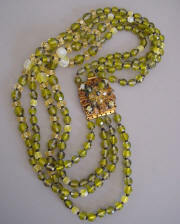 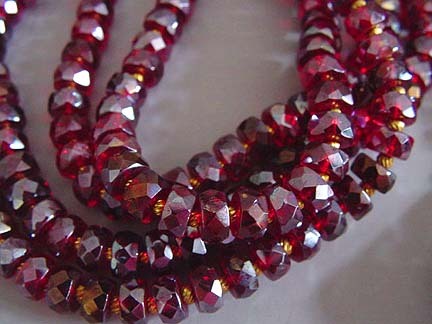 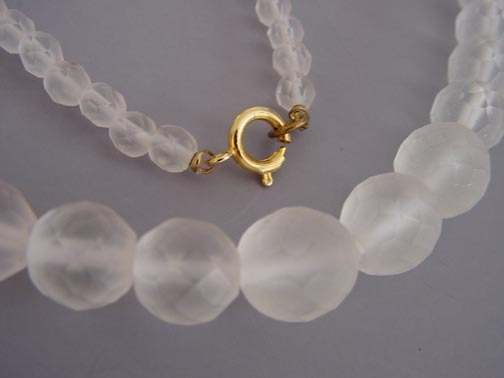 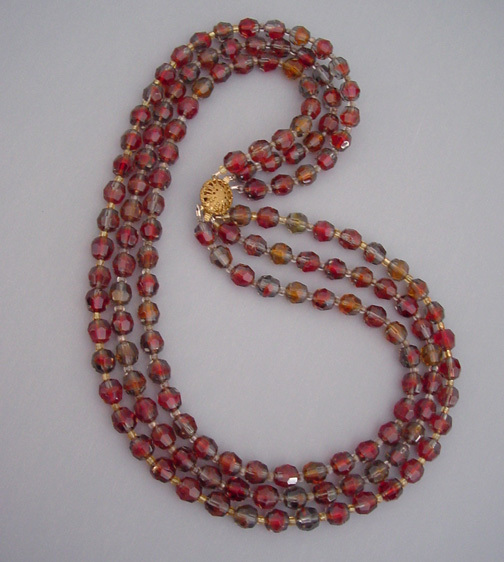 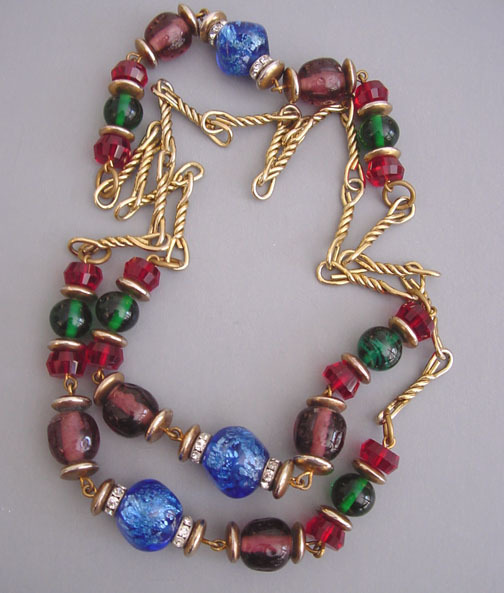 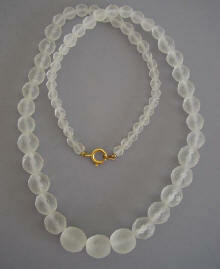 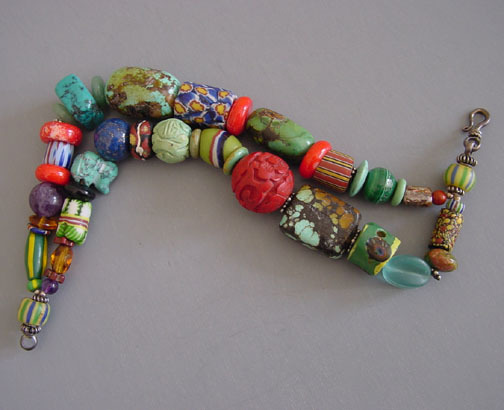 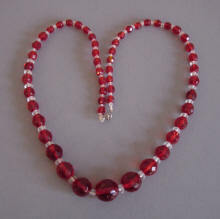 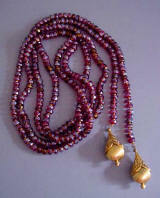 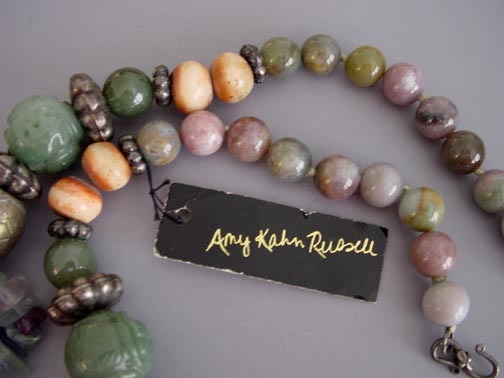 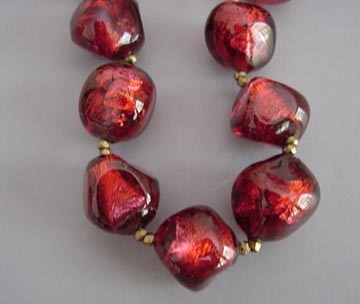 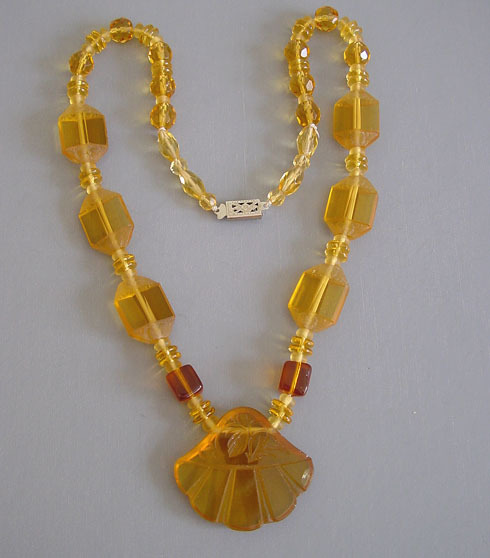 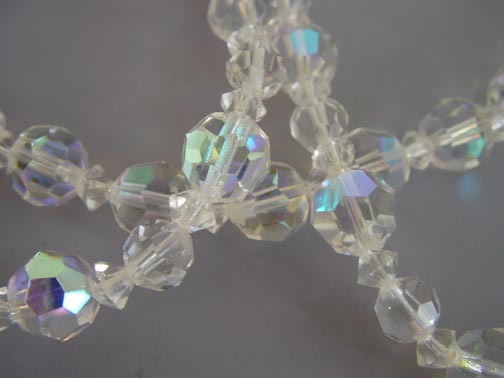 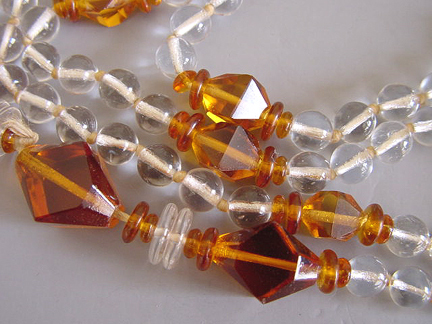 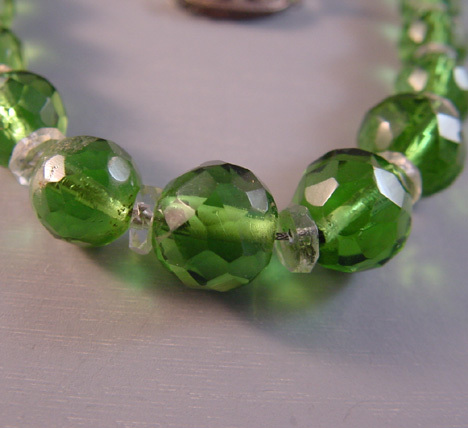 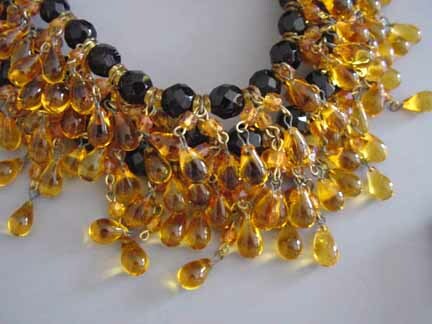 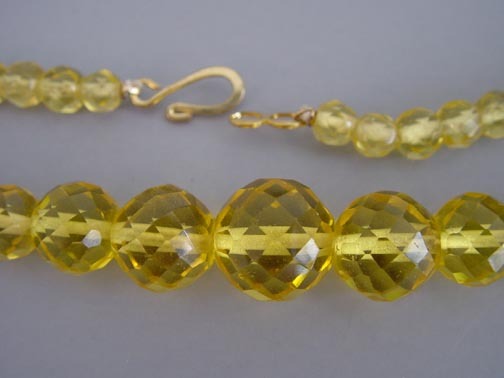 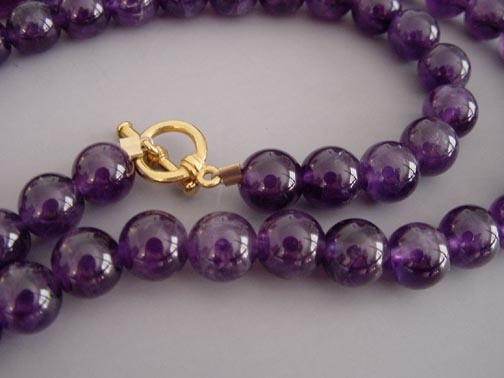 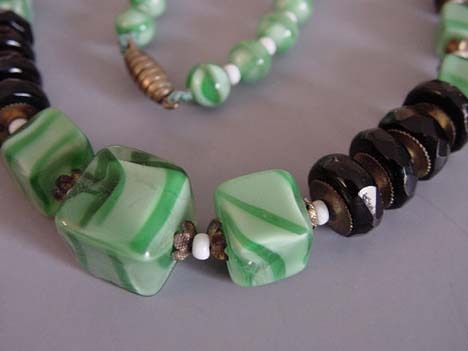 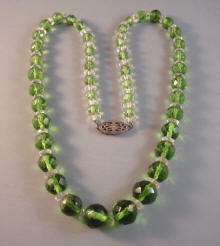 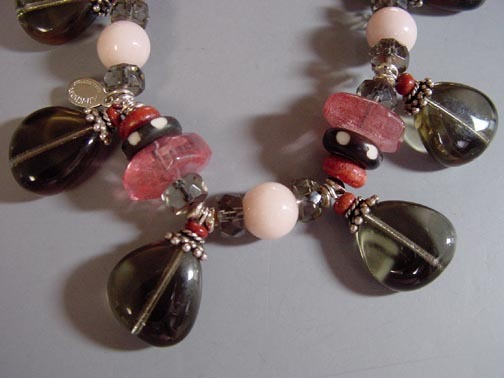 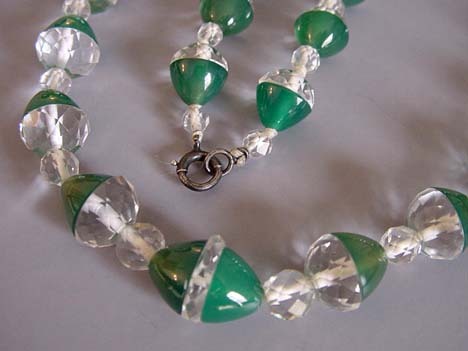 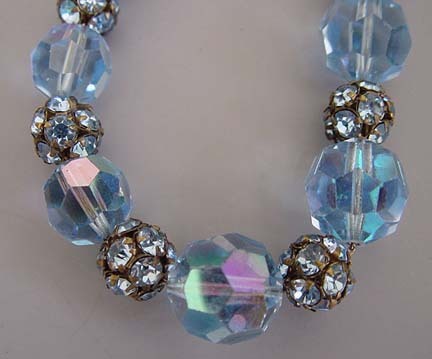 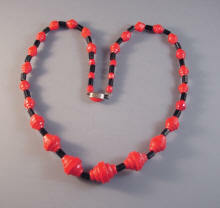 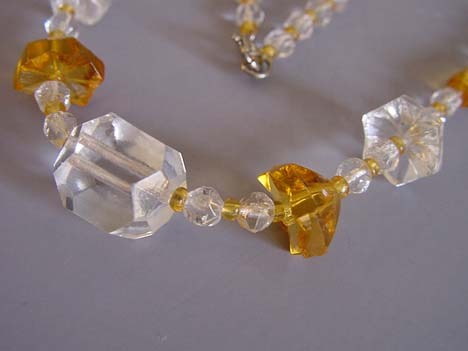 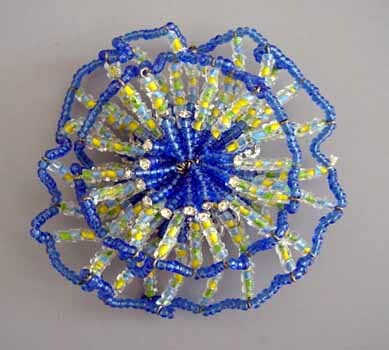 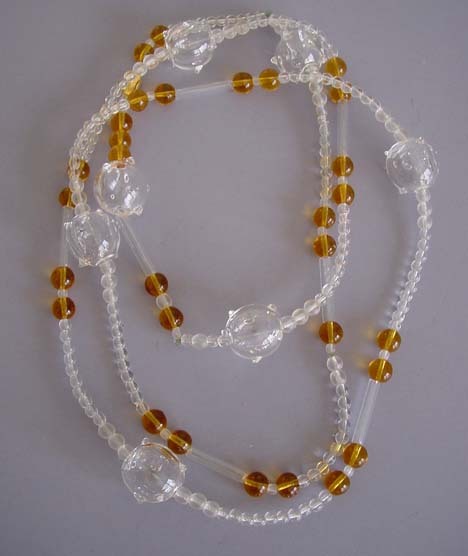 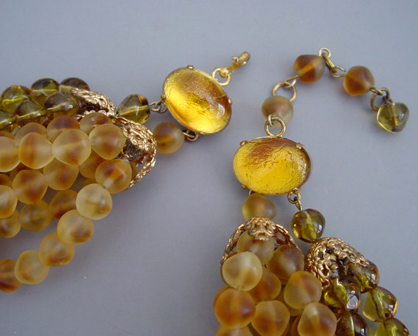 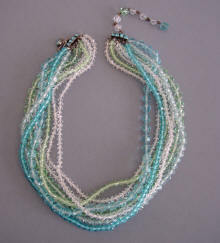 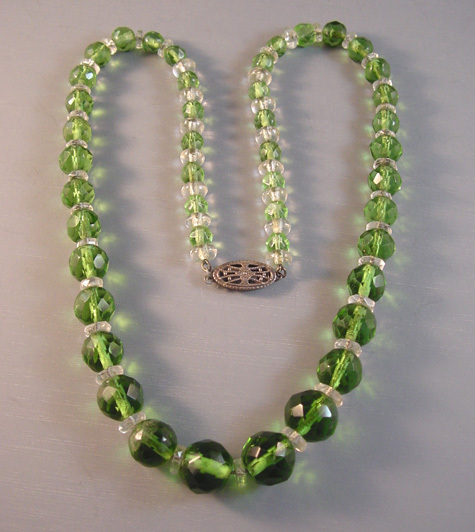 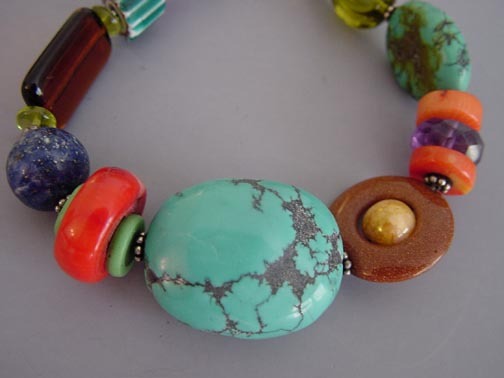 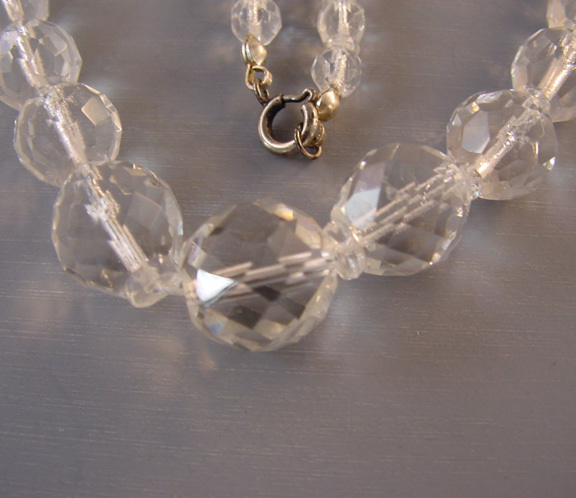 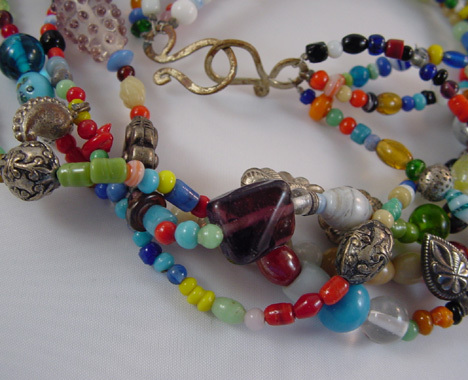 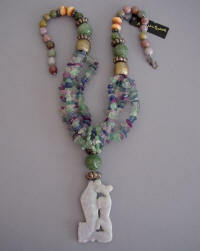 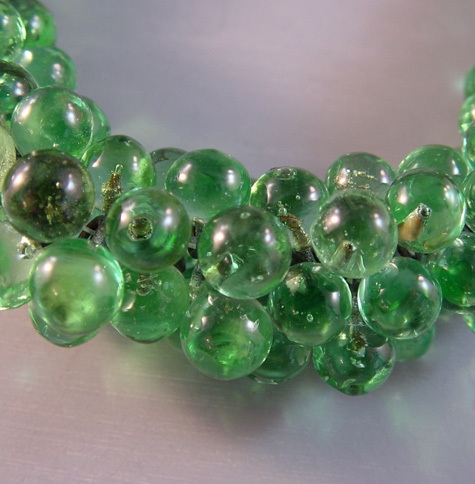 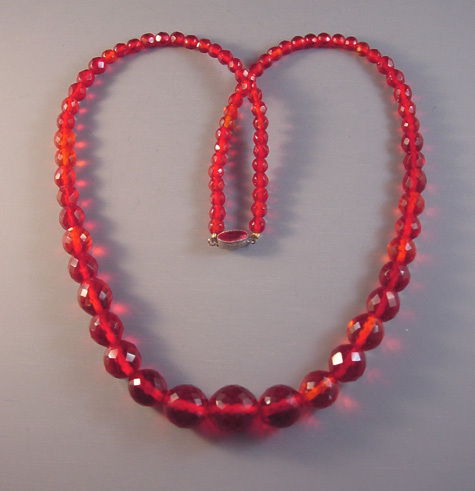 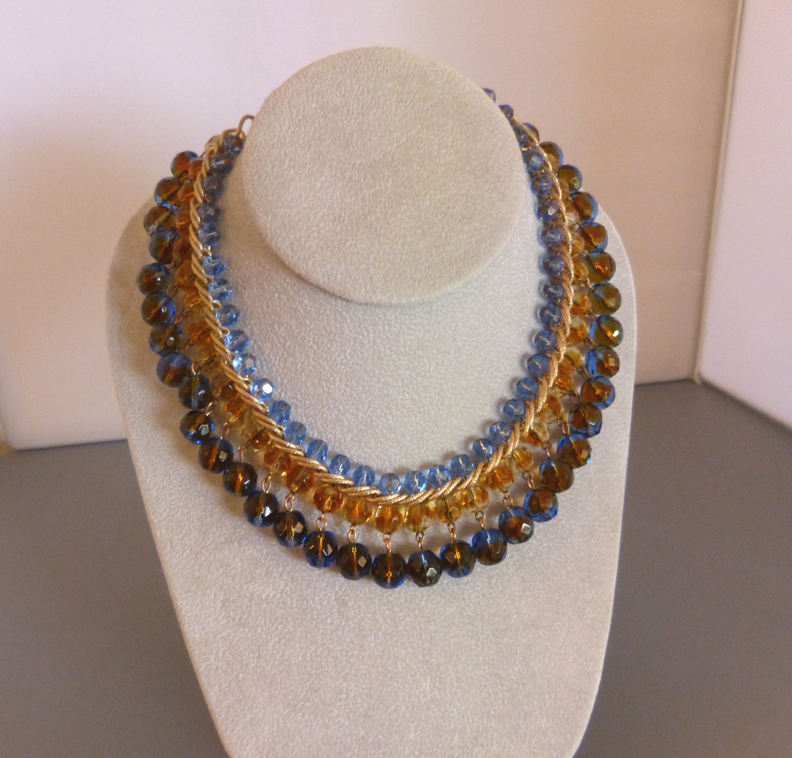 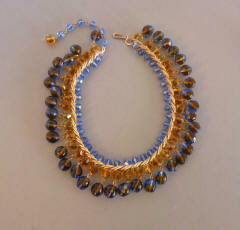 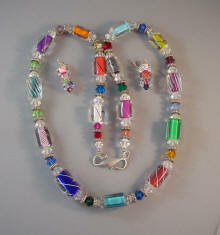 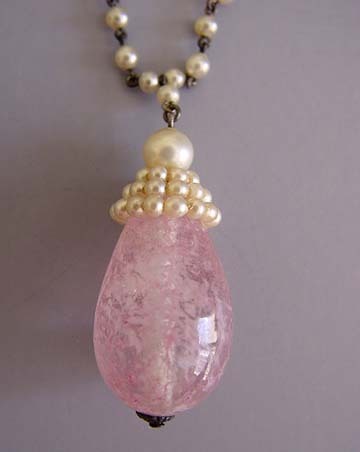 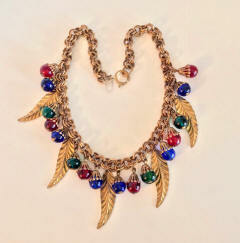 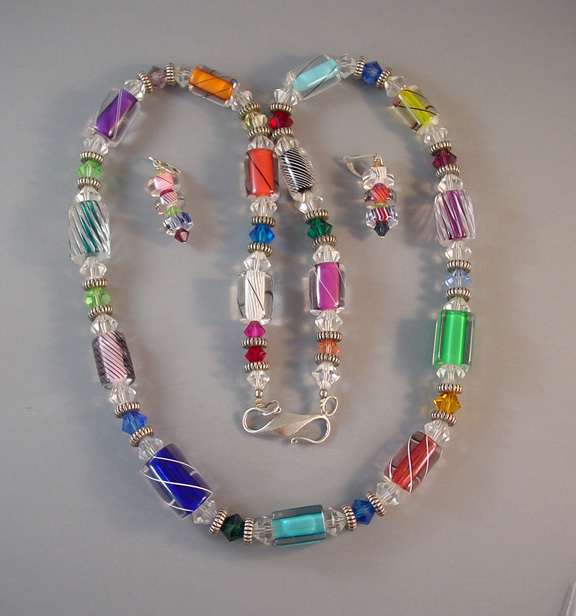 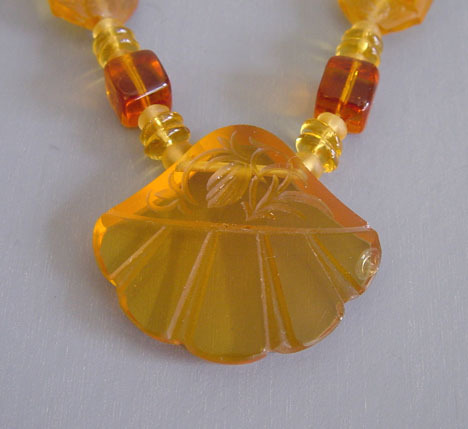 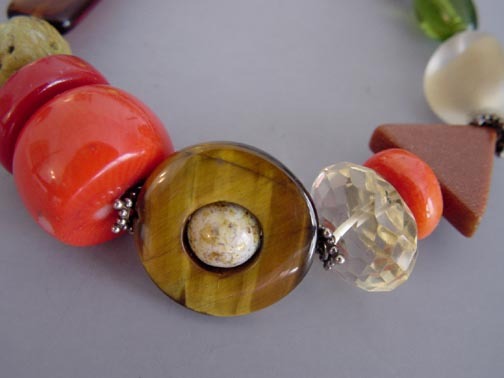 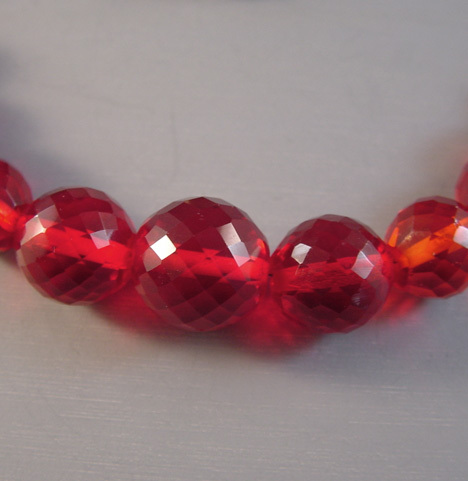 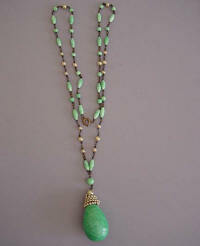 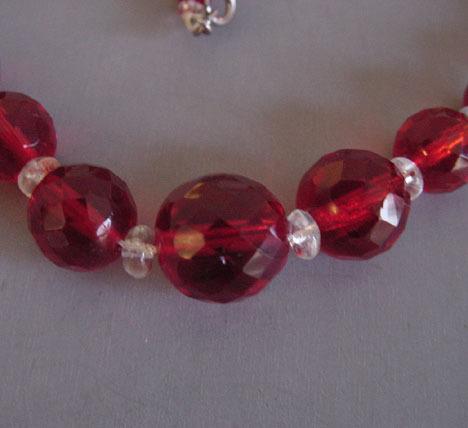 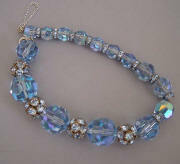 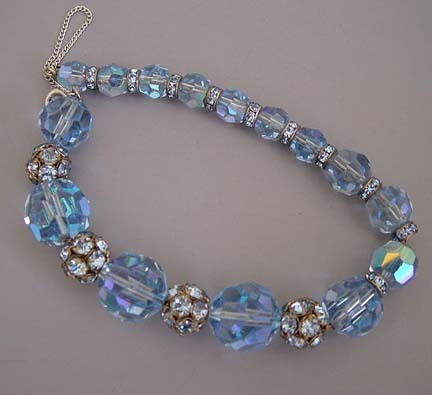 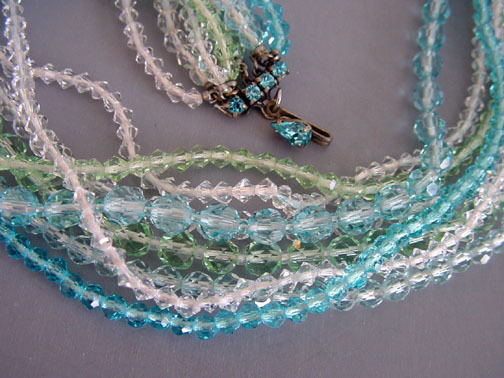 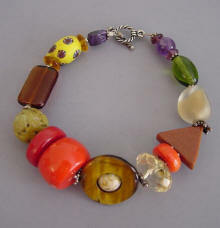 GLASS glass bead in the most amazing colors and masterfully made. 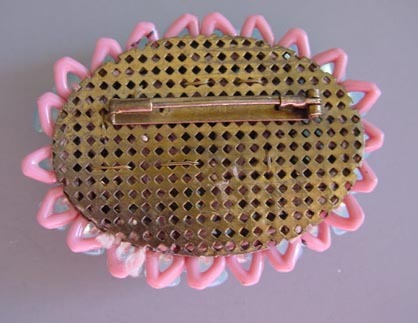 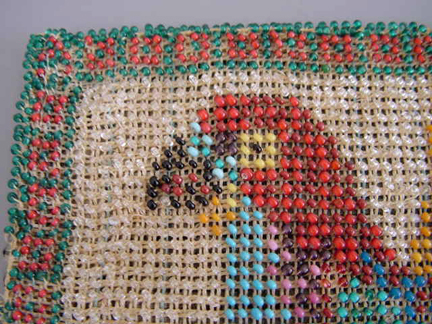 It is 1-1/2" by 1-1/8" with a 3/16" hole at each end. 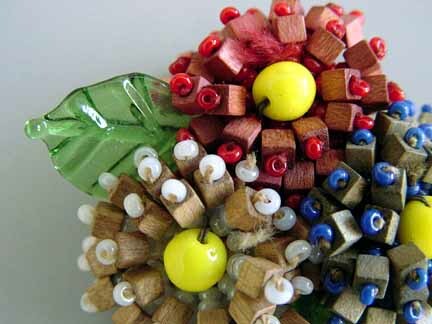 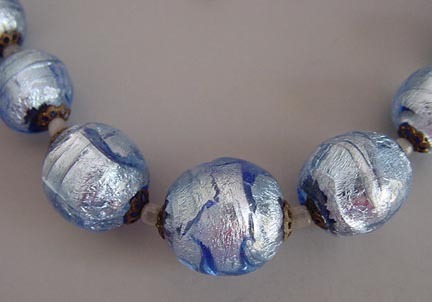 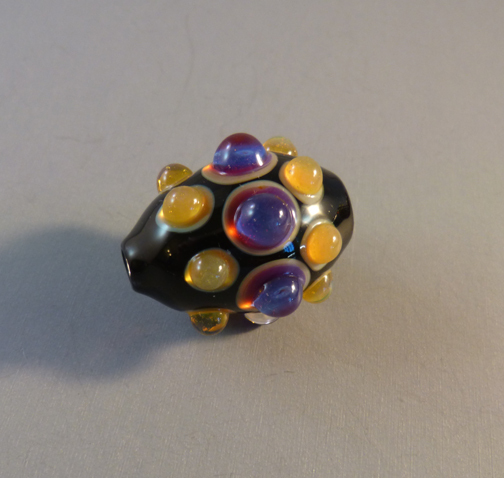 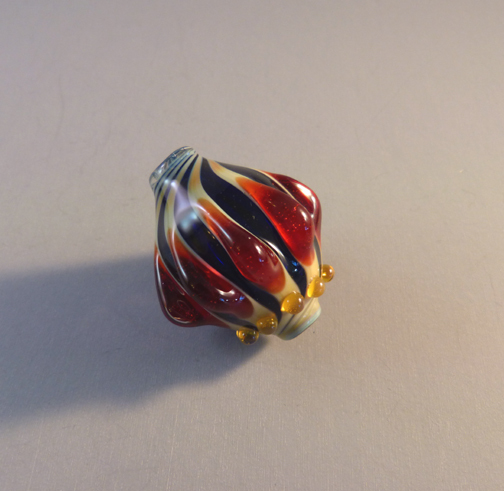 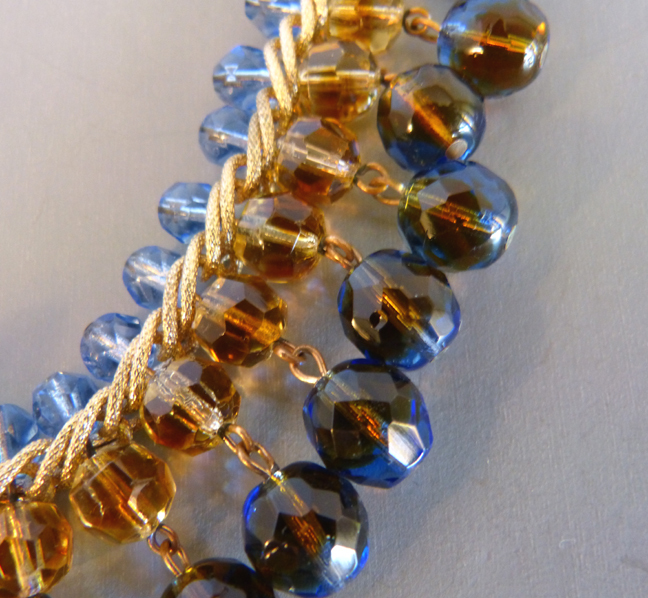 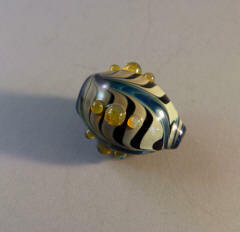 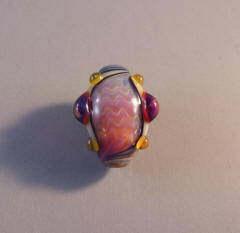 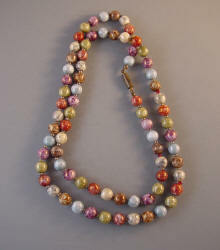 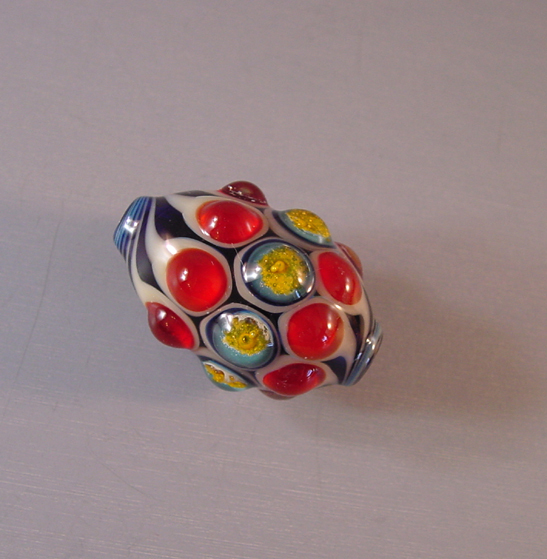 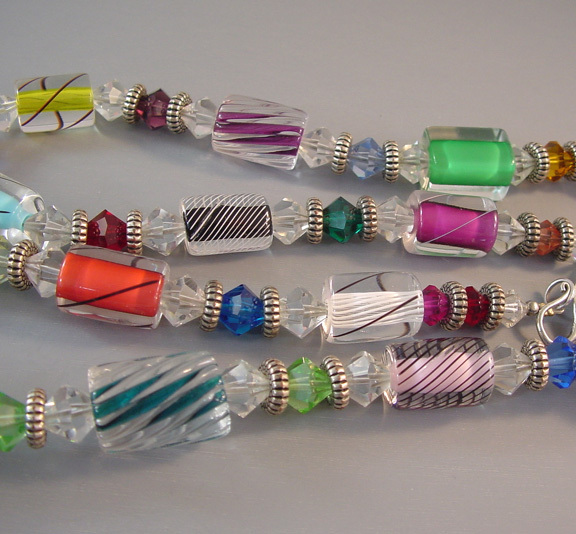 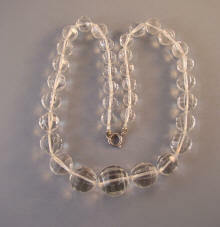 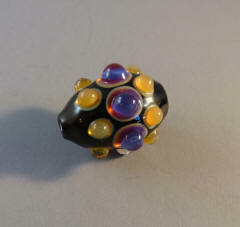 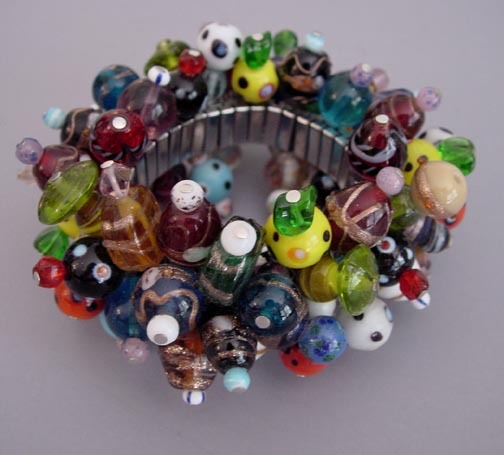 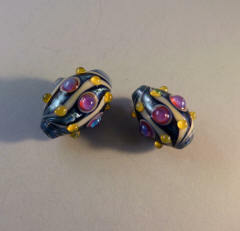 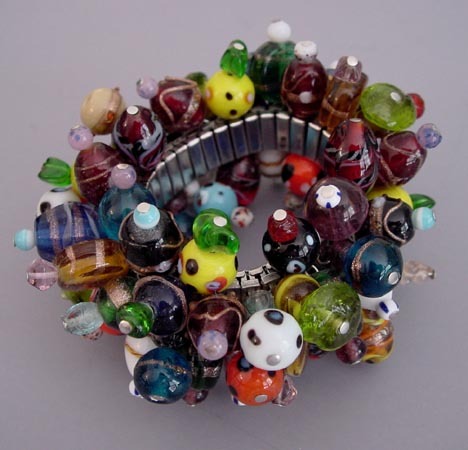 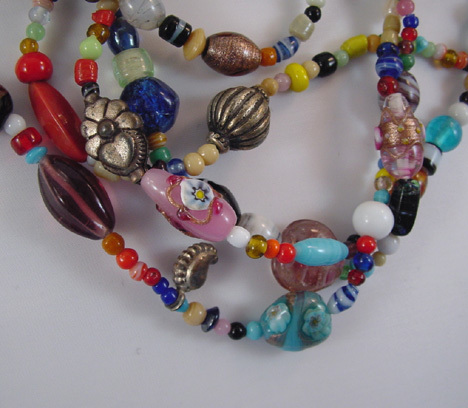 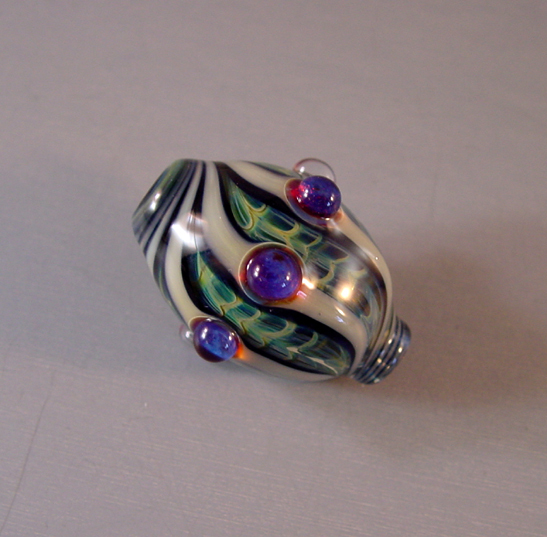 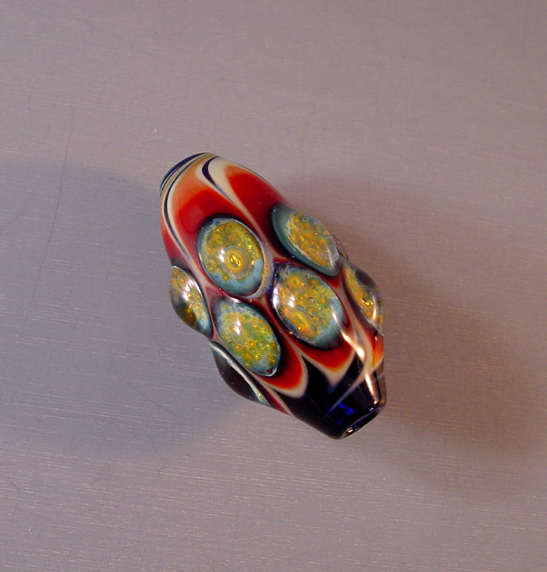 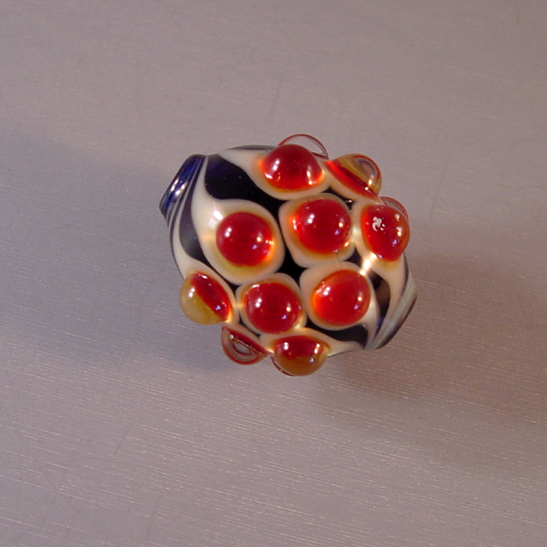 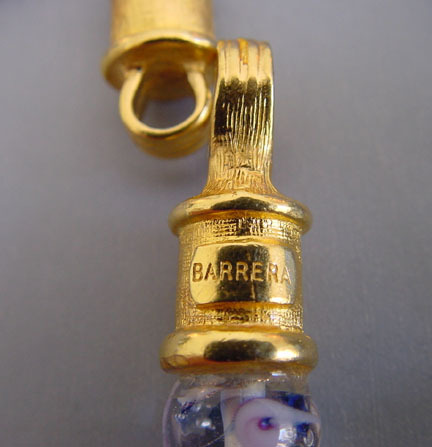 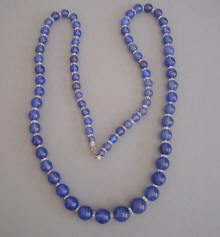 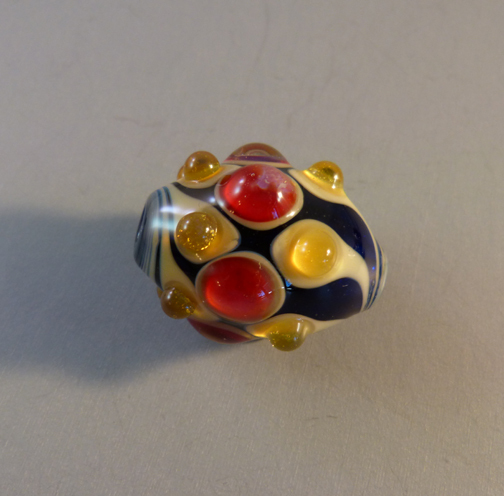 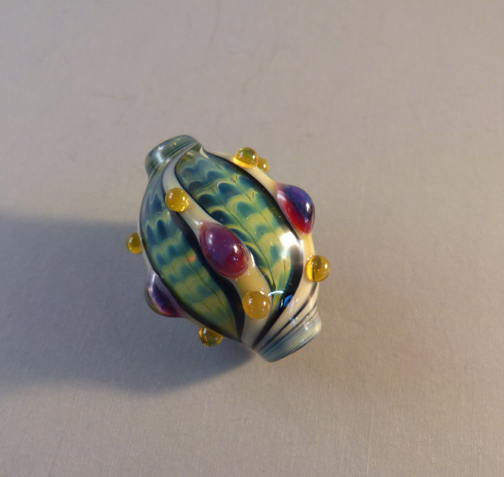 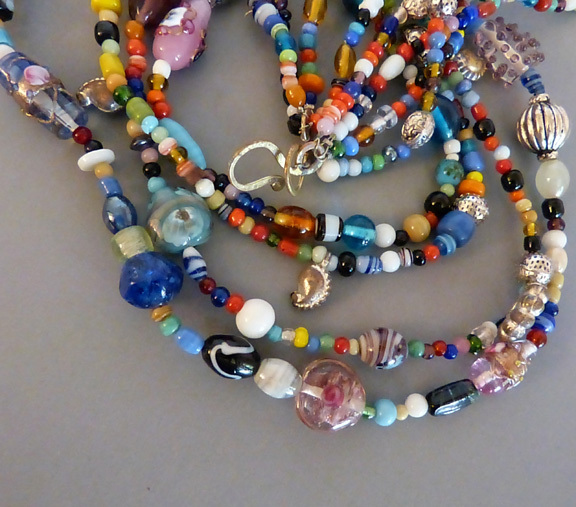 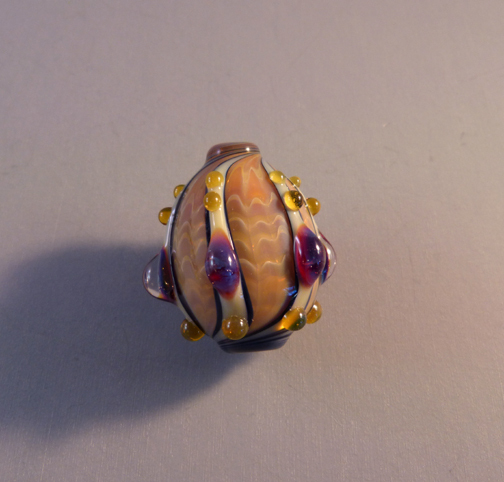 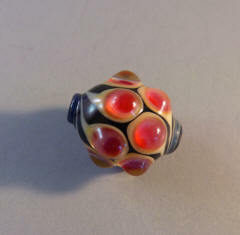 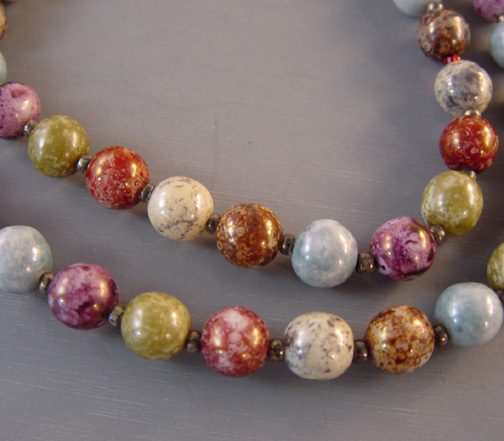 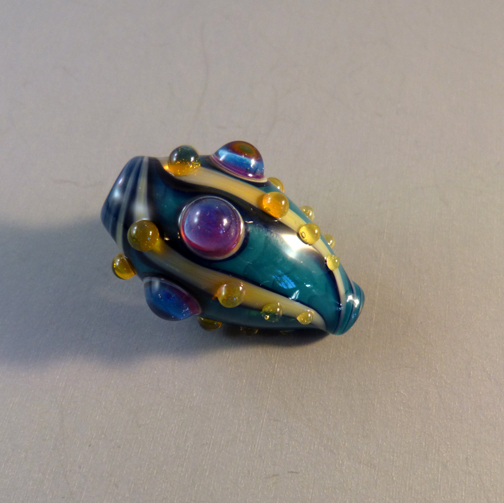 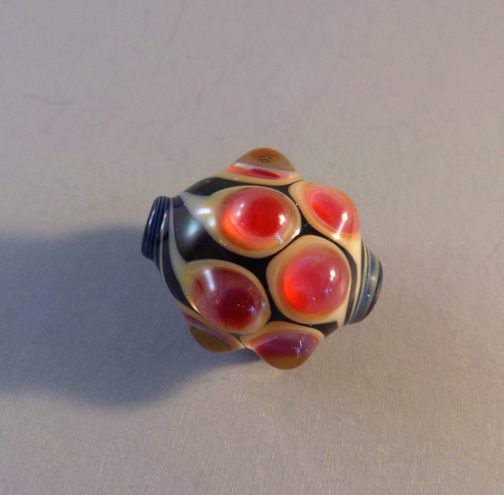 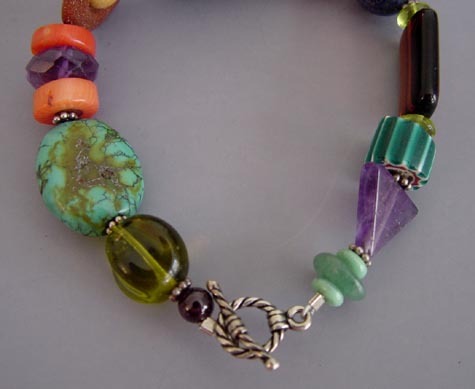 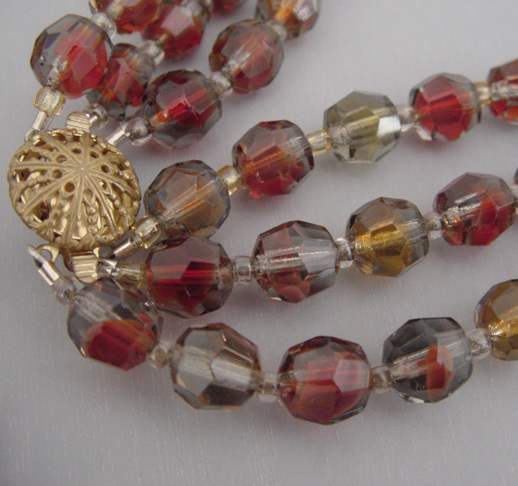 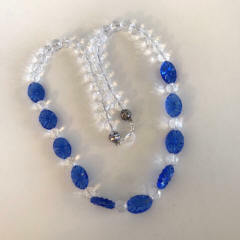 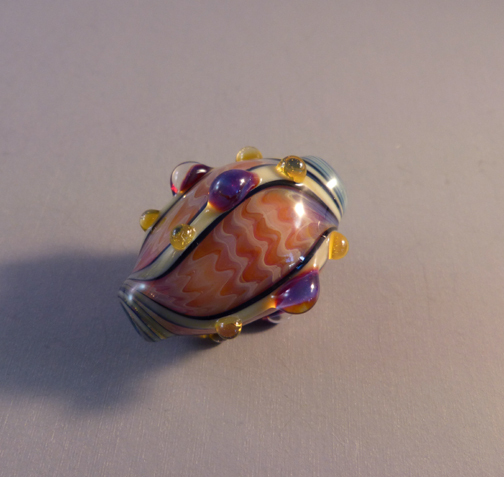 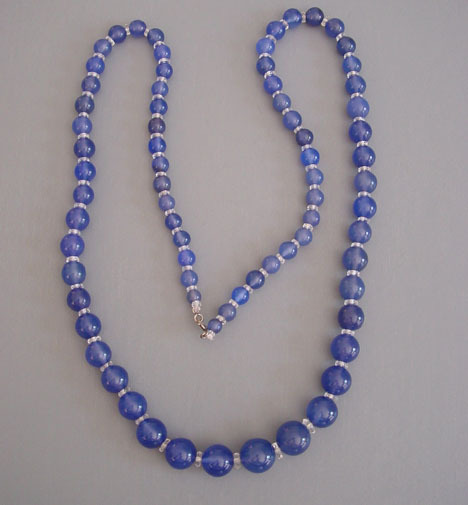 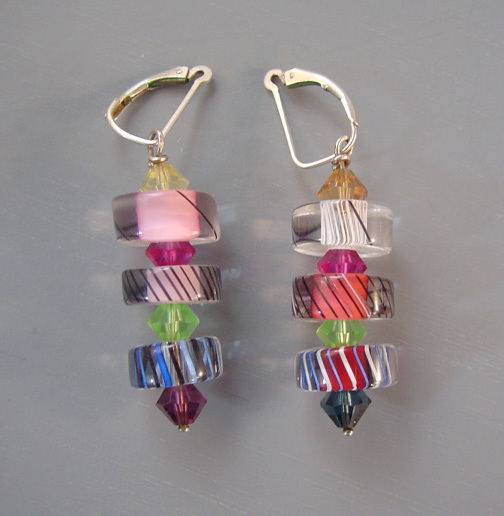 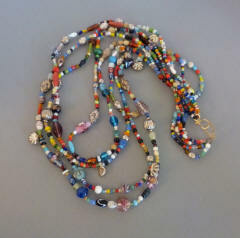 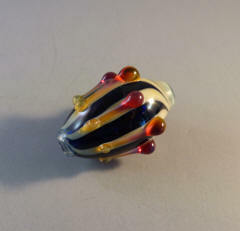 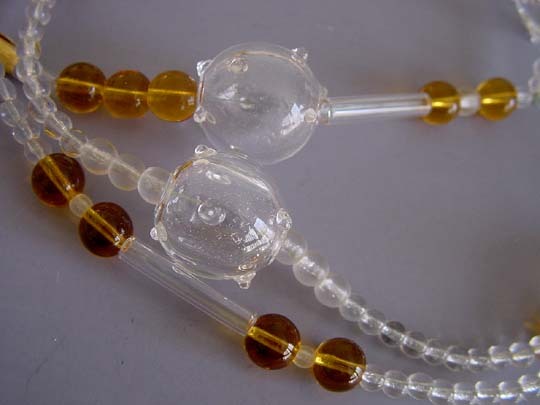 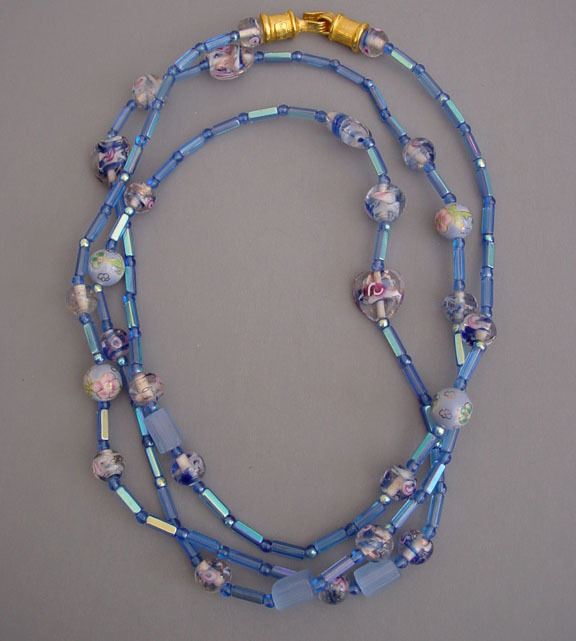 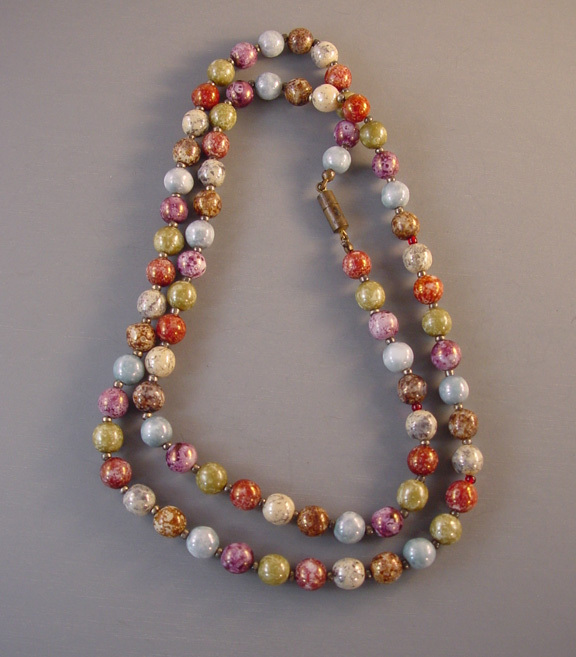 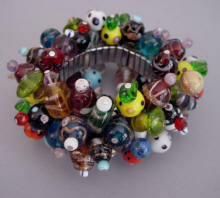 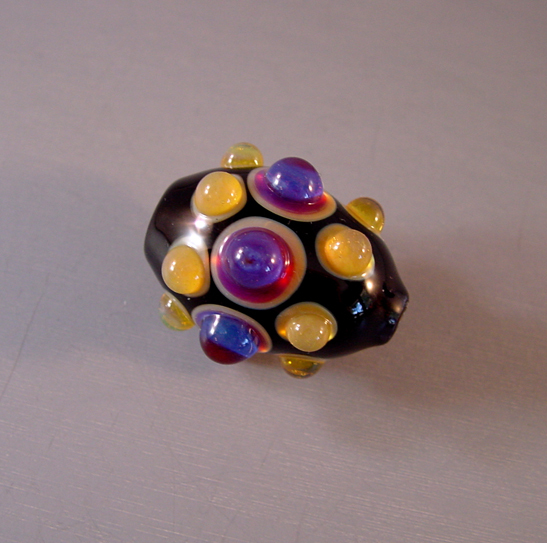 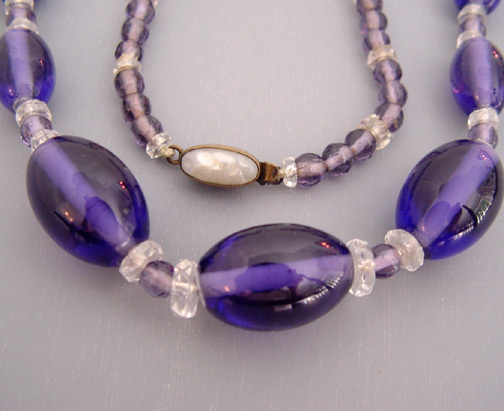 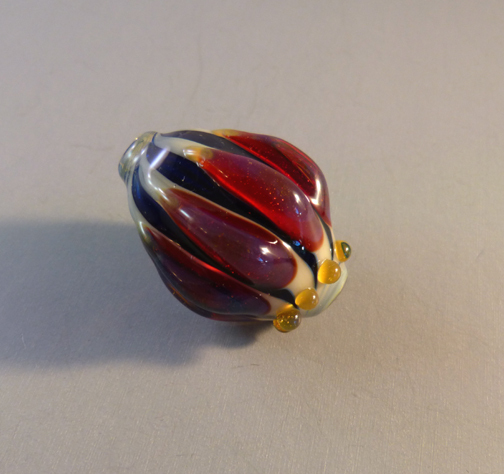 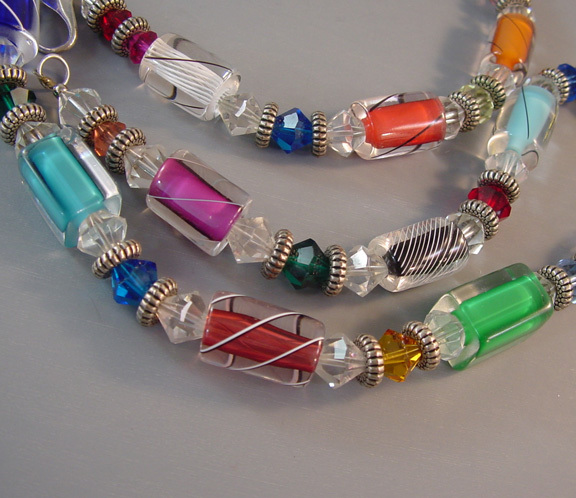 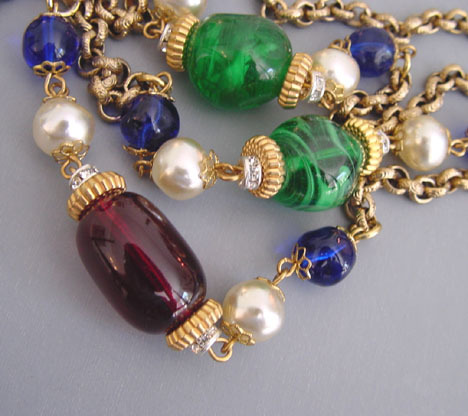 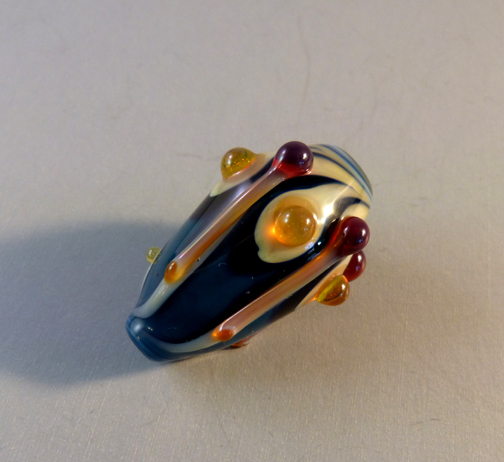 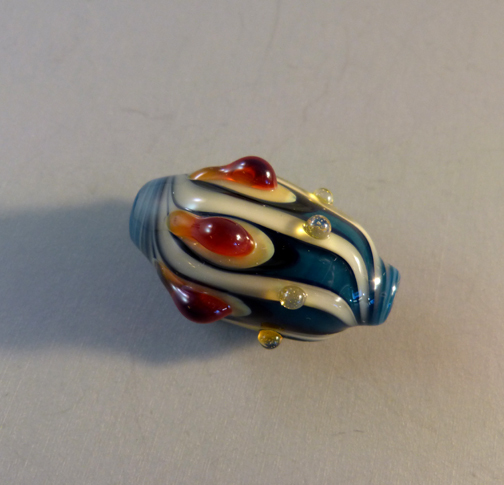 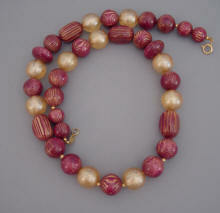 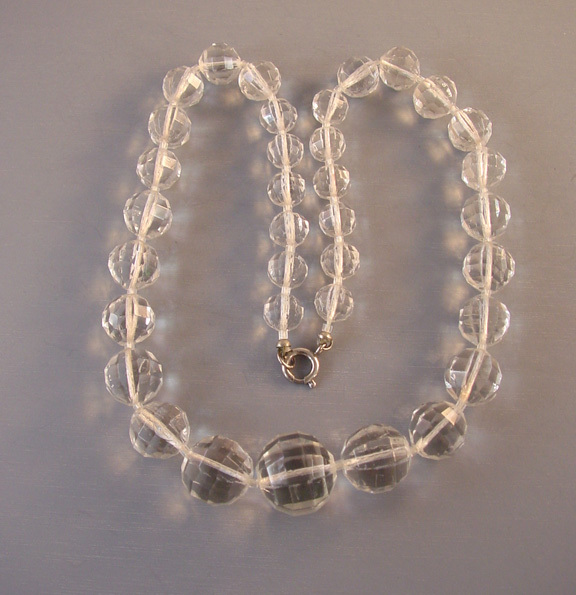 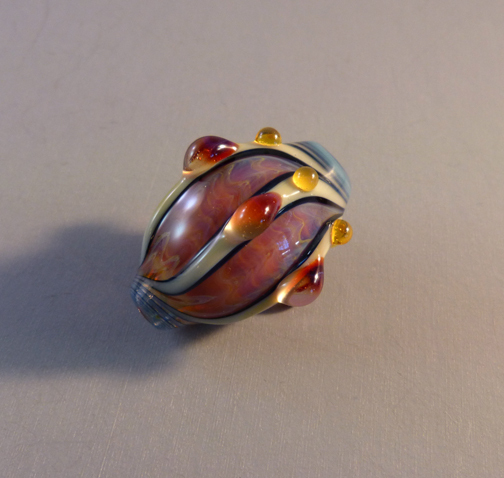 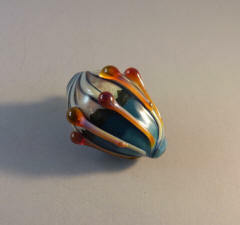 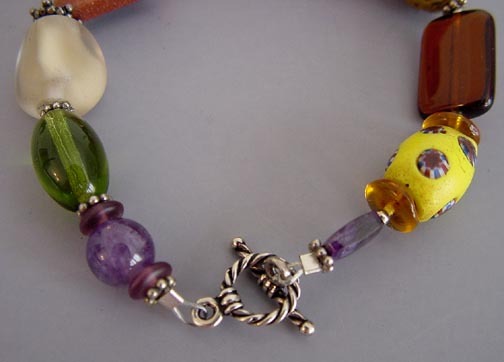 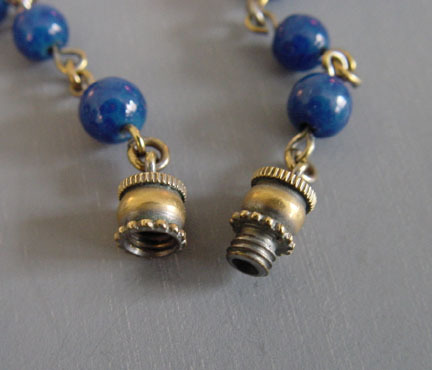 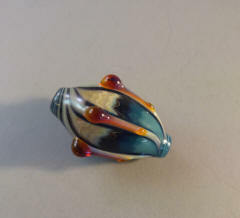 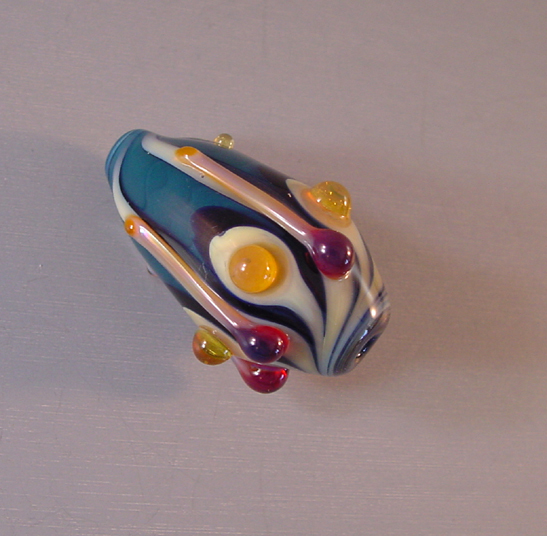 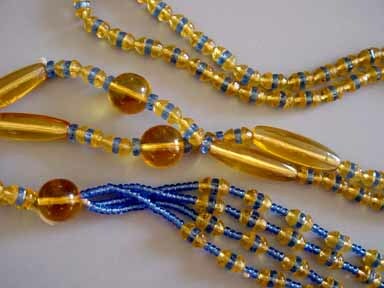 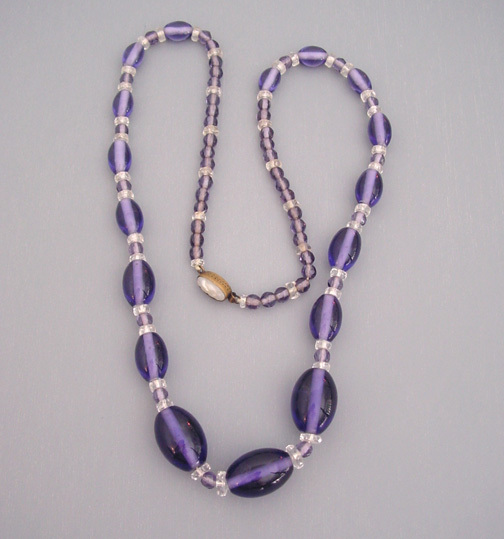 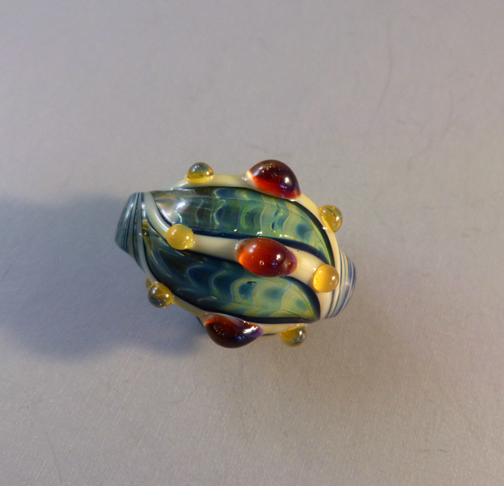 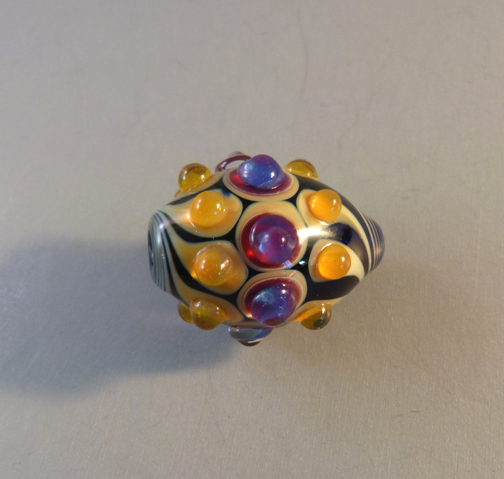 HAND BLOWN glass bead in the most amazing colors and masterfully made, 1-1/2" by 1-1/8" with a 1/8" hole in each end. 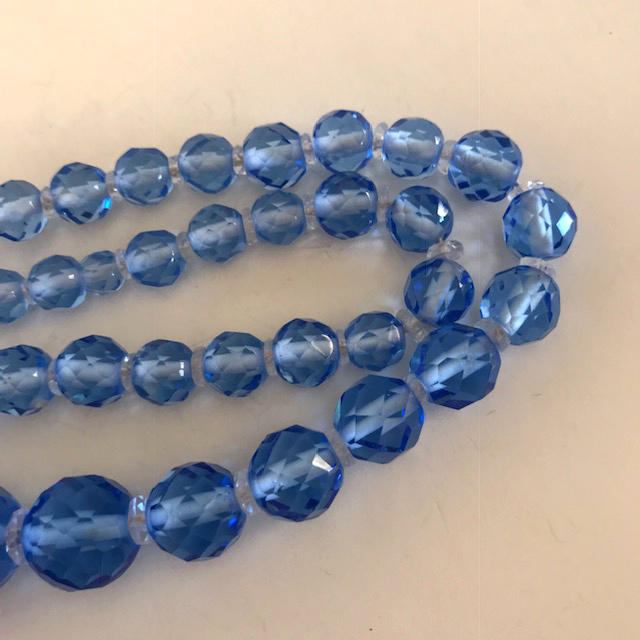 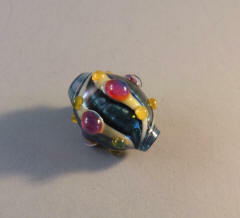 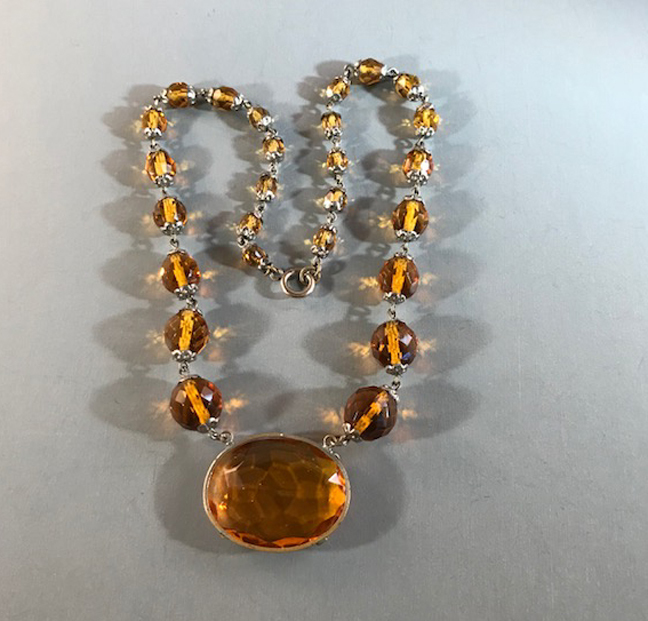 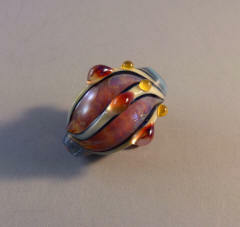 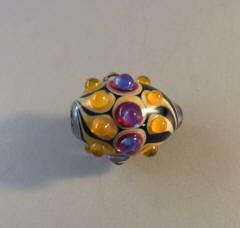 GLASS glass bead in the most amazing colors and masterfully made, 1-1/3" long by 1-1/4" wide with a 3/16" hole at each end. 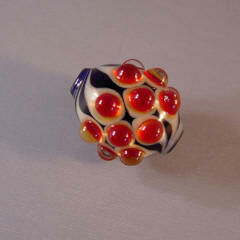 GLASS glass bead in the most amazing colors and masterfully made. 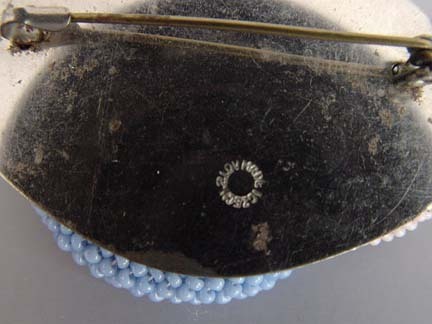 It is 1-1/2" by 1/-1/8" with a 1/8" hole in each end. 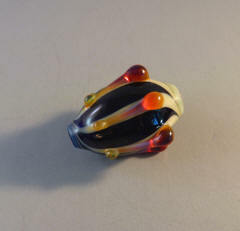 GLASS colorful hand blown bead, 1-1/2" by 7/8" with a 1/8" hole in each end. 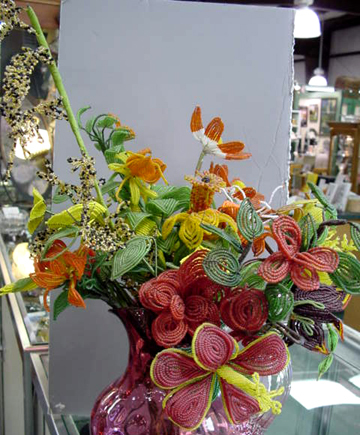 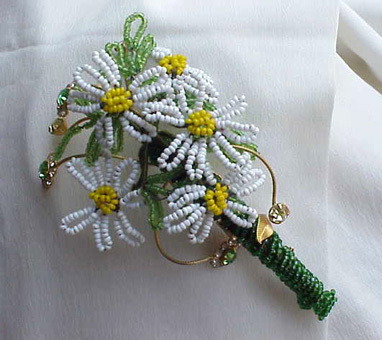 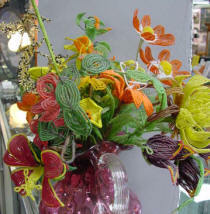 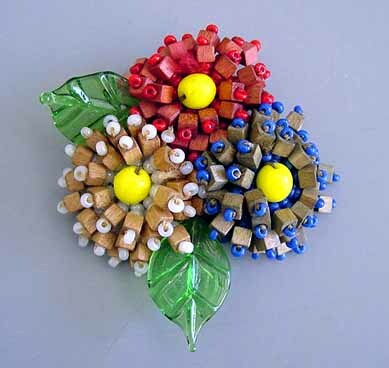 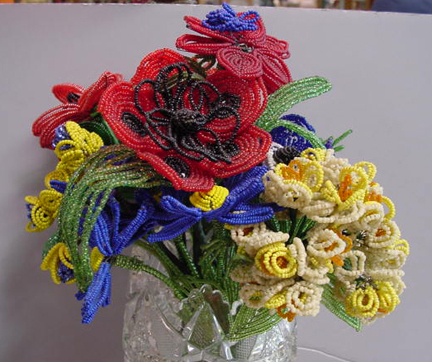 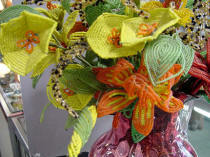 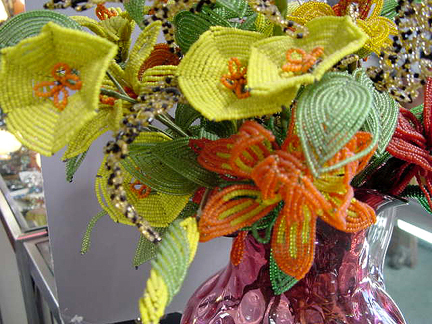 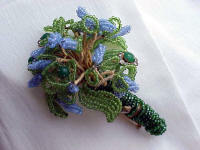 COLORFUL hand beaded flower bouquet.